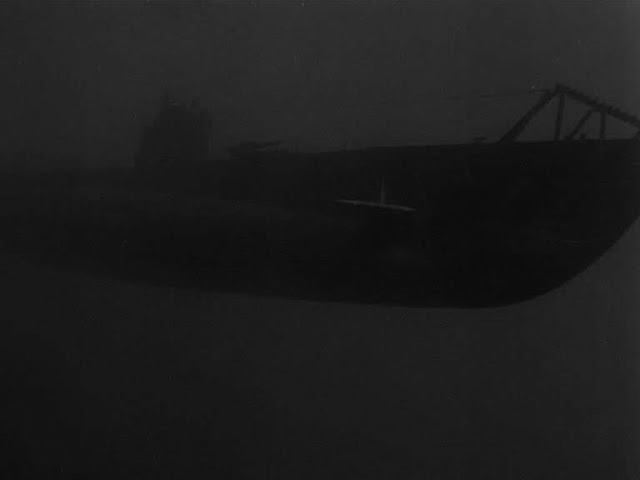 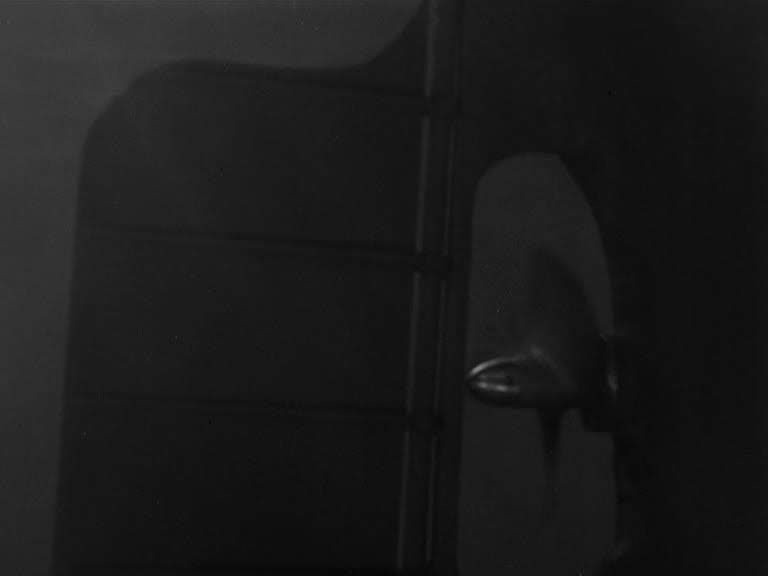 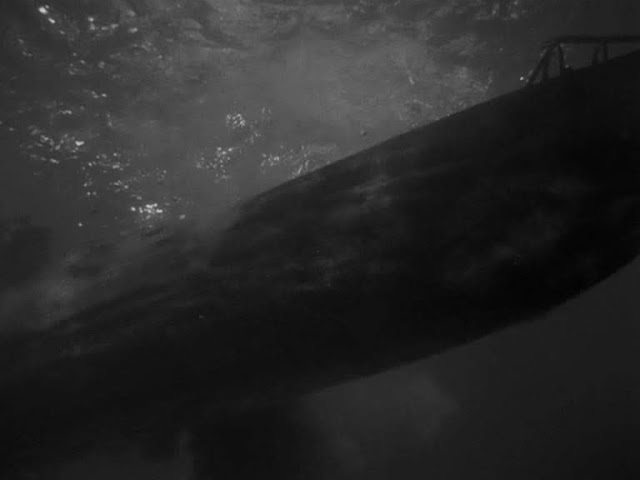 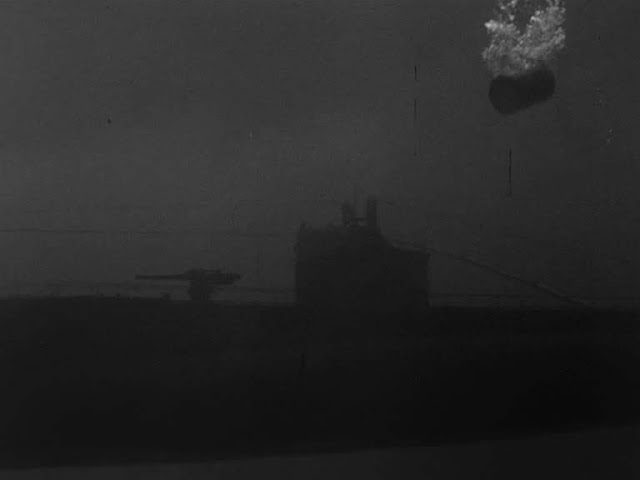 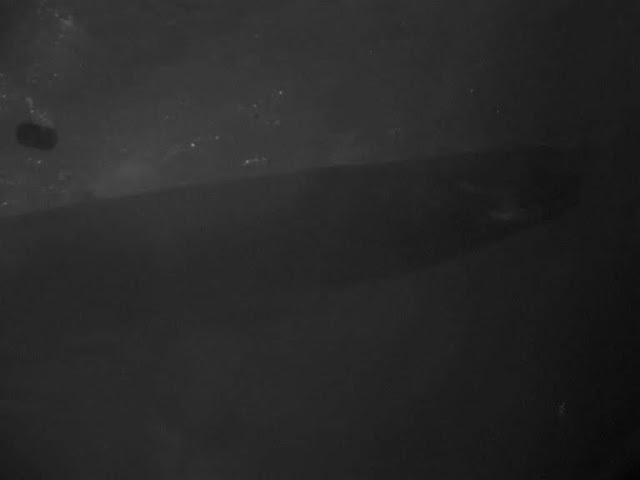 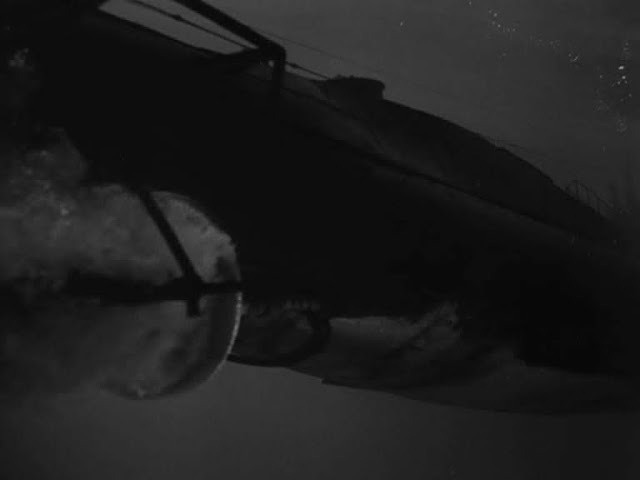 This movie has more model ship action per foot of film than than perhaps any other movie ever made. 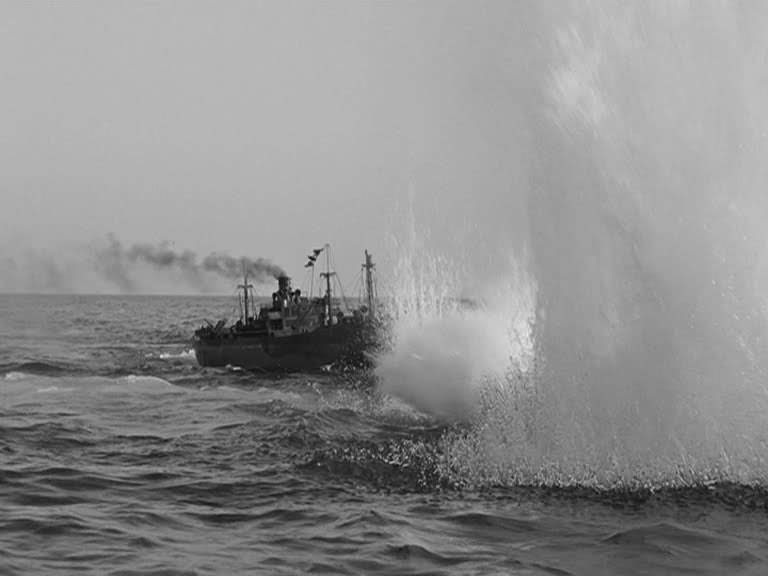 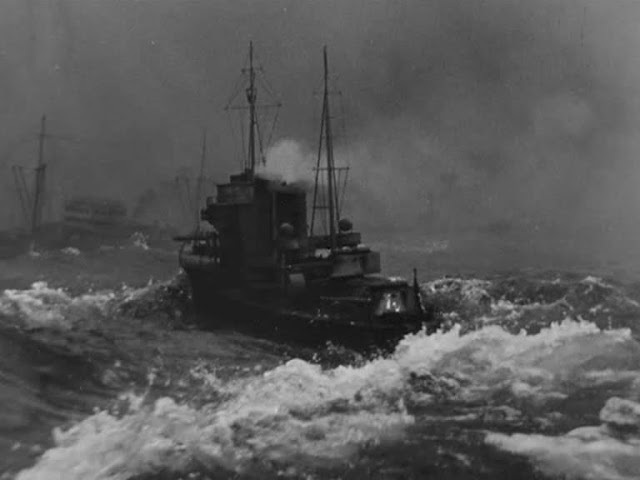 It was conceived during the second World war to hi-light the contribution to the war effort of the merchant navy. 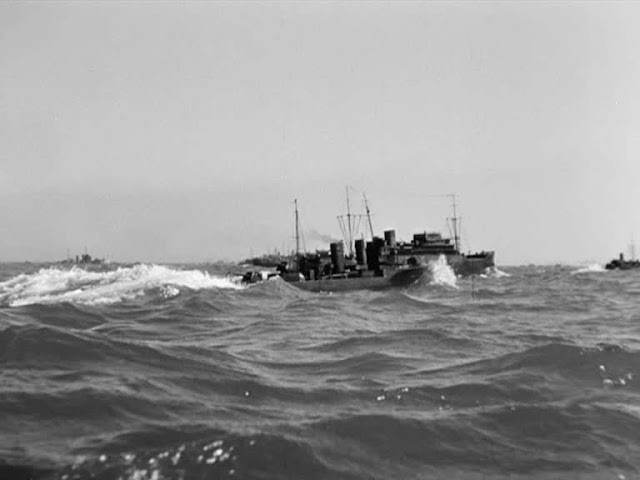 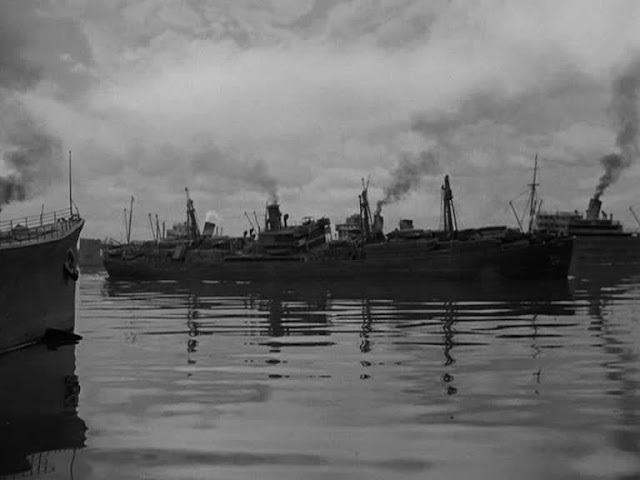 Like many films of the period, it relies heavily on miniatures to tell the story, it not being possible to film on any real ships as they were all otherwise engaged. 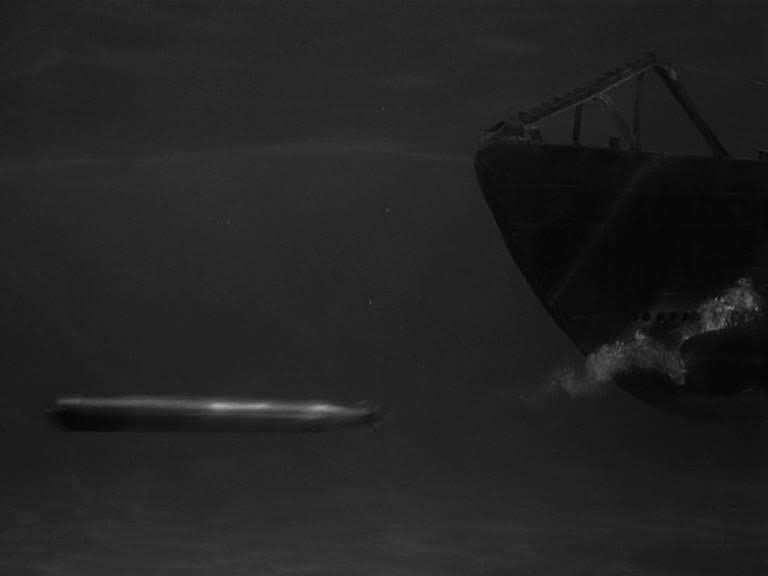 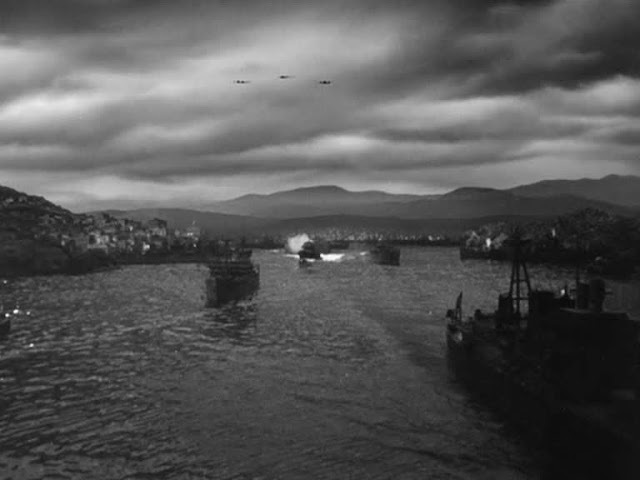 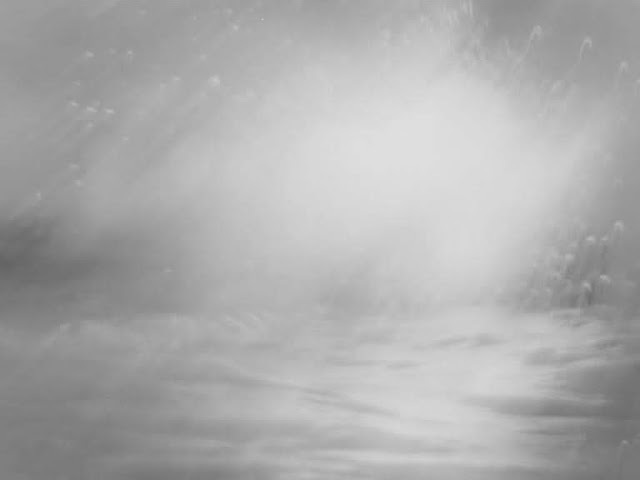 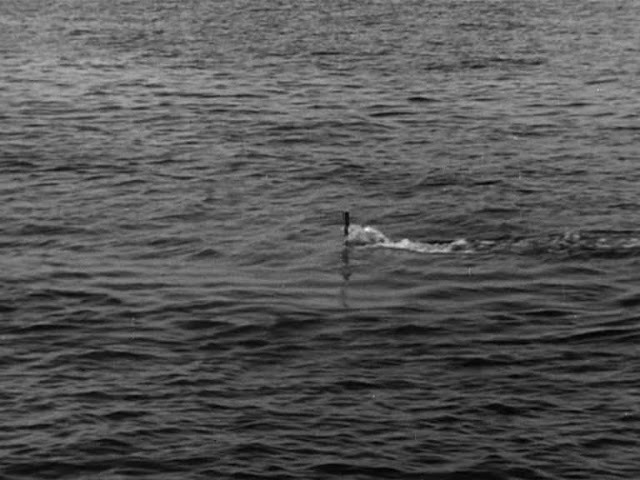 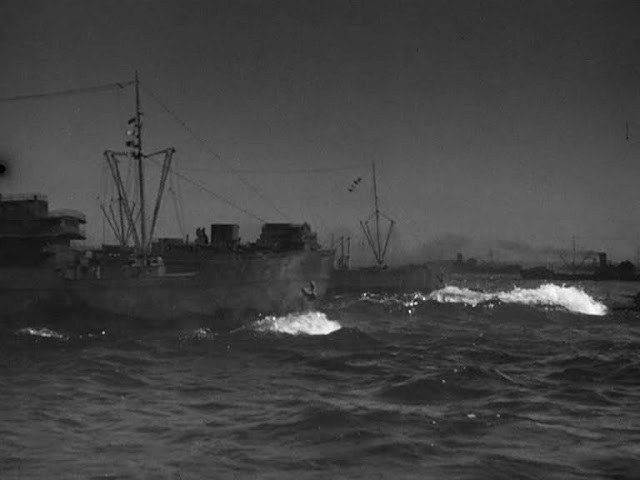 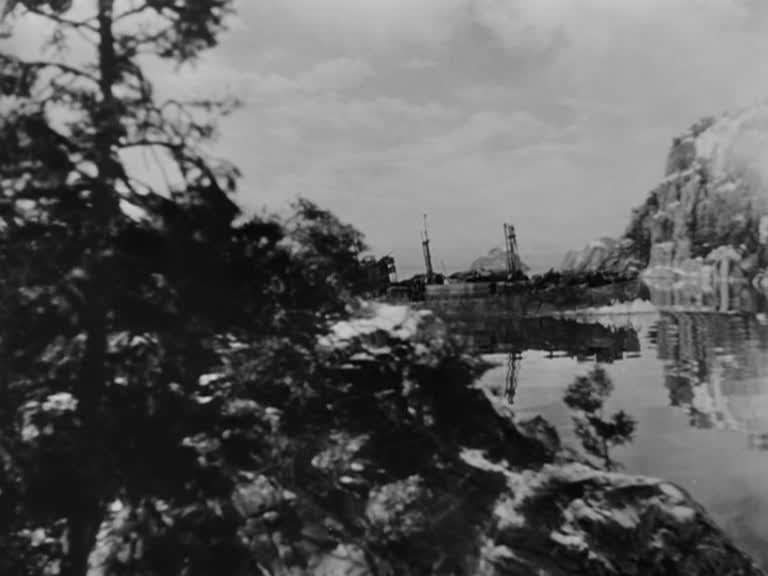 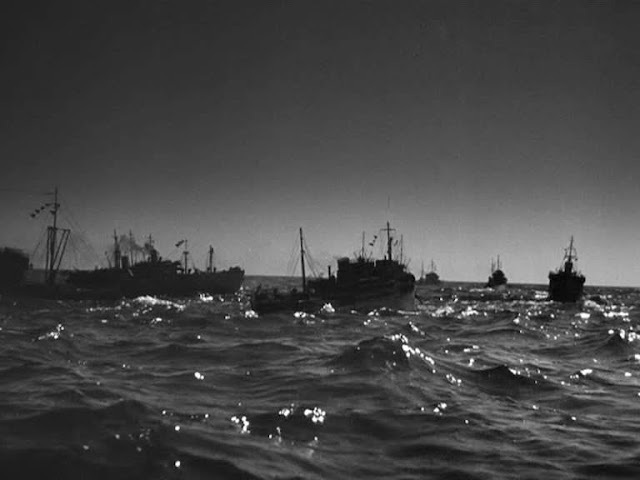 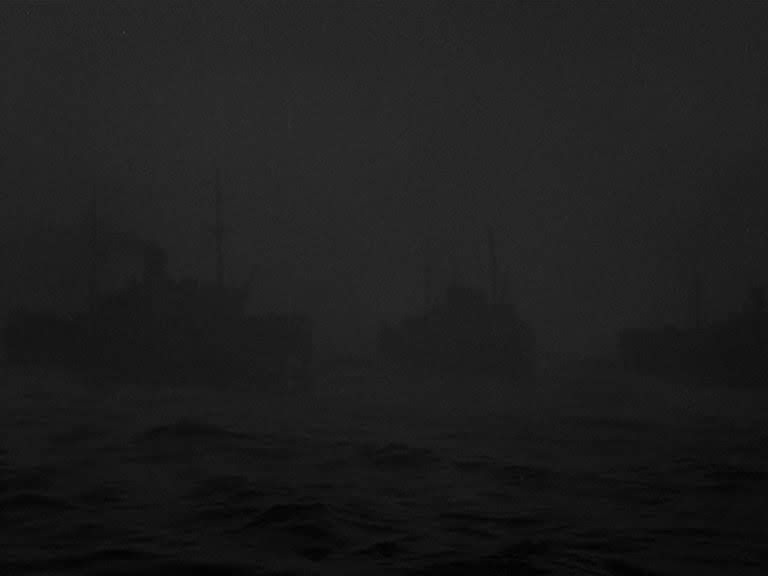 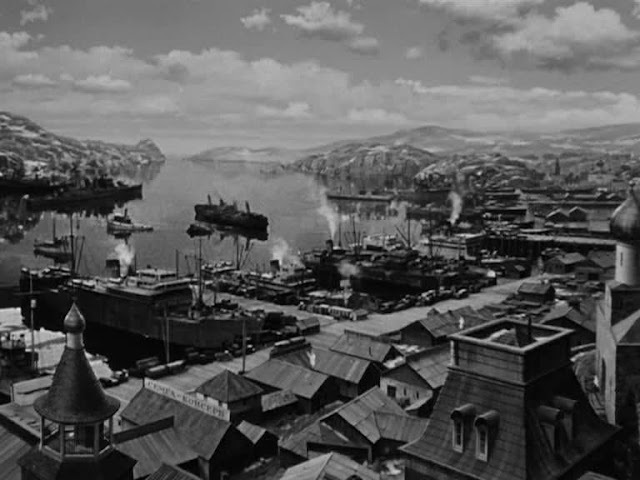 The miniatures were filmed using a real horizon in Santa Barbara harbor. 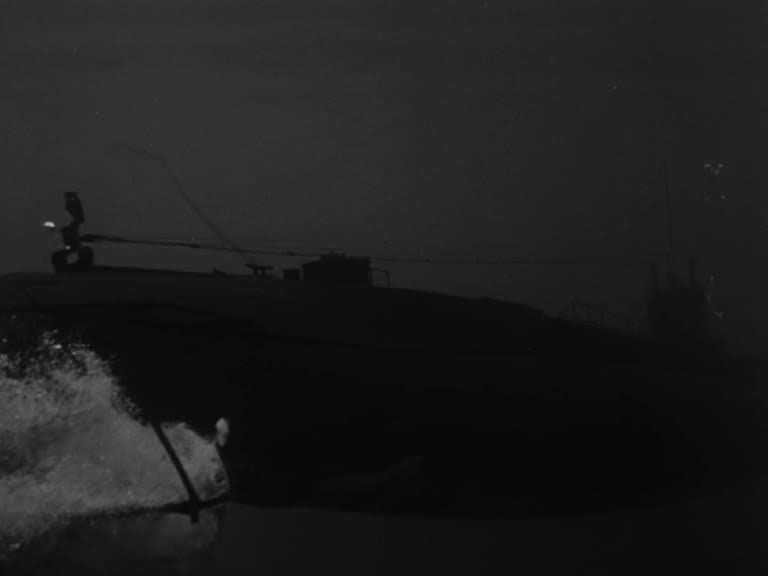 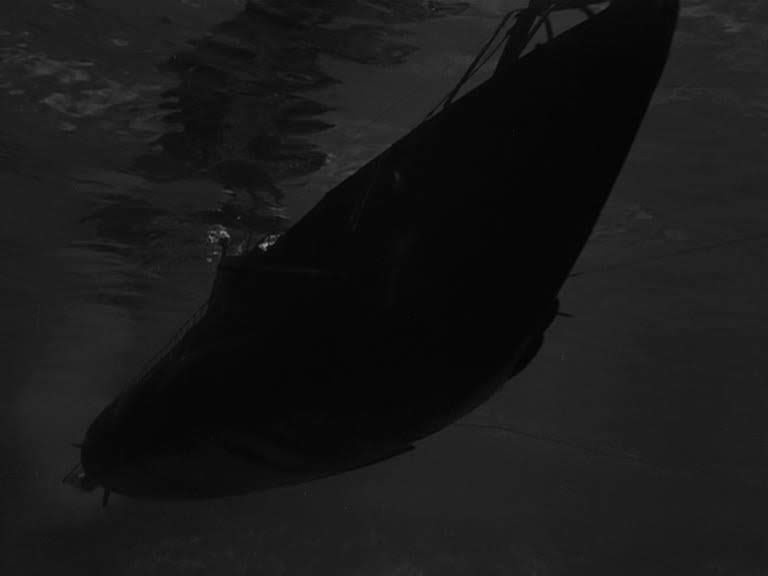 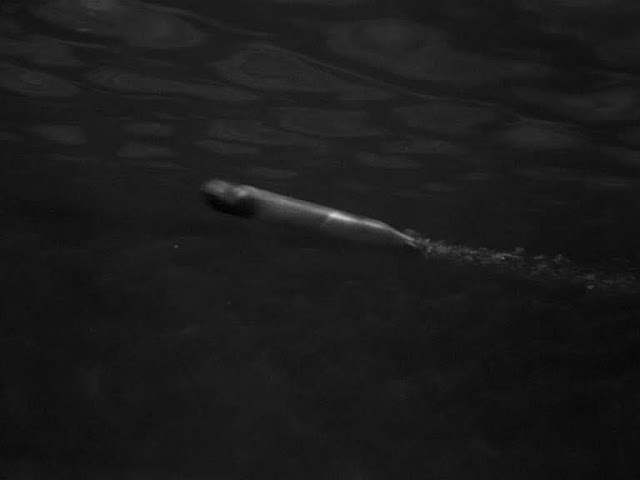 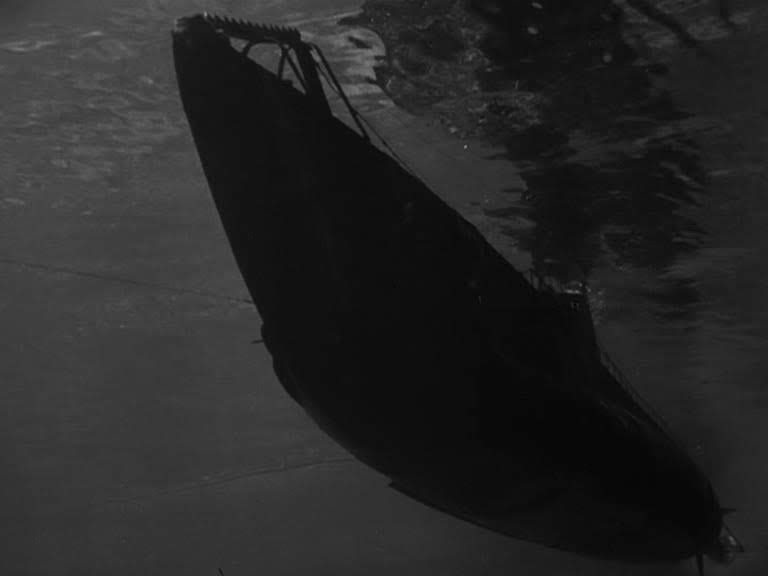 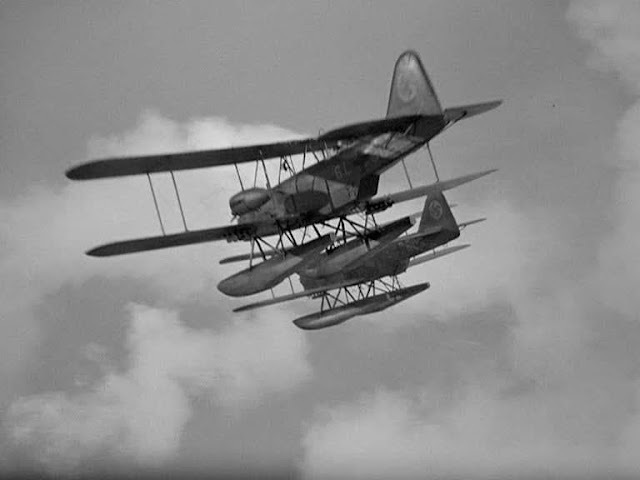 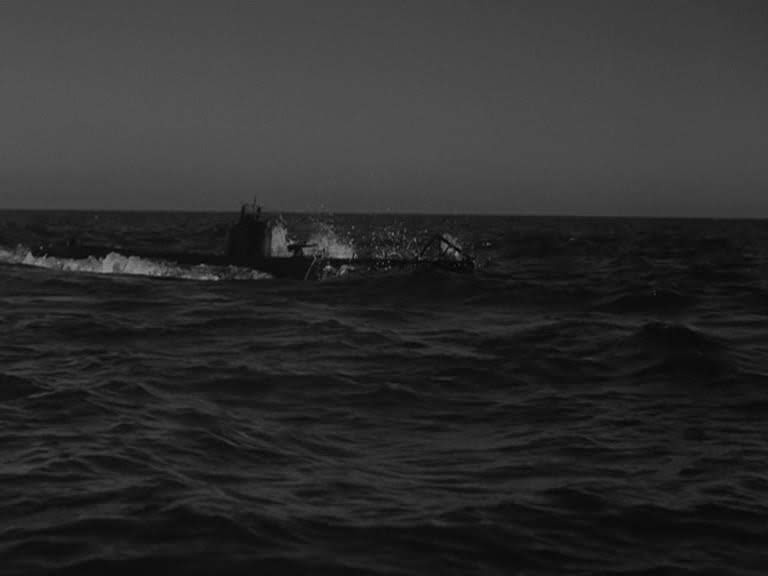 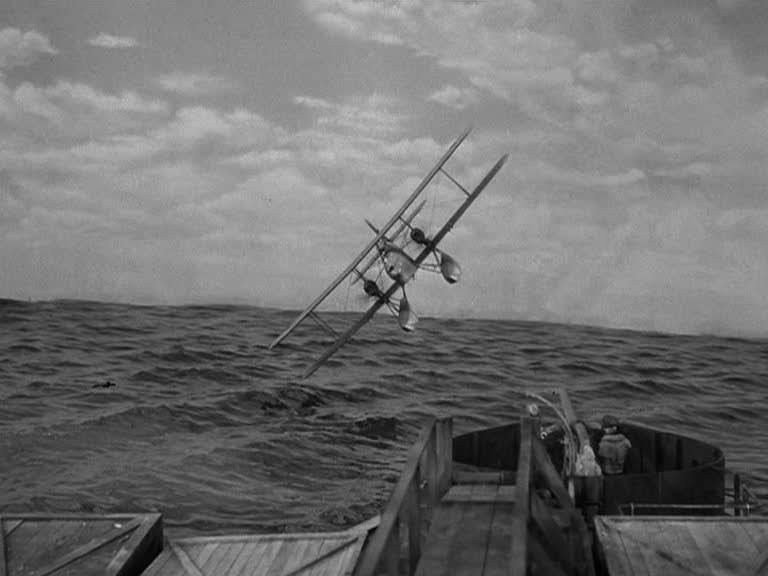 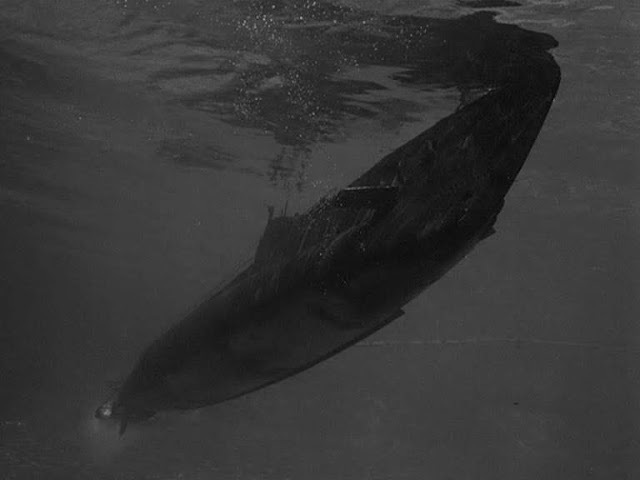 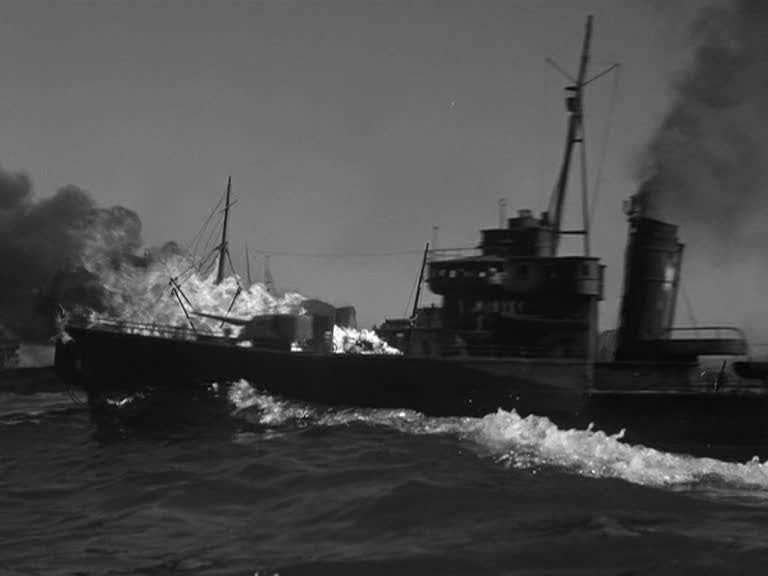 Byron Haskin who was the head of the special effects department at Warner Brothers, mentions in a Directors Guild of America Oral History book, interviewed by Joe Adamson, that they strung wires across from Stearns Wharf to the shore at the yacht club with which to control the model convoy. 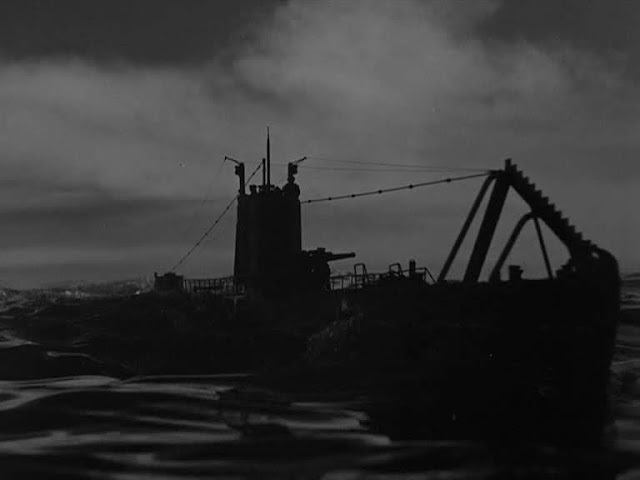 The miniatures were built to 1 inch to the foot or 1/12 scale. 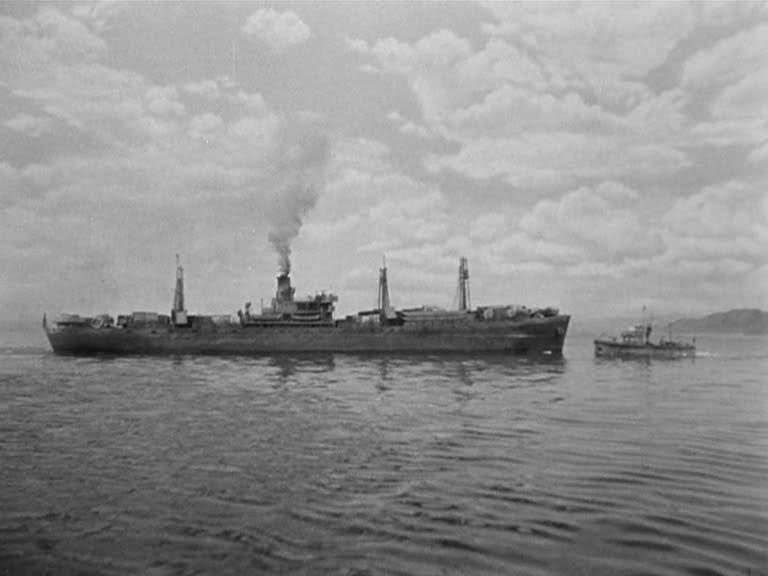 He states there were as many as 450 separate miniatures used in the show. 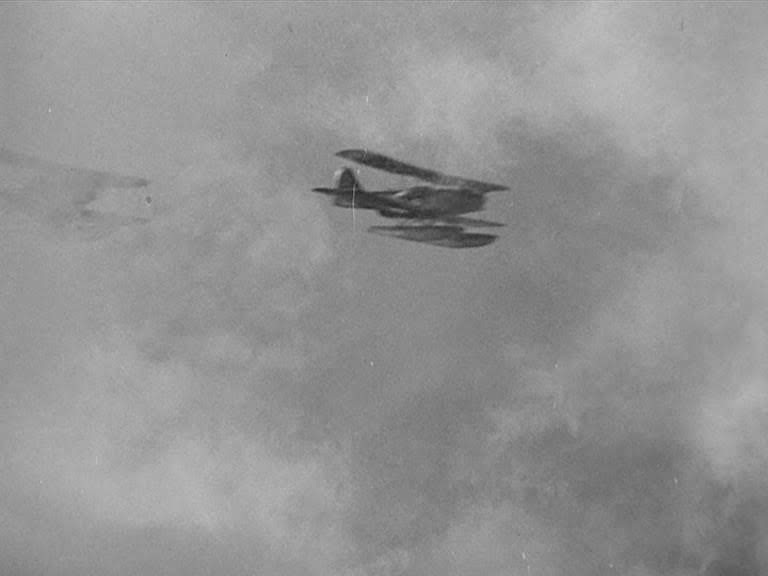 He goes on to say that there was a man in each ship controlling the steering of the small inboard motors. 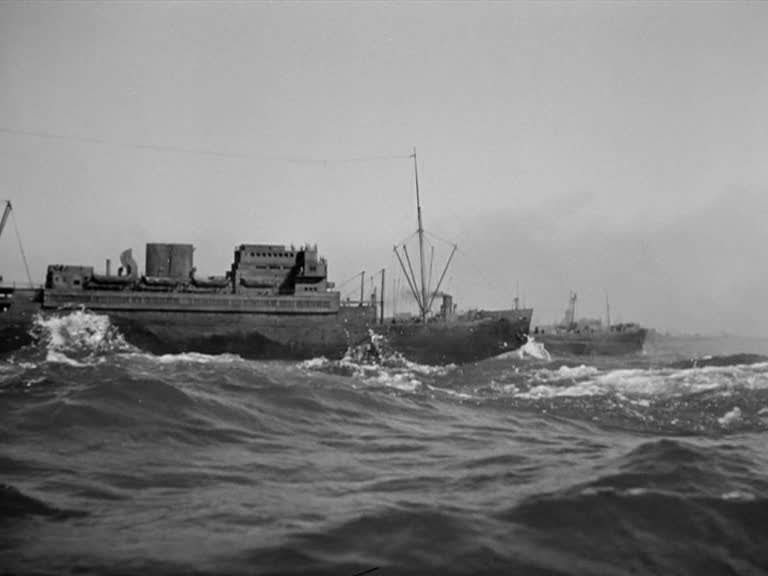 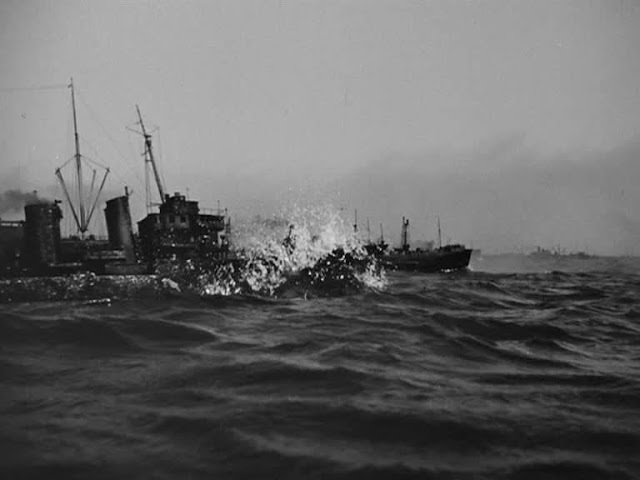 I suspect that the wires were for the background ships while the motorised ones were carving up the waves in the foreground. 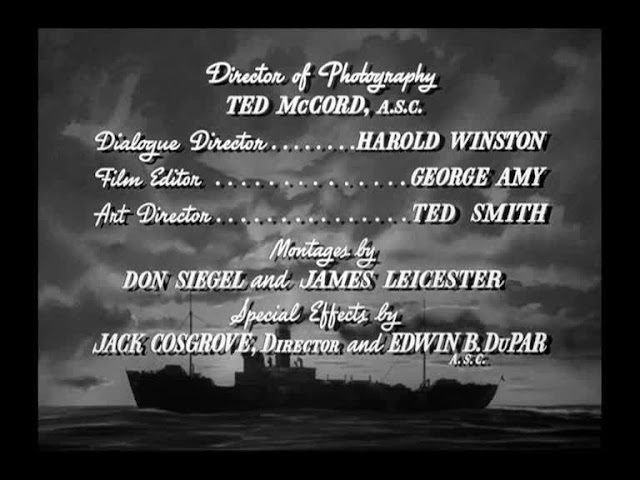 Jack Cosgrove was the supervisor for the miniature effects shoot. 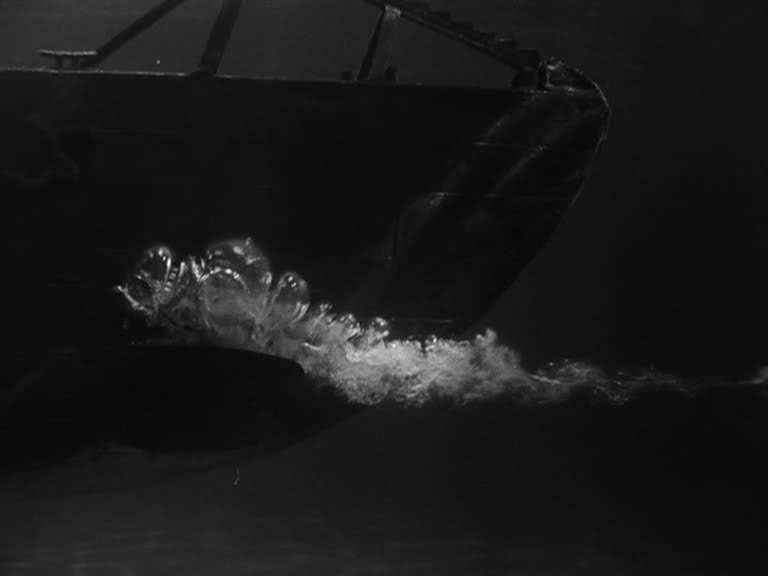 The model work is really spectacular and always full of vigorous movement. 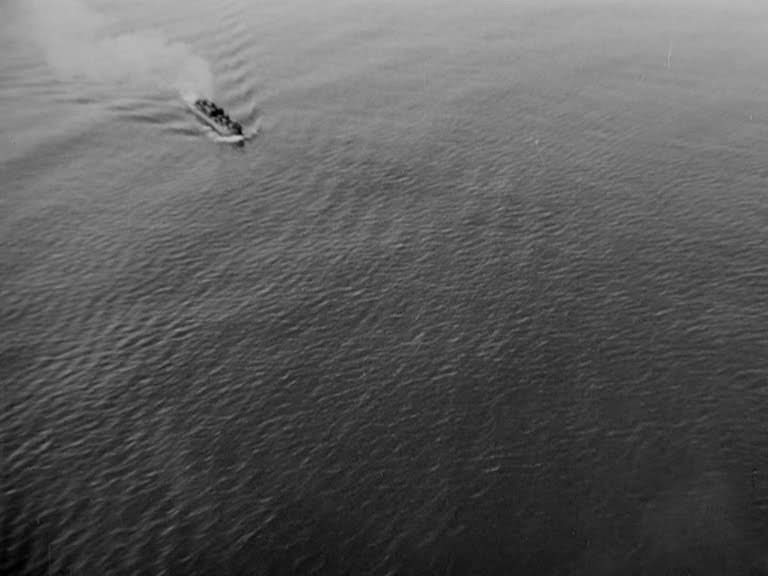 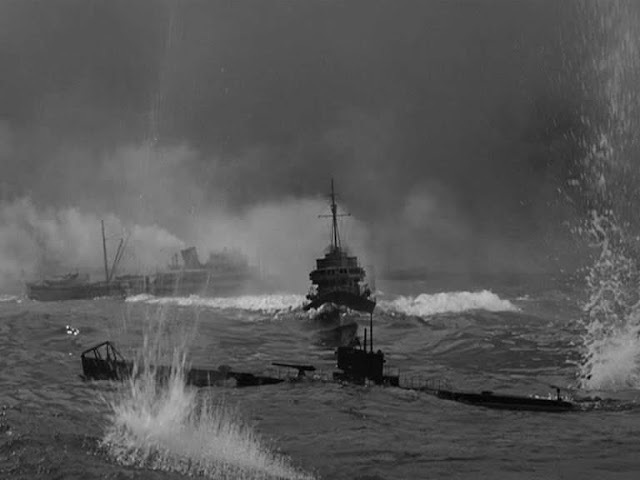 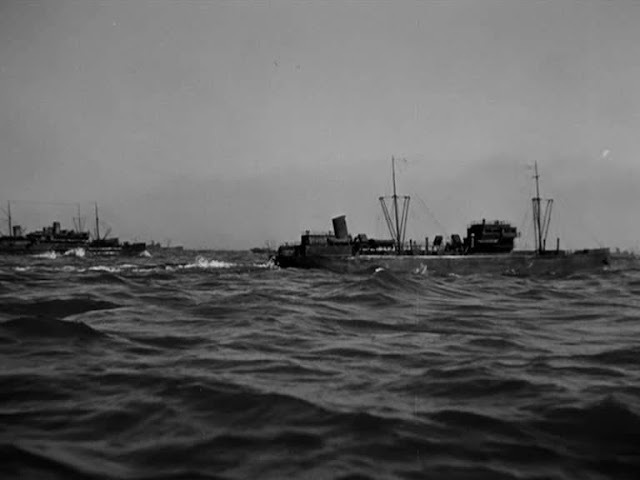 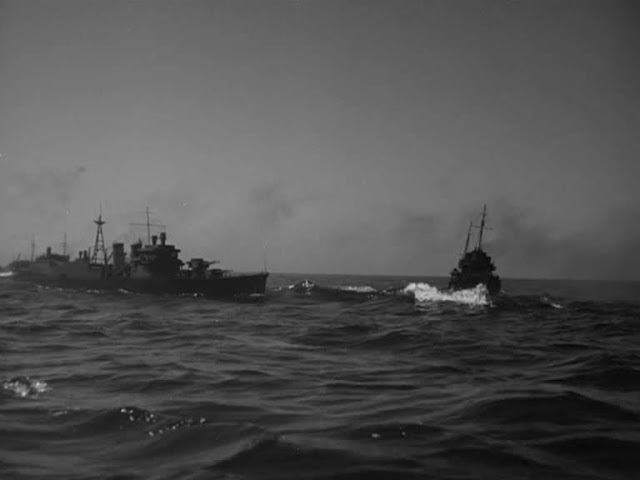 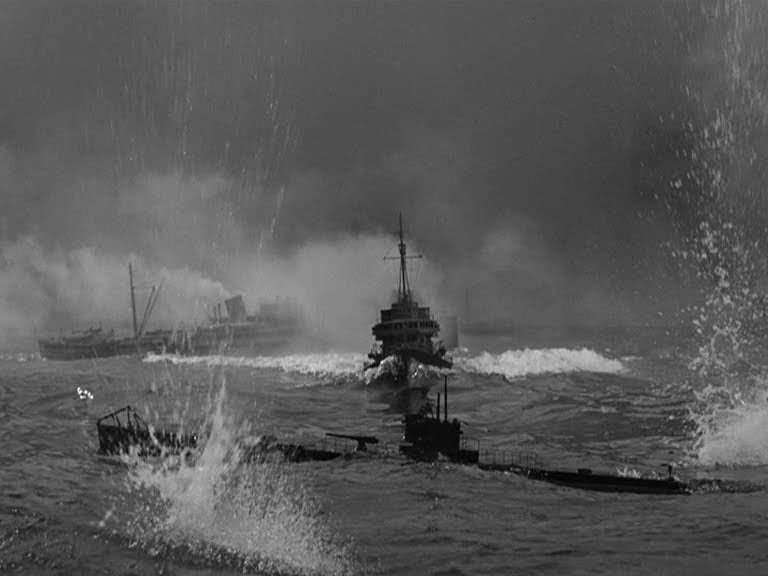 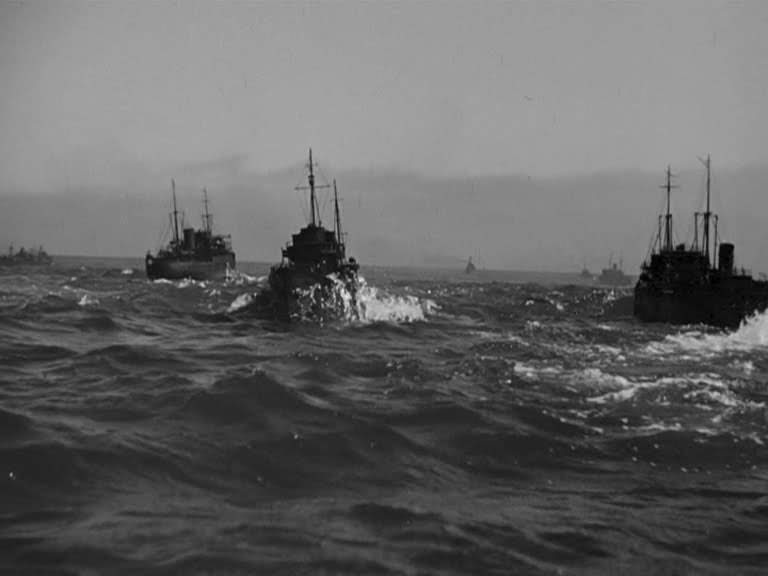 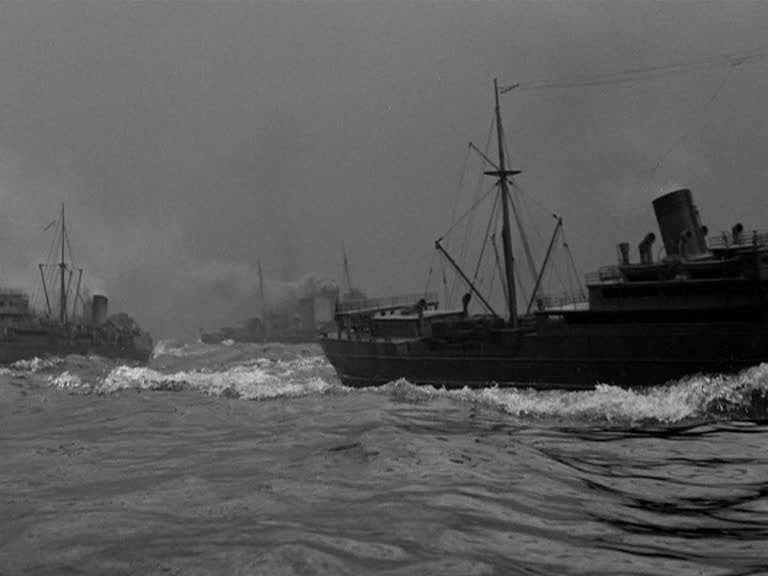 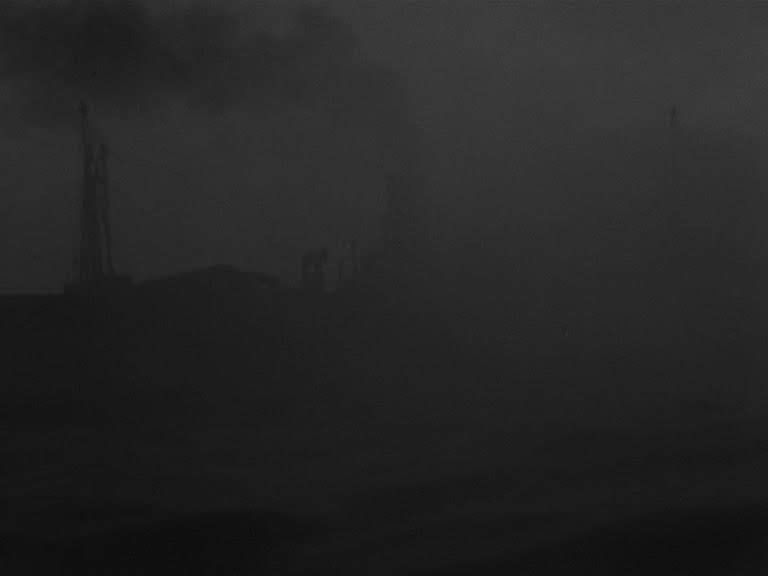 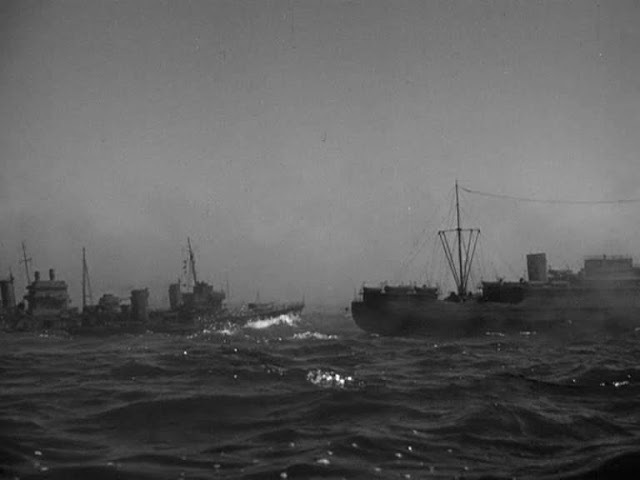 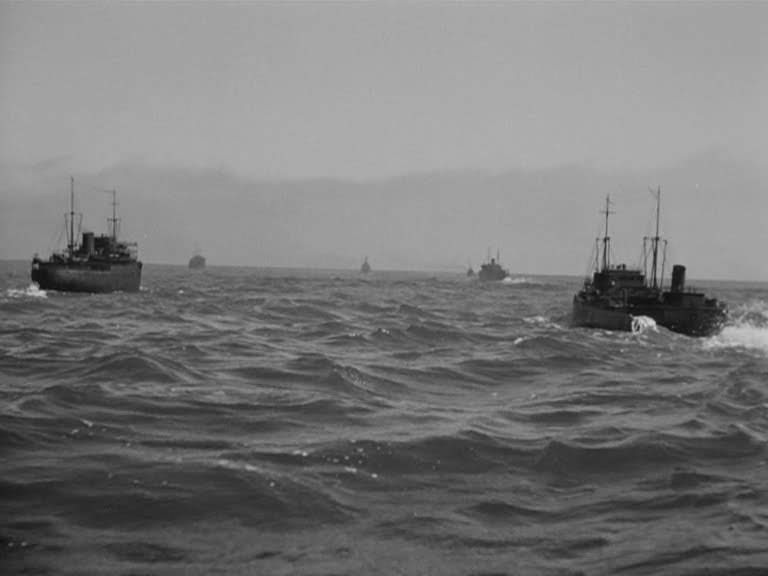 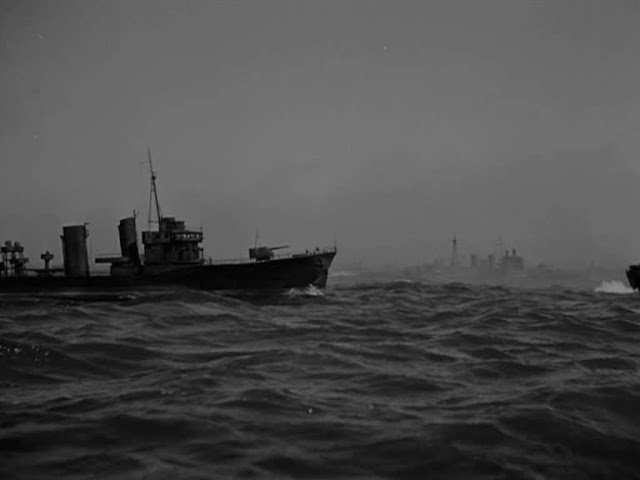 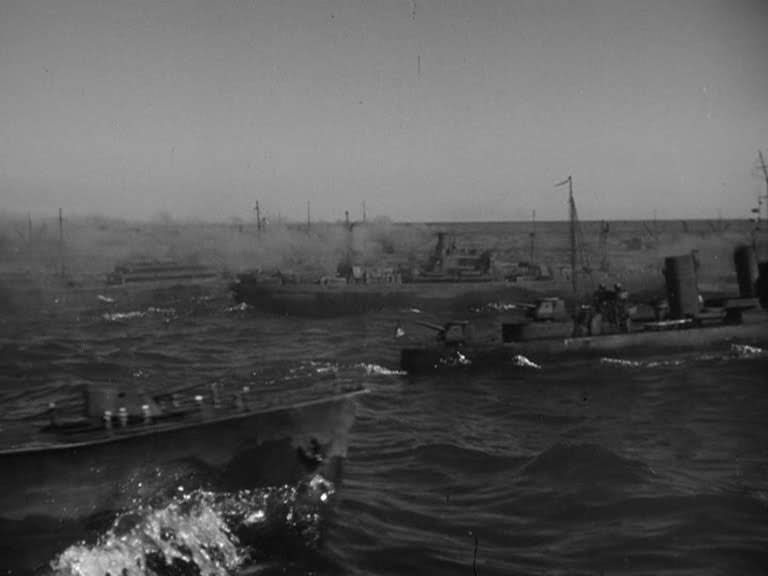 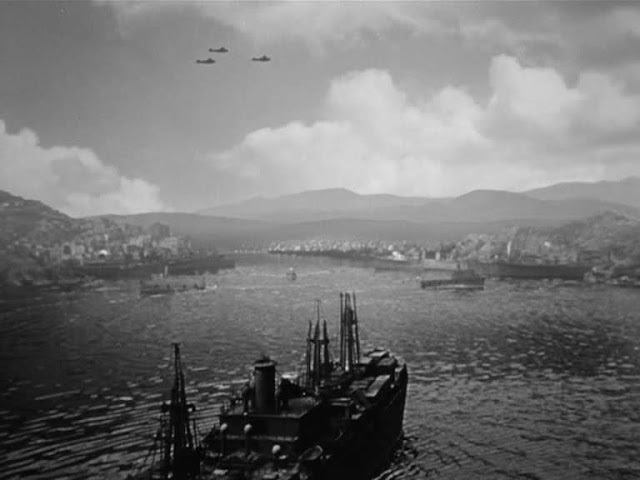 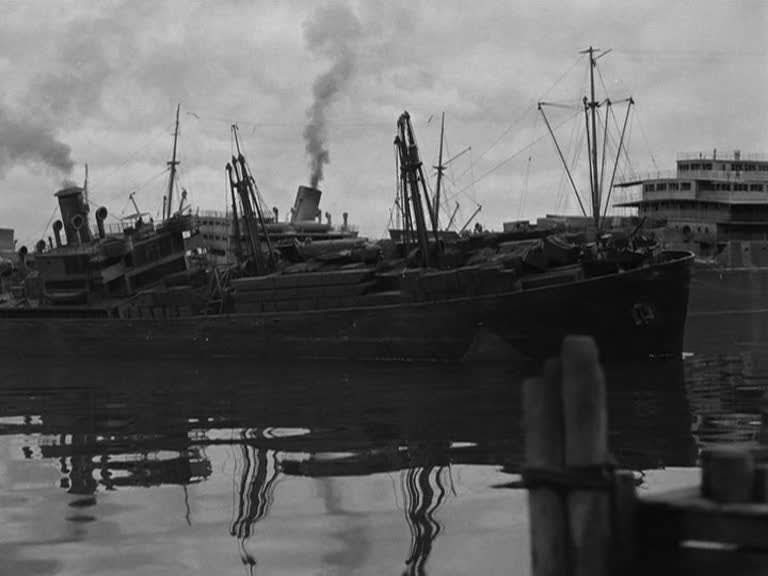 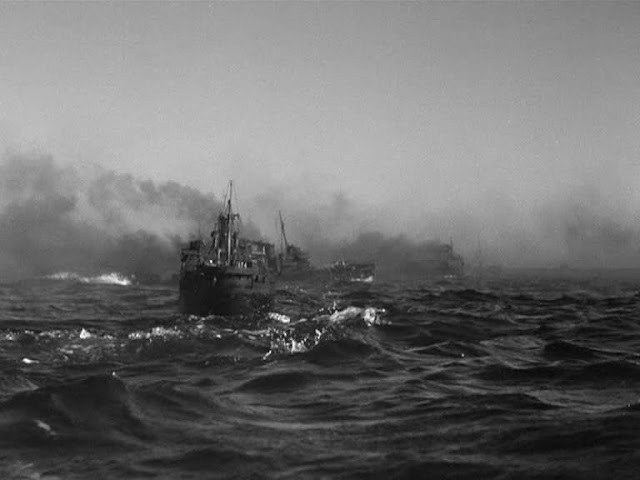 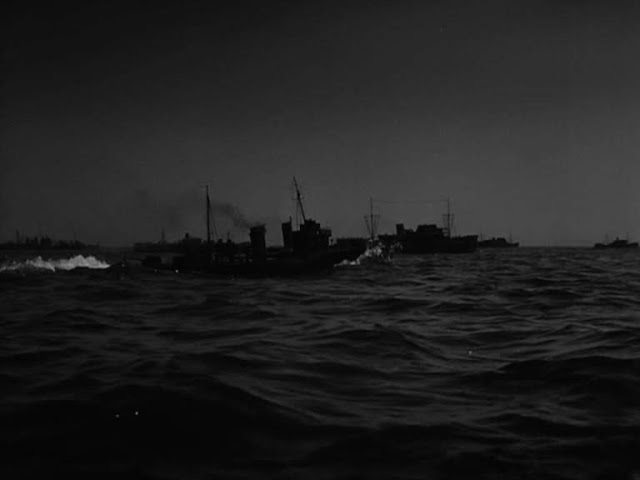 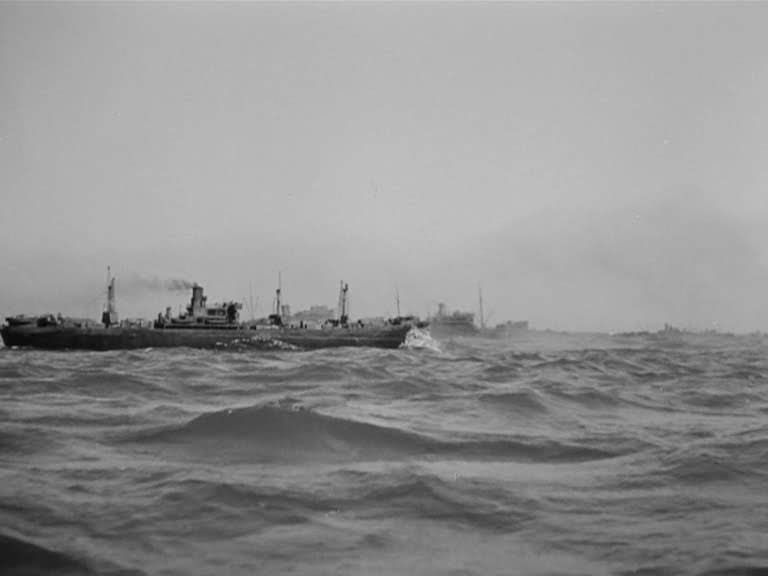 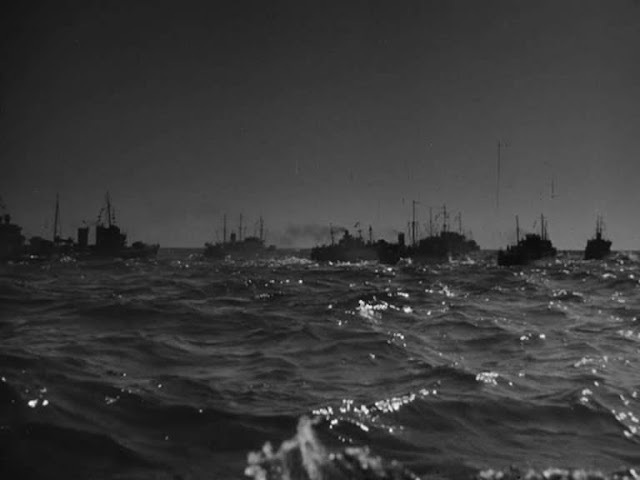 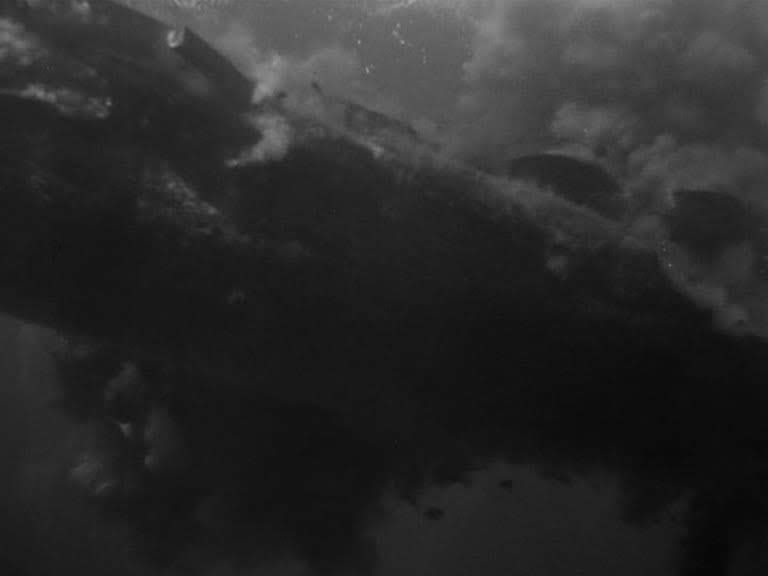 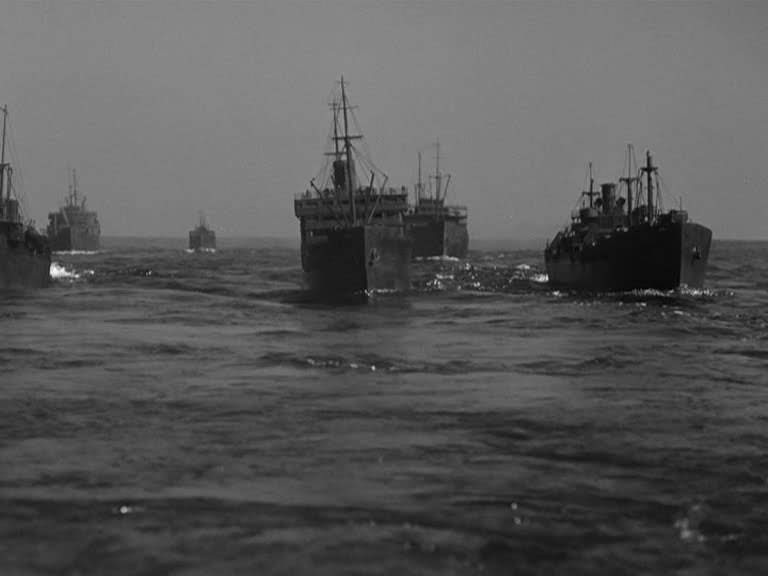 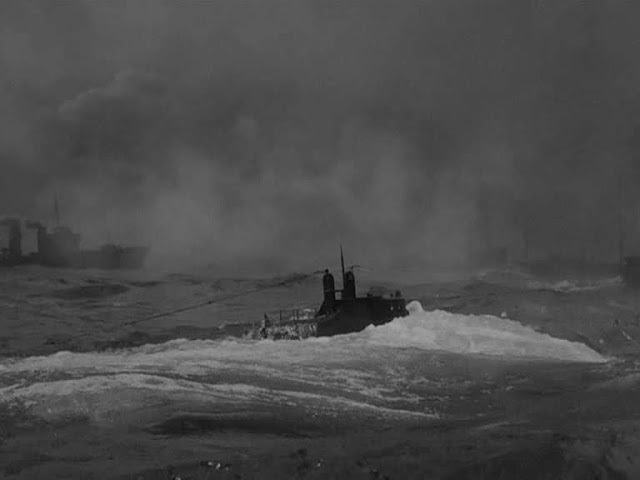 There is a lot going on in the shots with a large number of ships in each frame of the convoy scenes. 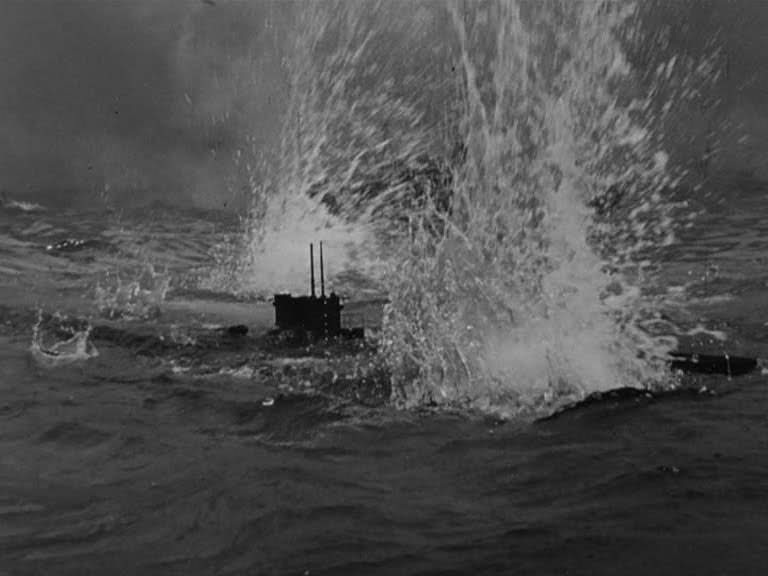 All the explosions are enhanced by a violent jarring and shaking of the camera blurring the footage which is quite effective. 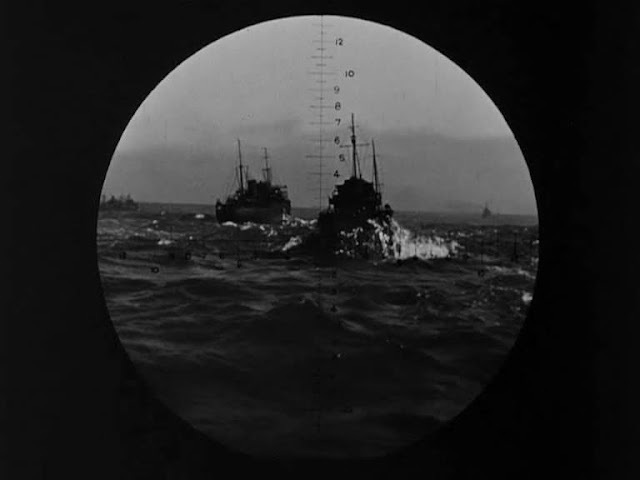 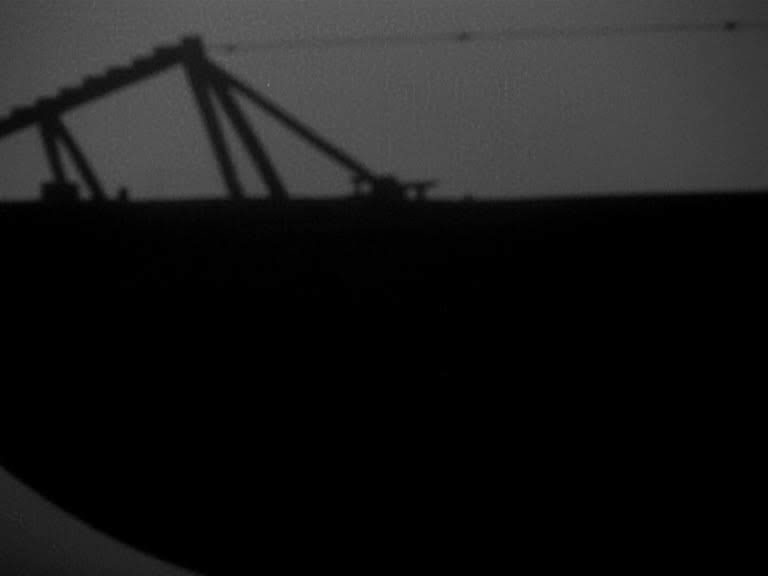 This effect was applied later by use of the optical printer. 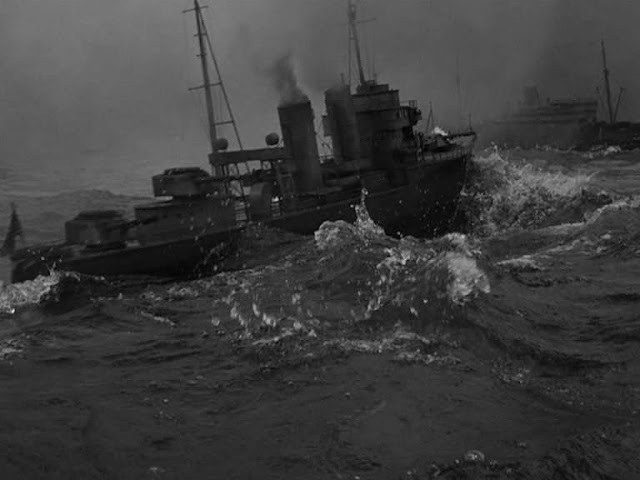 All this adds up to it being one of all time great model ship movies. 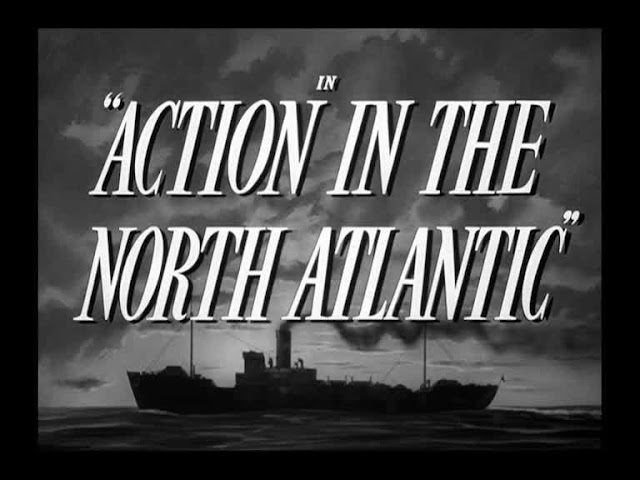 Congrats on including ACTION IN THE NORTH ATLANTIC. Definitely one of the best WWII effects movies ever. 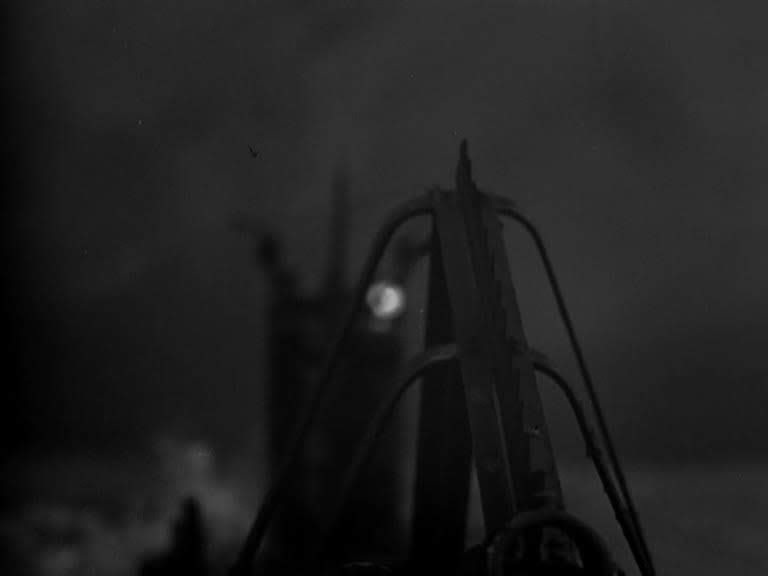 Beautifully orchestrated and, for the most part, photographed miniature set pieces by the biggest effects department in Hollywood at that time, the famed Warner Brothers Stage 5, who created hundreds of spectacular and eye popping trick shots throughout the 1940's. 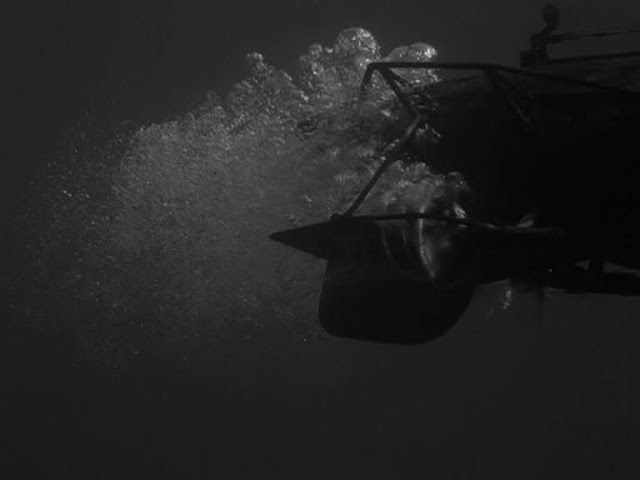 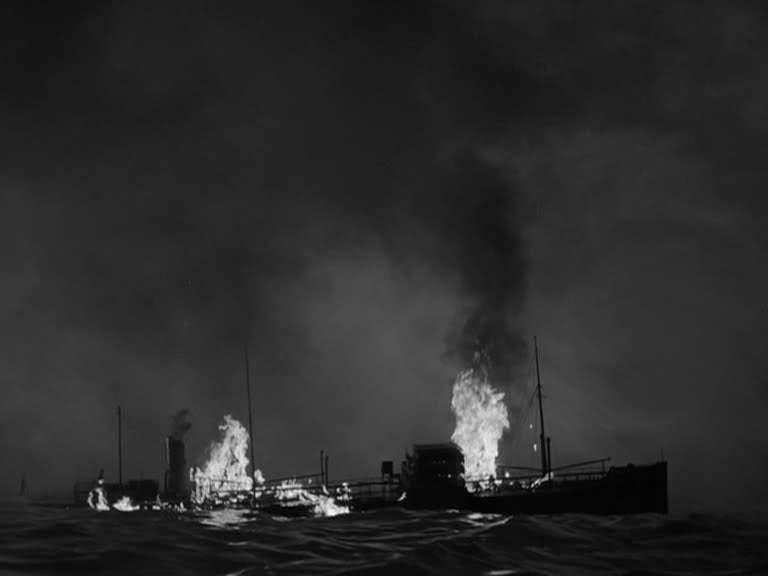 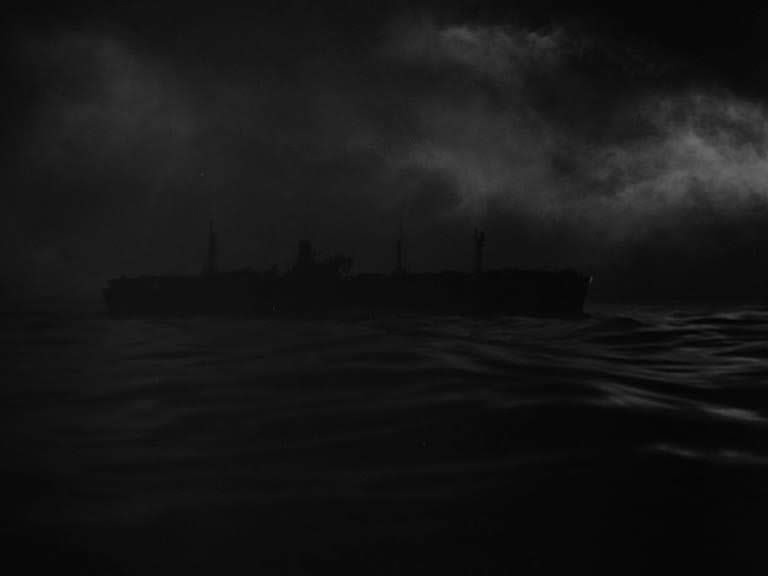 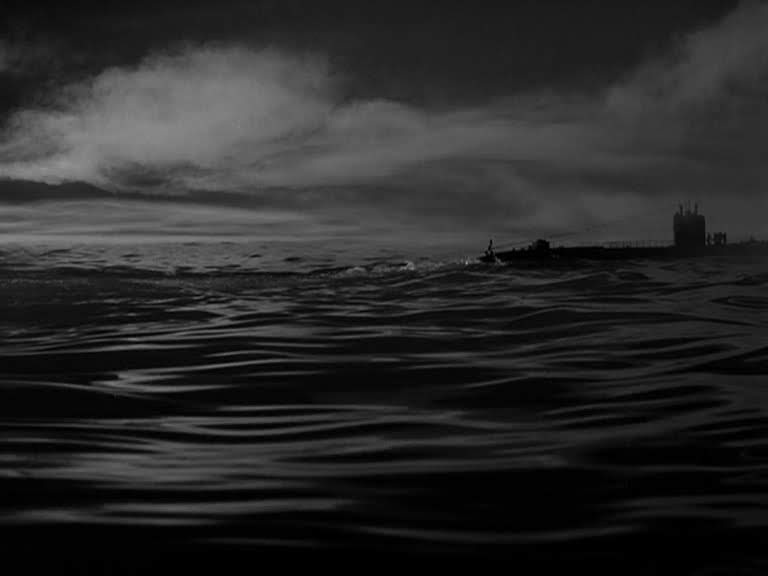 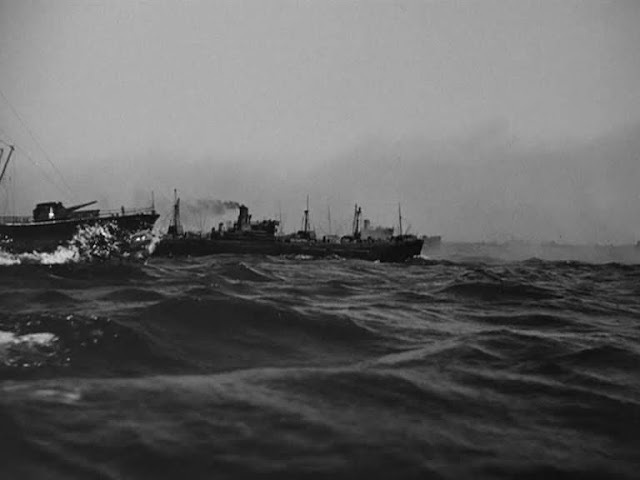 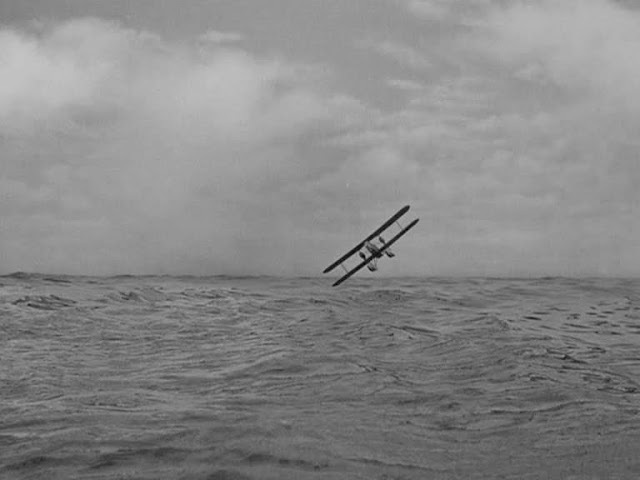 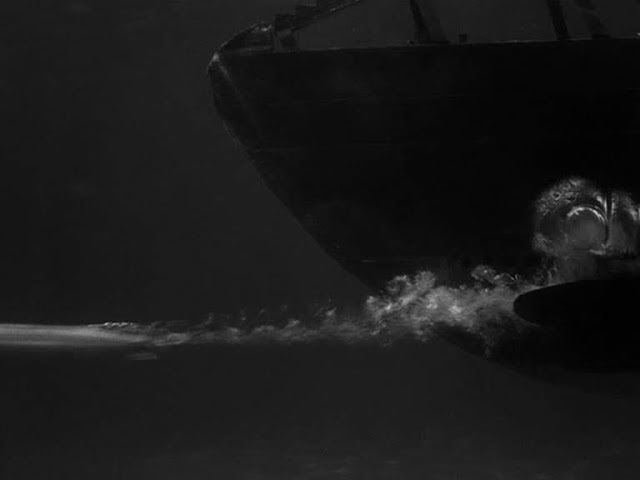 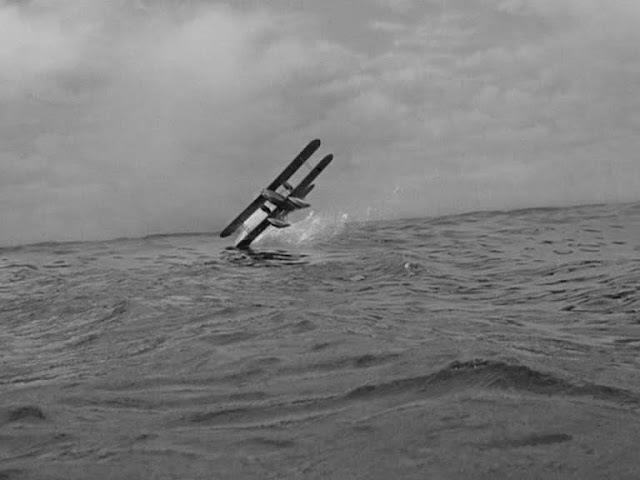 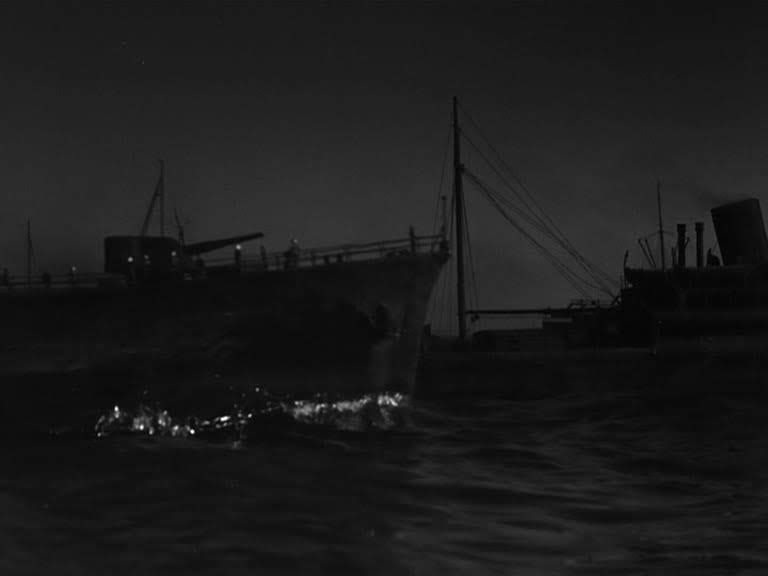 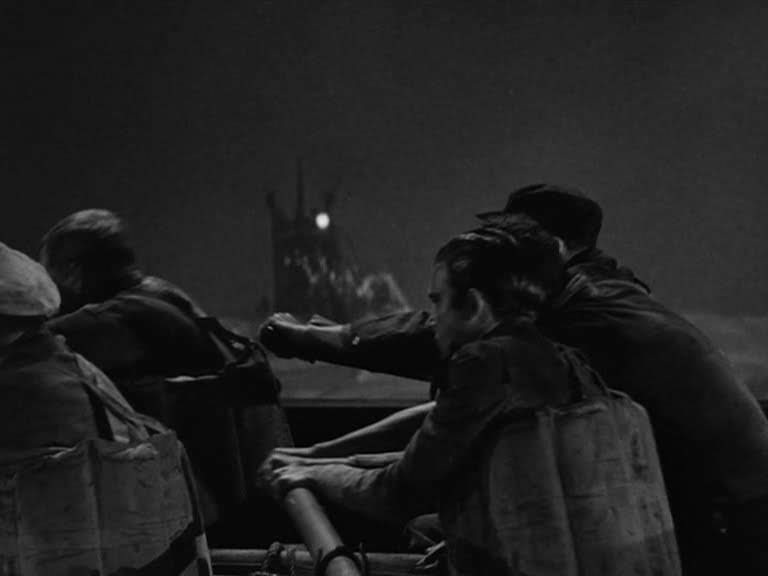 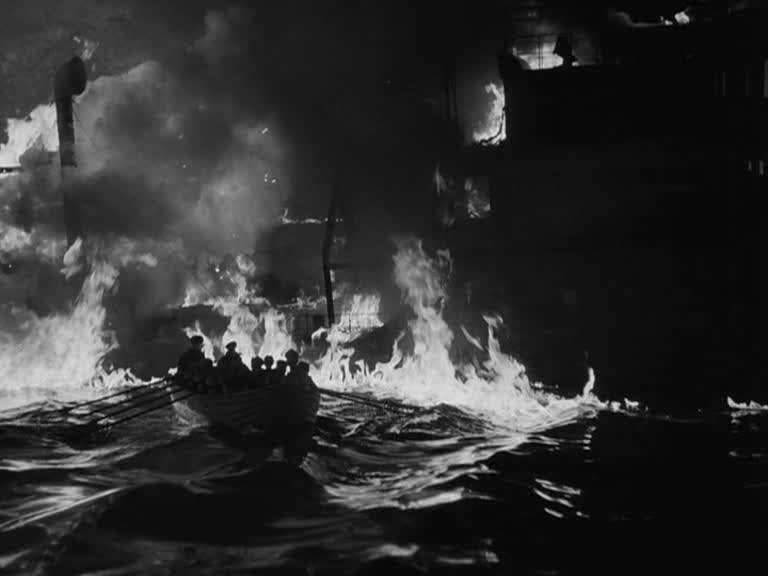 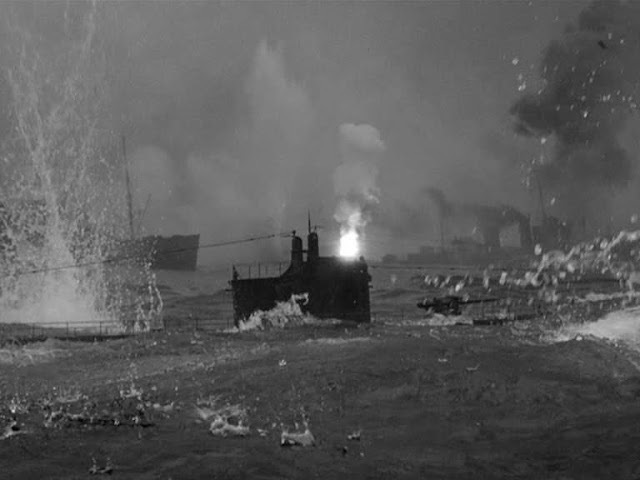 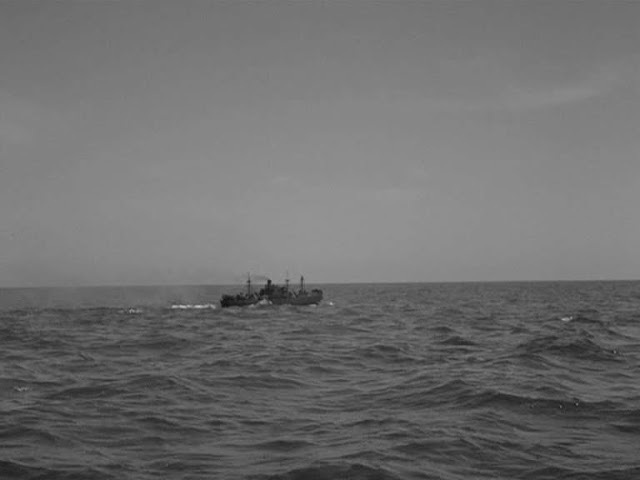 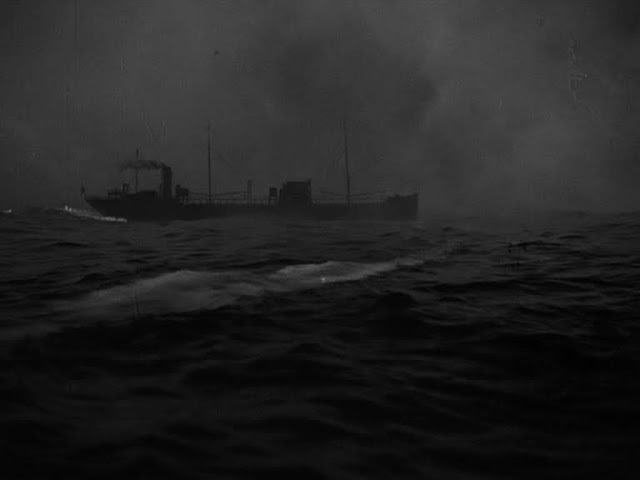 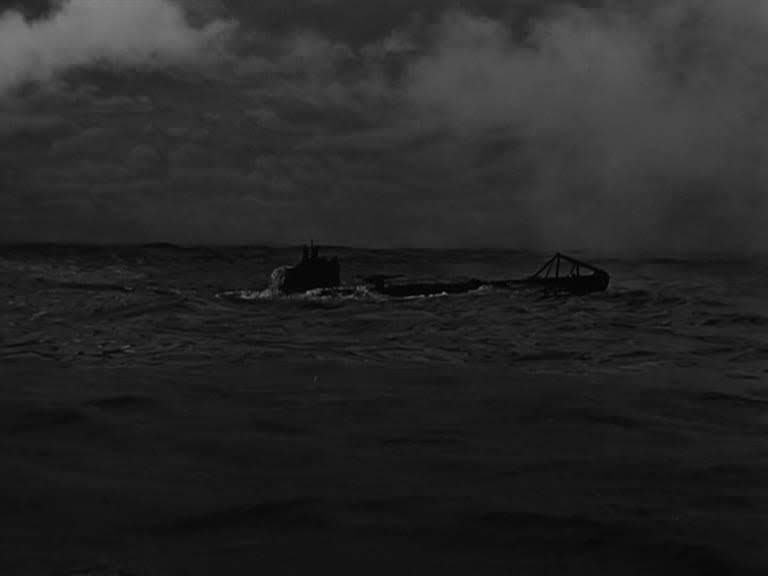 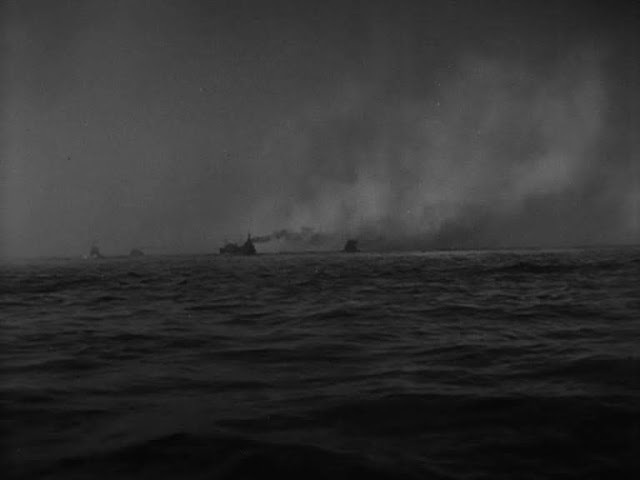 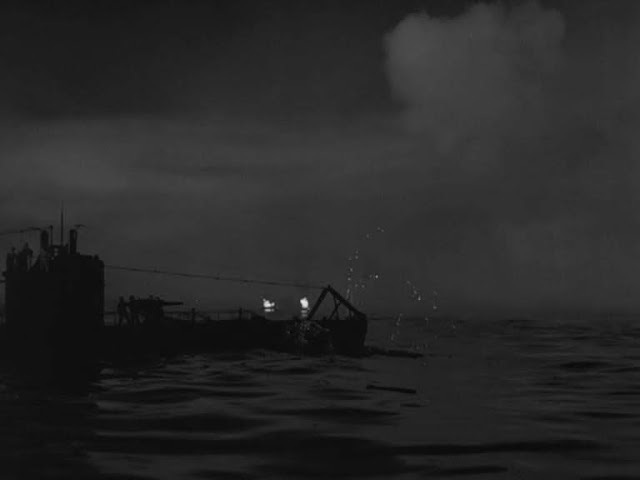 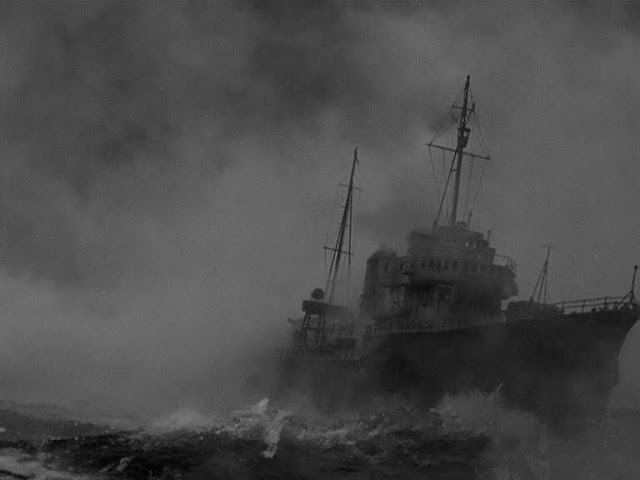 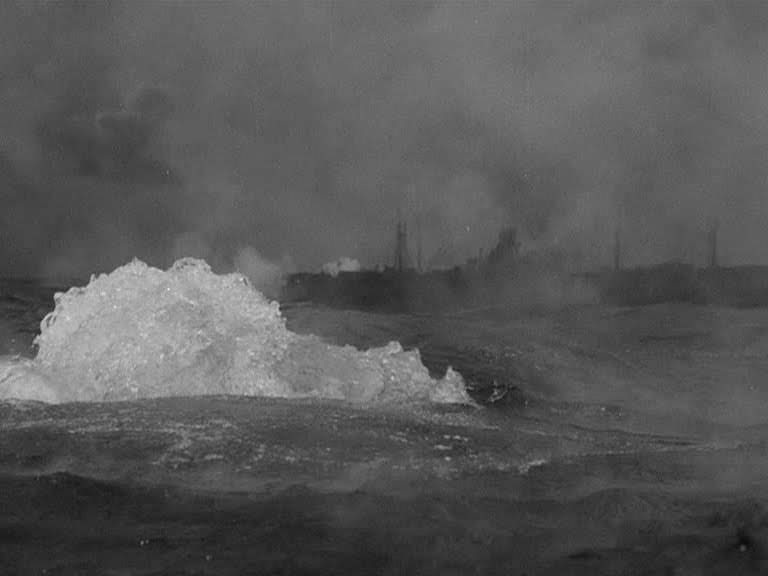 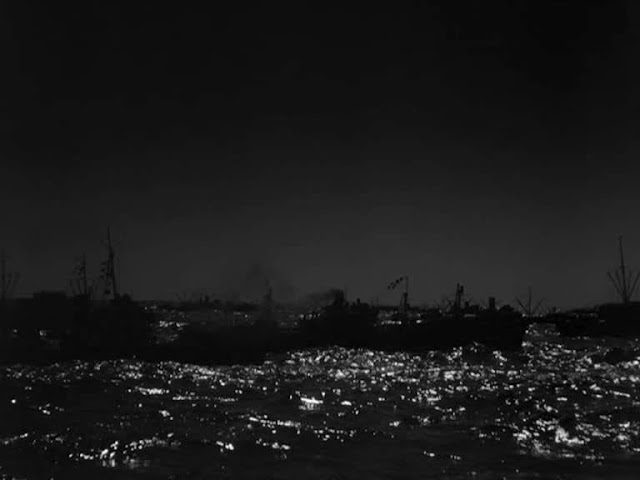 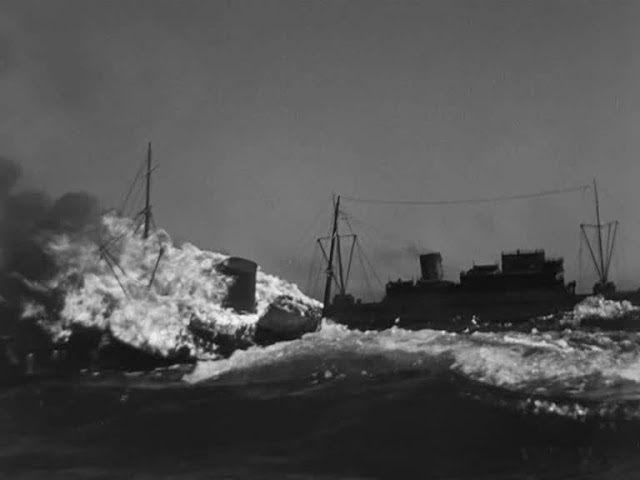 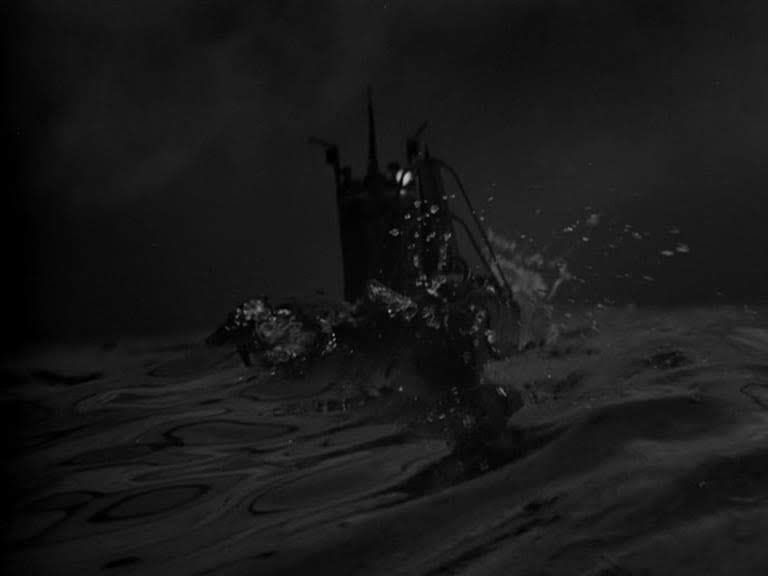 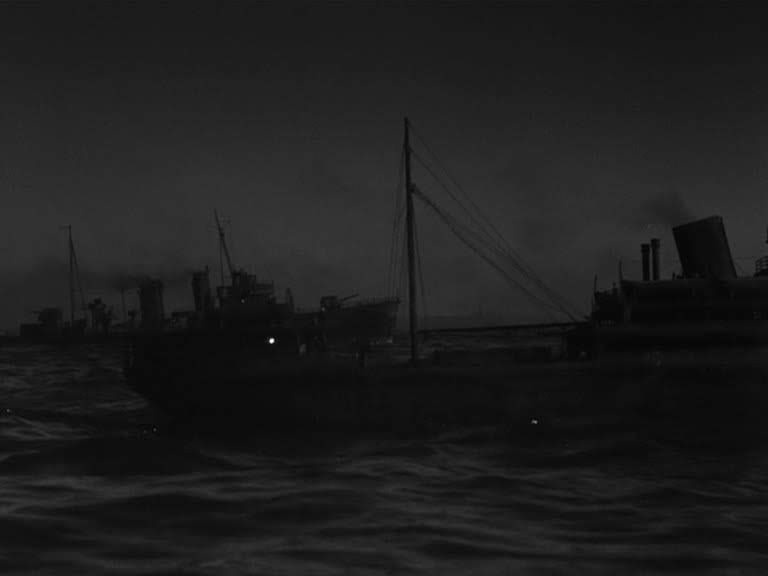 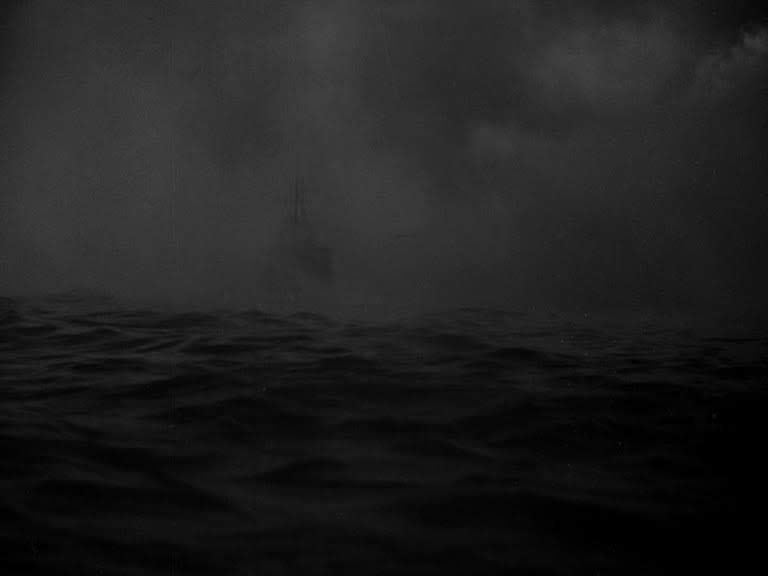 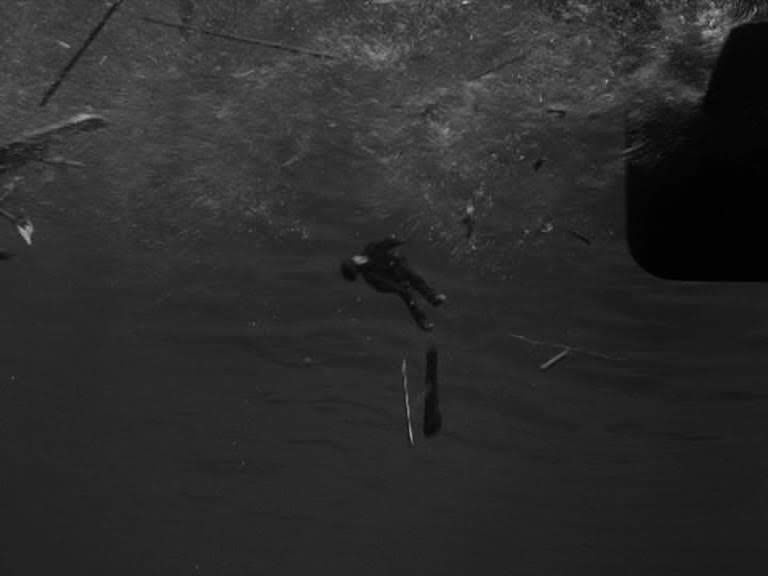 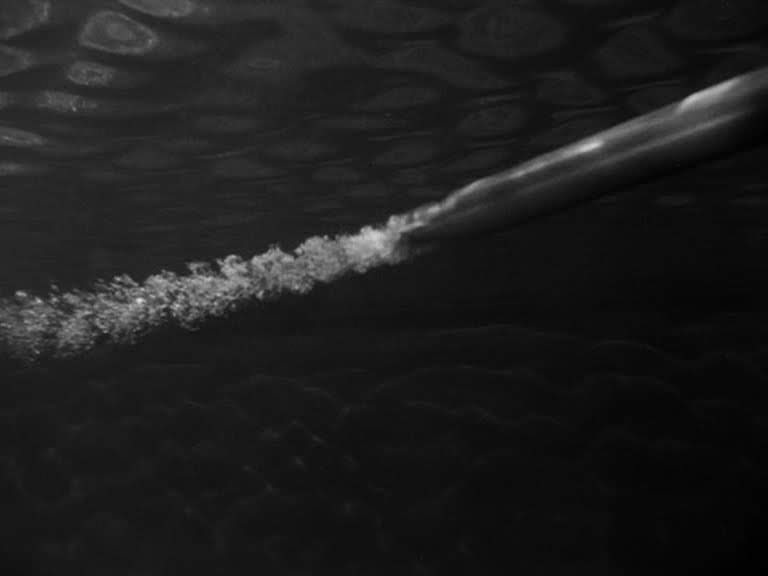 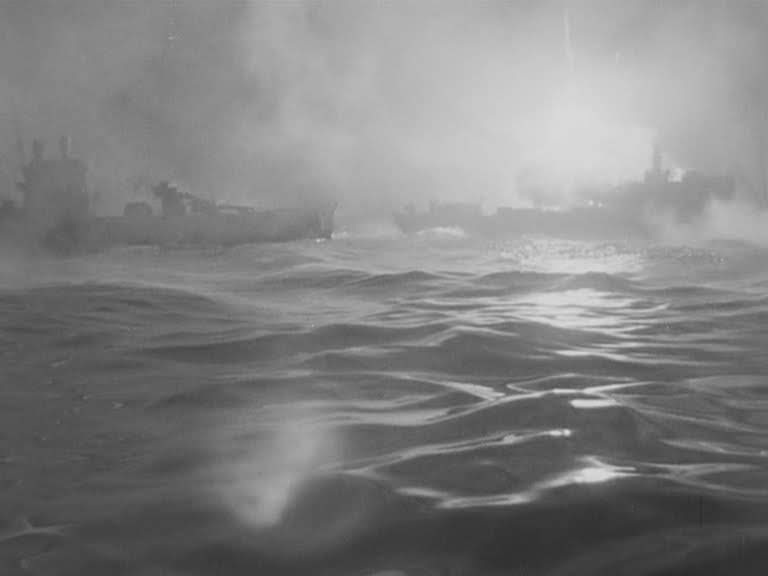 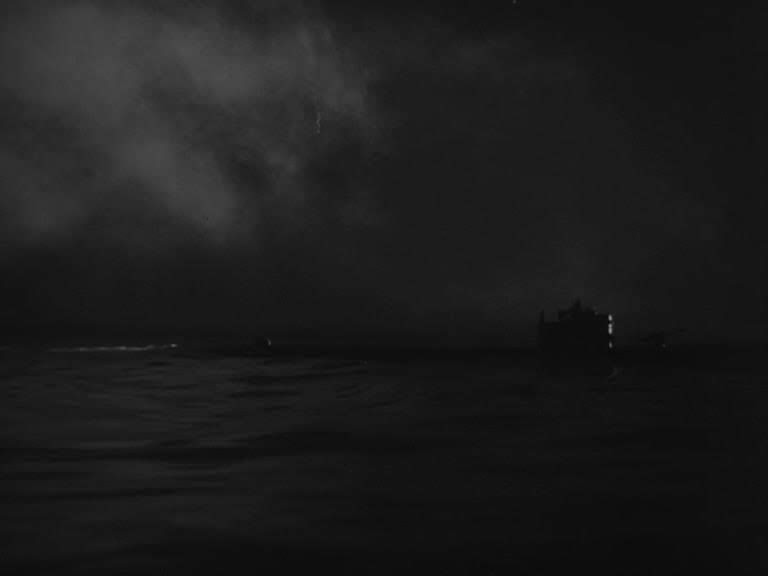 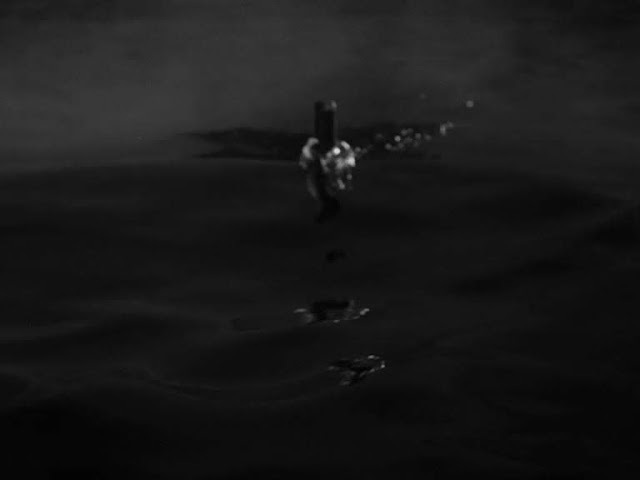 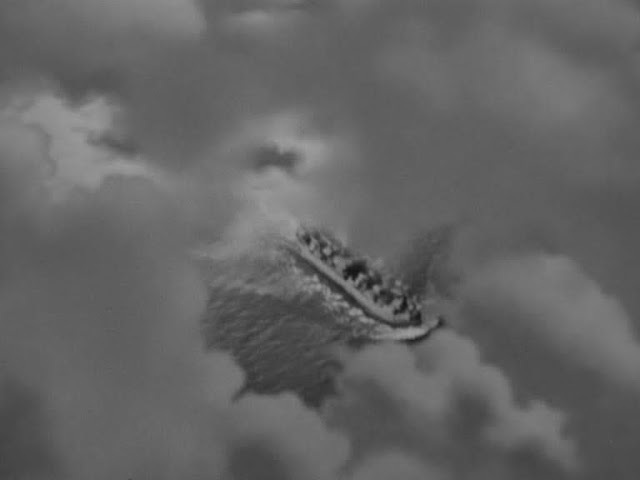 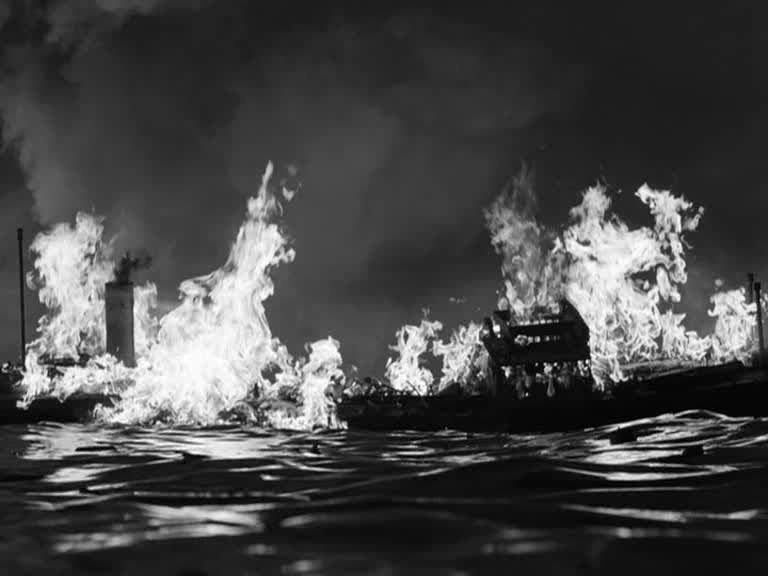 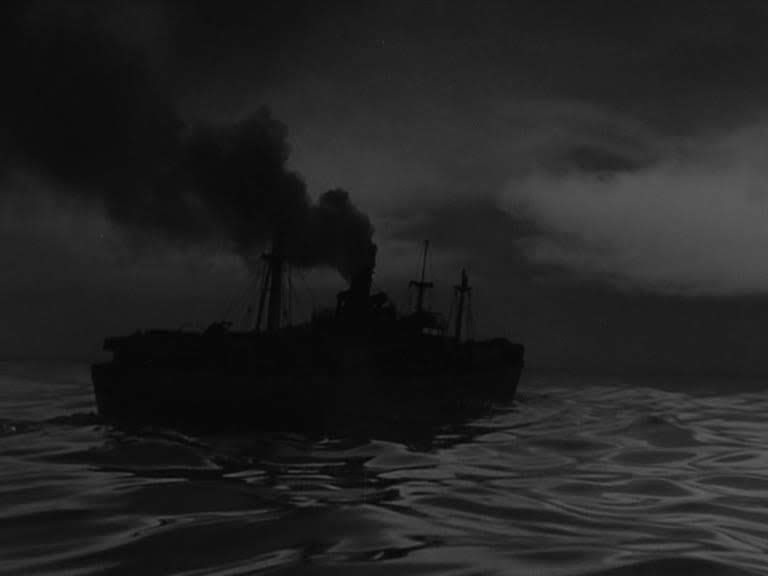 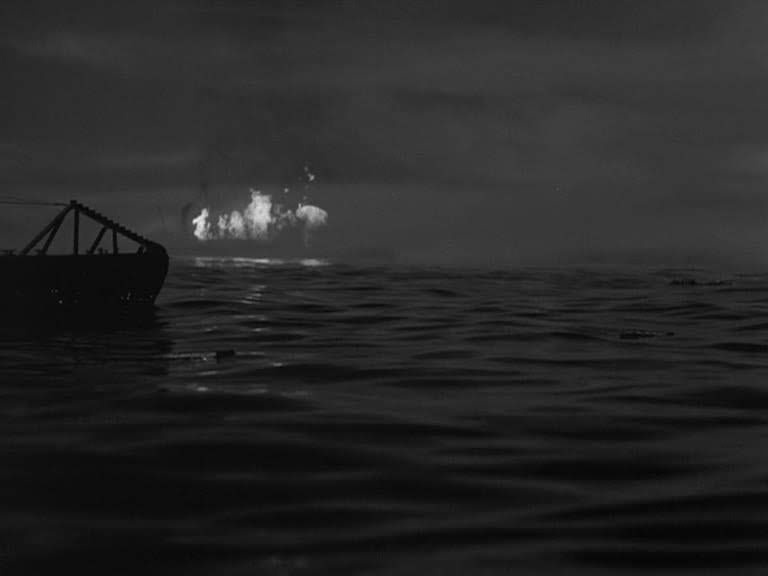 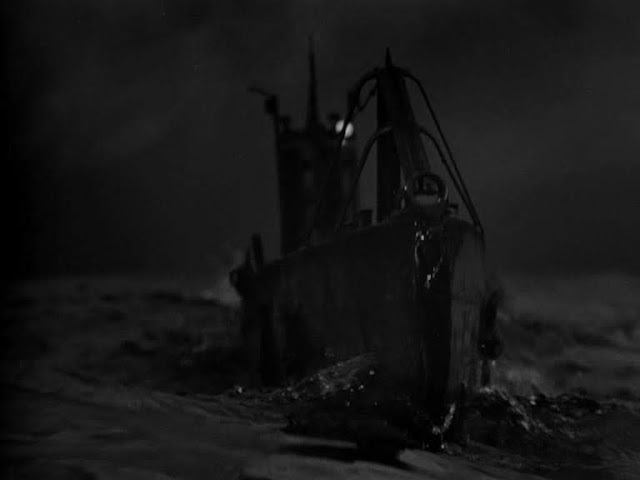 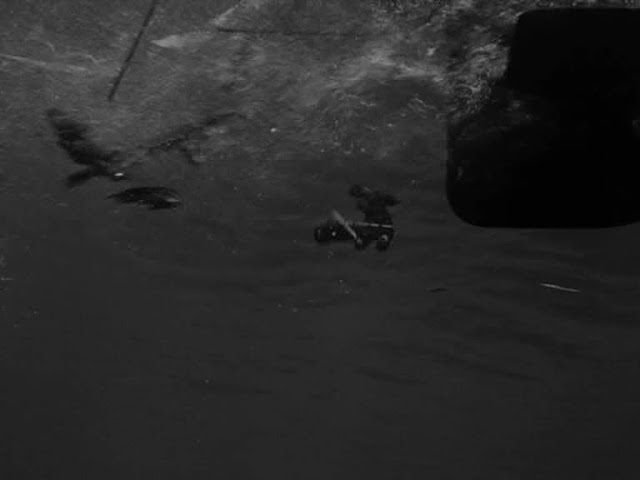 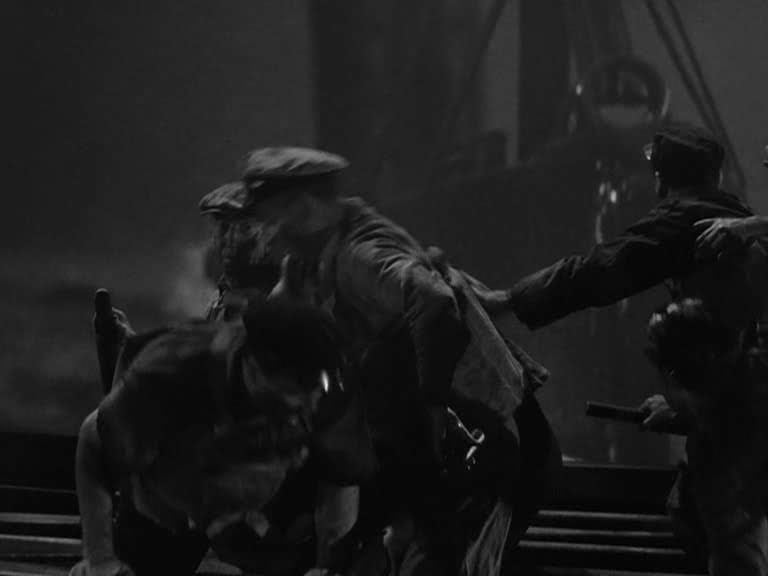 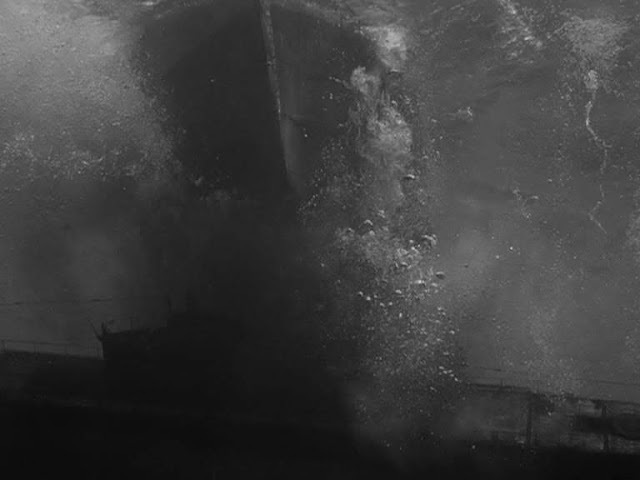 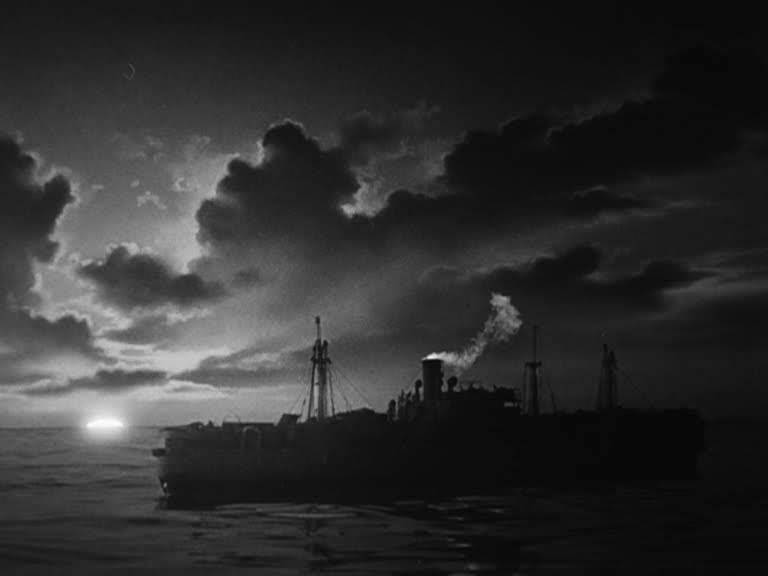 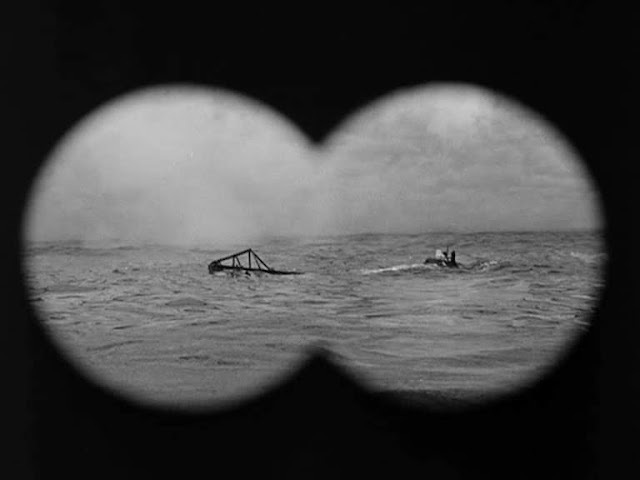 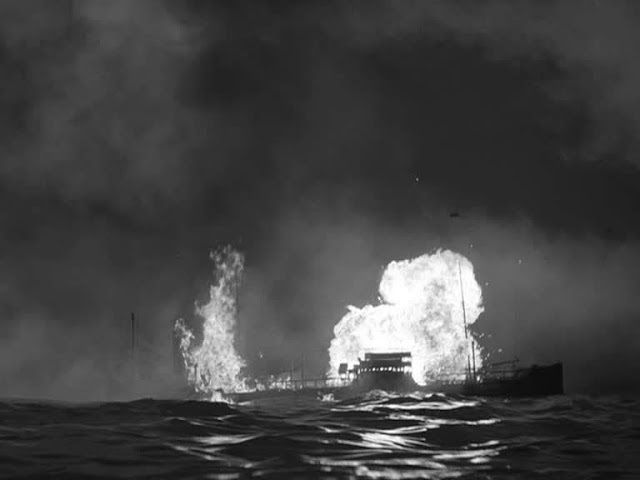 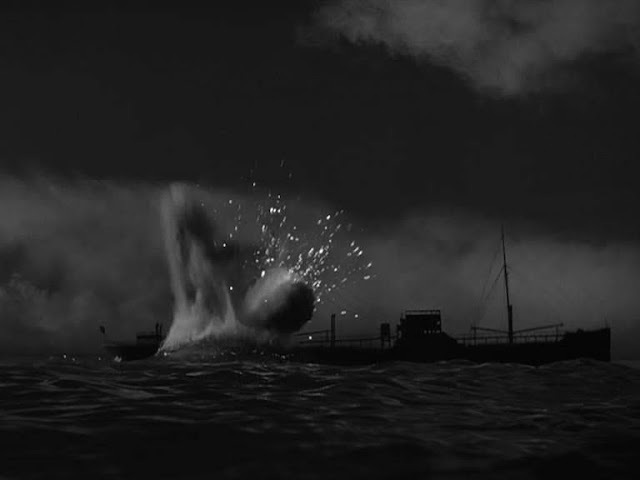 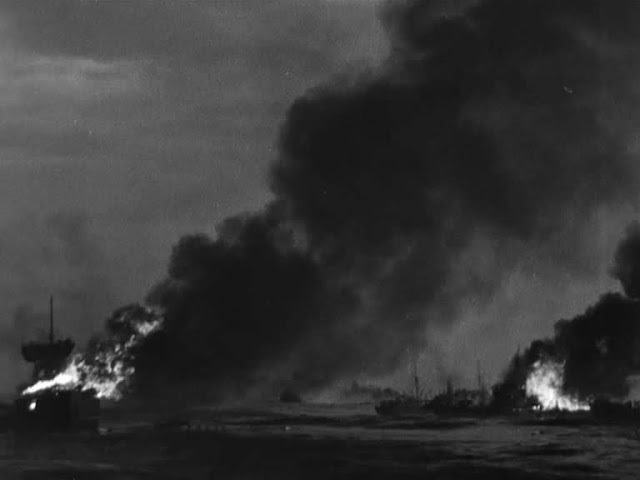 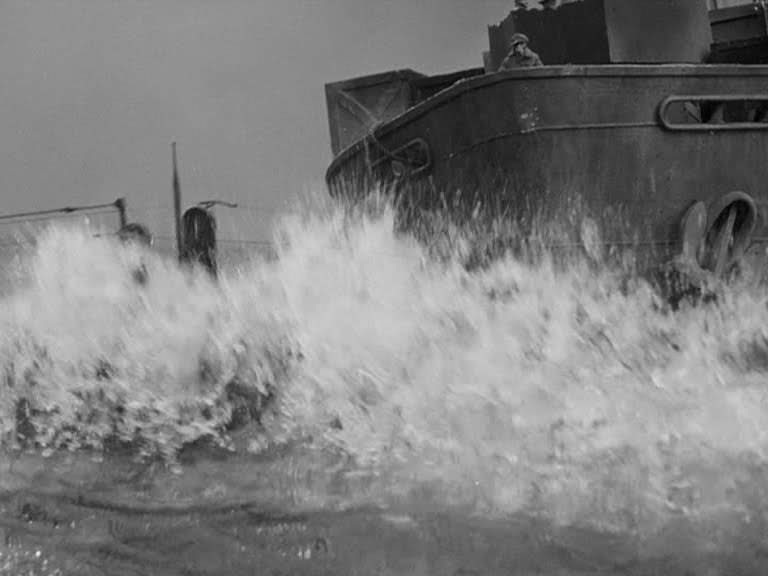 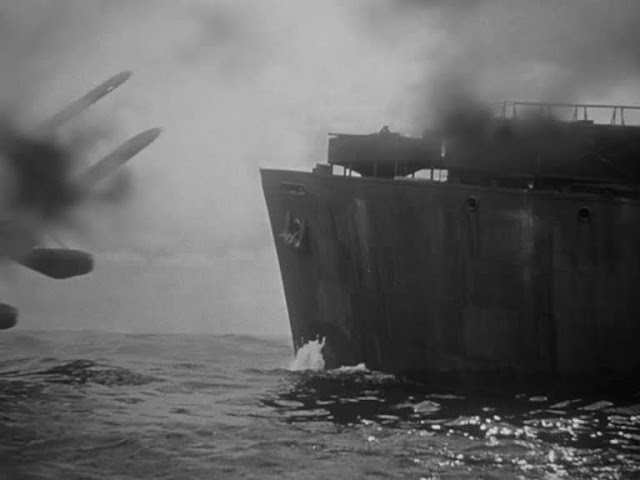 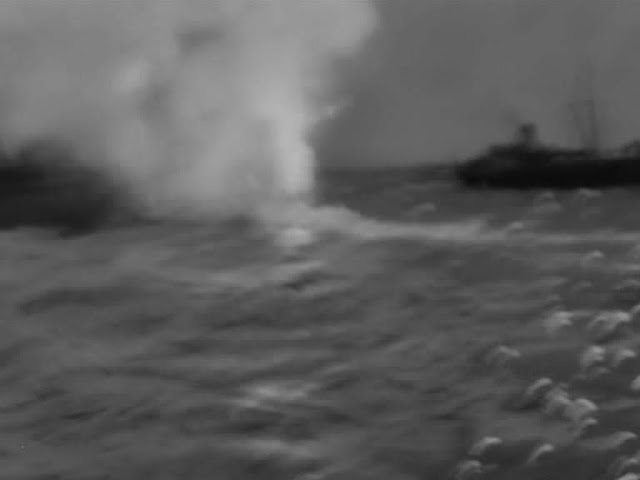 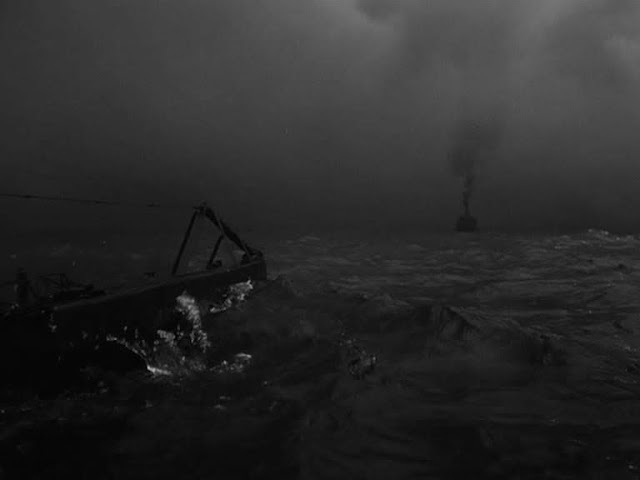 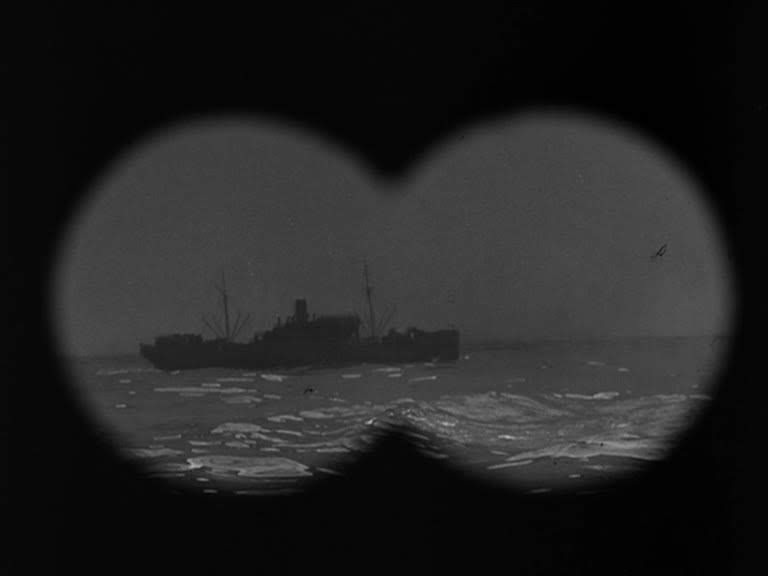 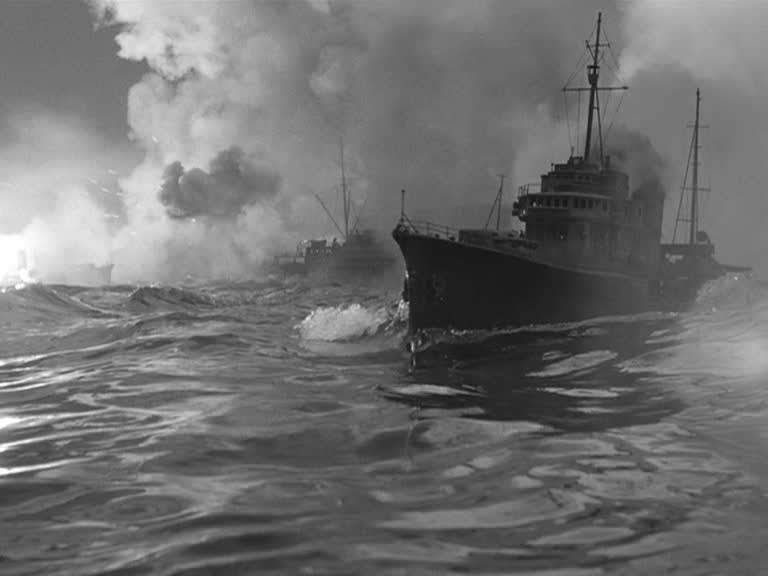 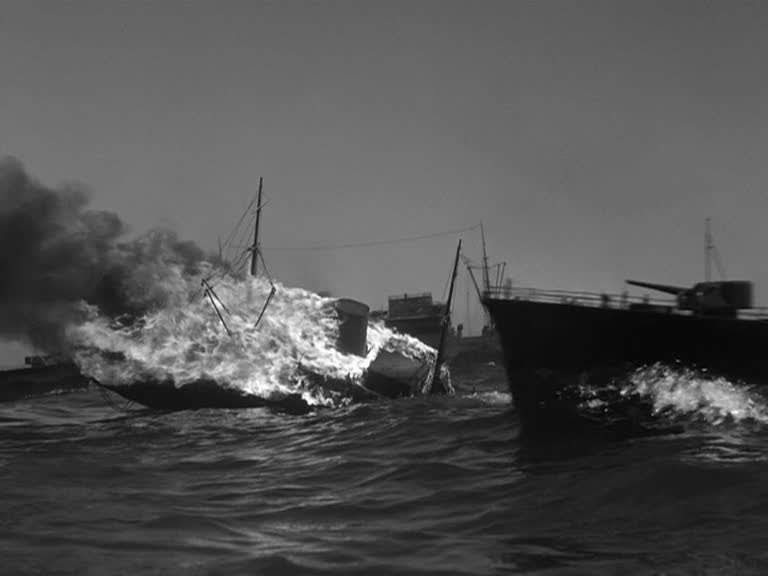 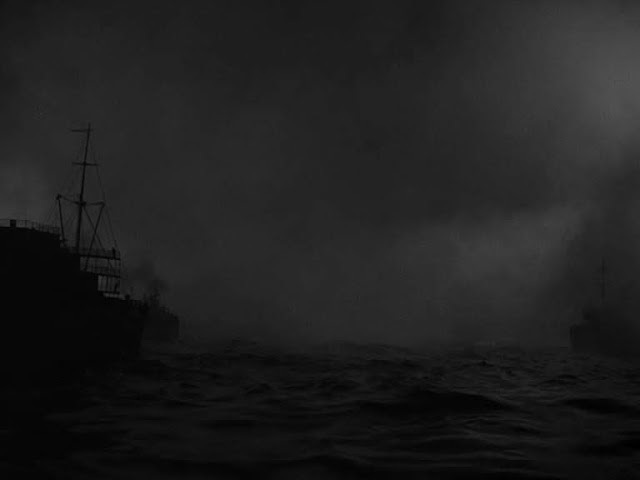 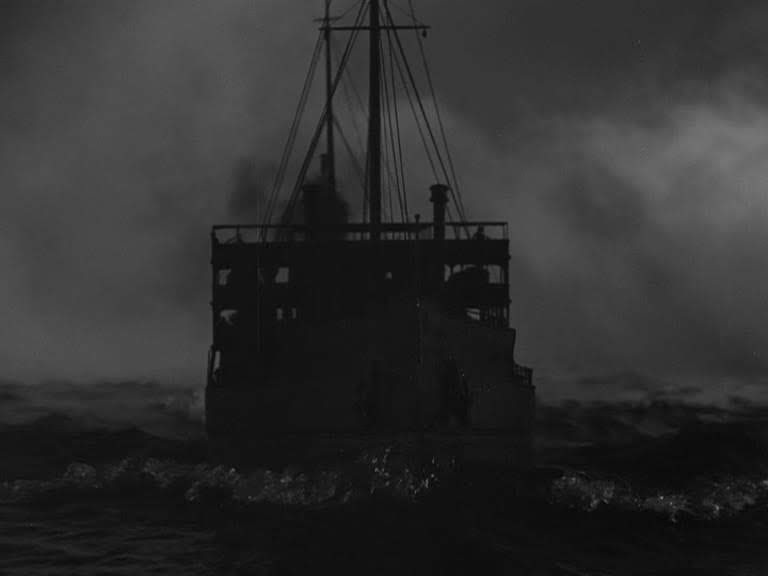 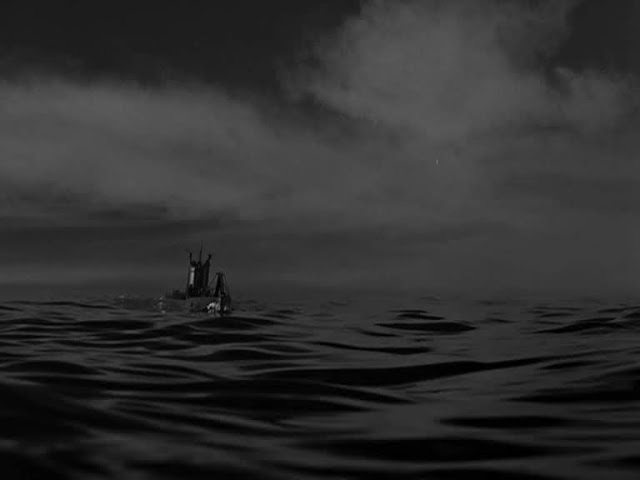 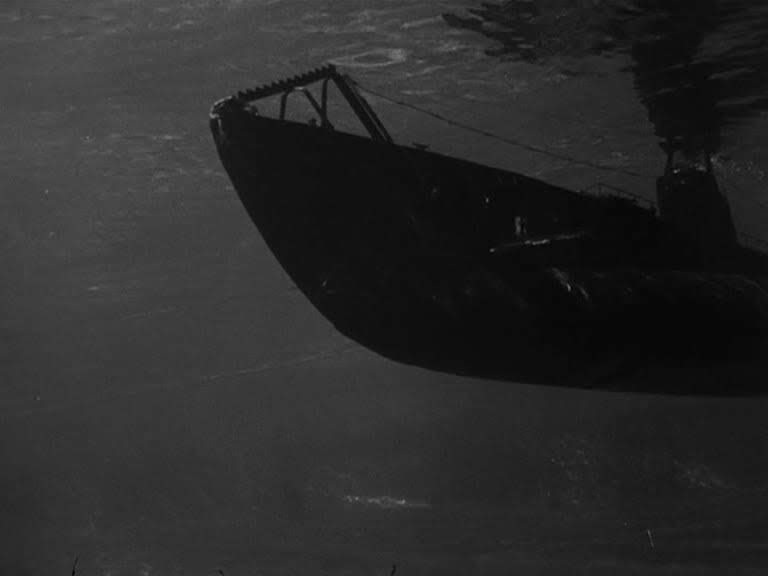 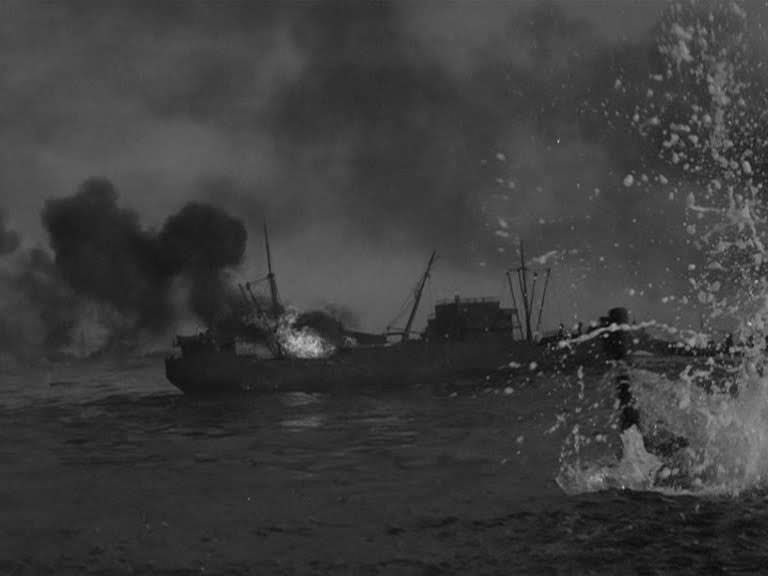 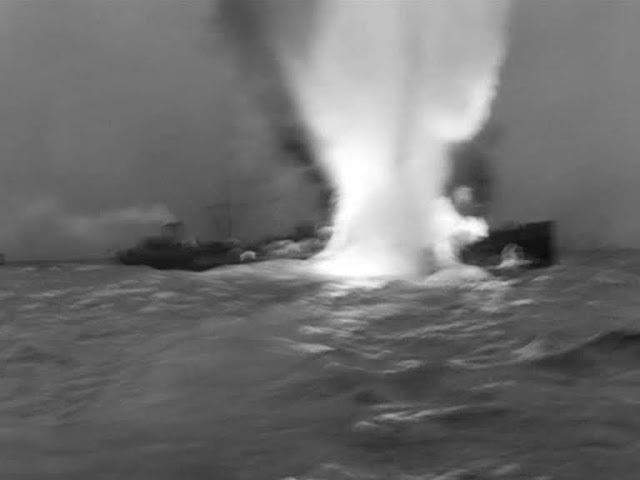 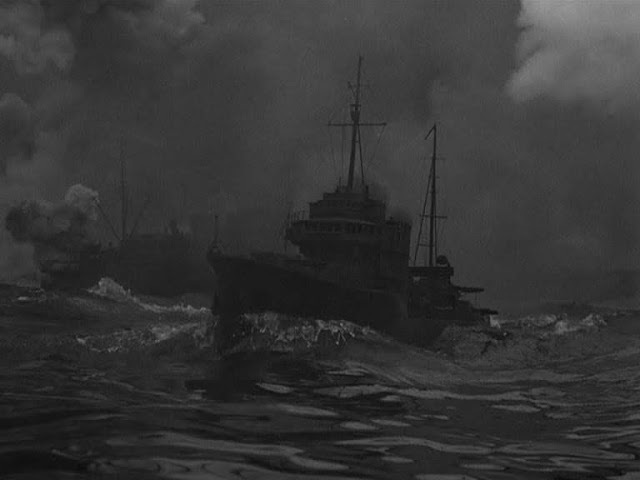 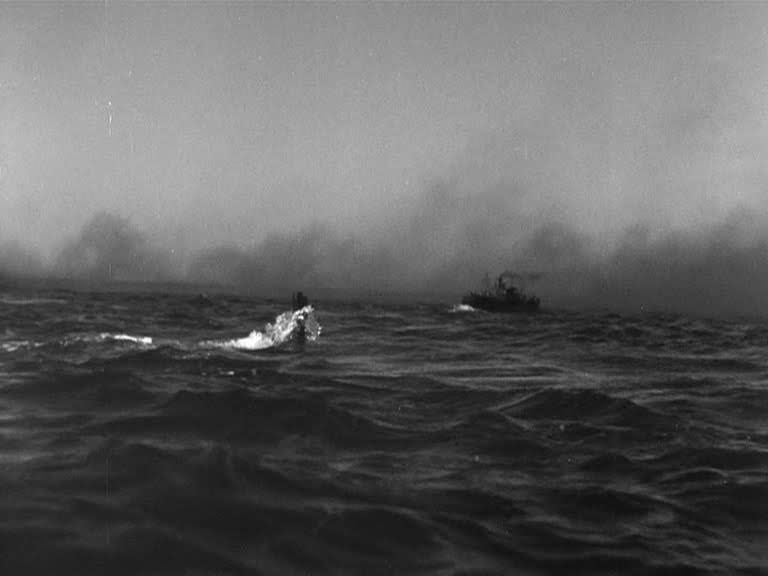 That early night time fiery conflagration in the Bogart film is a masterpiece in full scale physical effects, miniatures, process and rotoscoped figures jumping into flaming sea - the high point of the film. 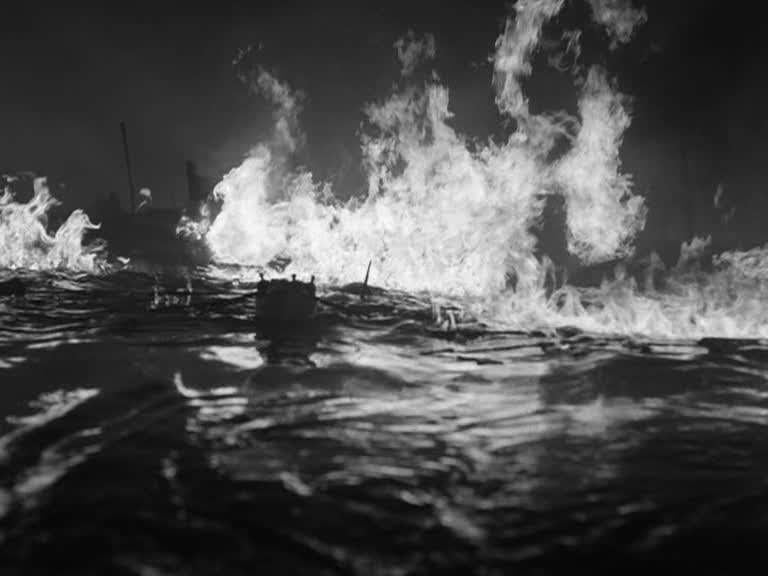 How the show missed out in the visual effects Oscar stakes is shameful..... but don't get me started on bloody Oscar injustices! 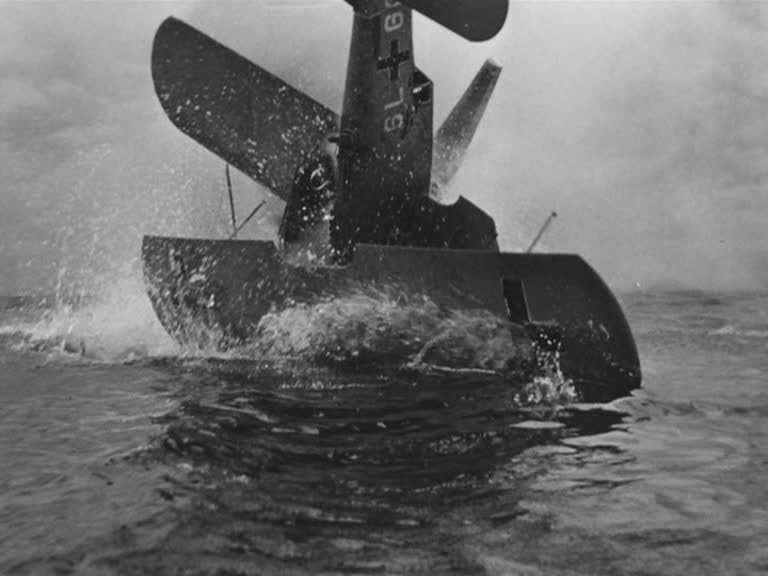 Thanks NZPete, one of the shots that stands out for its shock value is of the miniature sailor figures being sucked through the propeller. 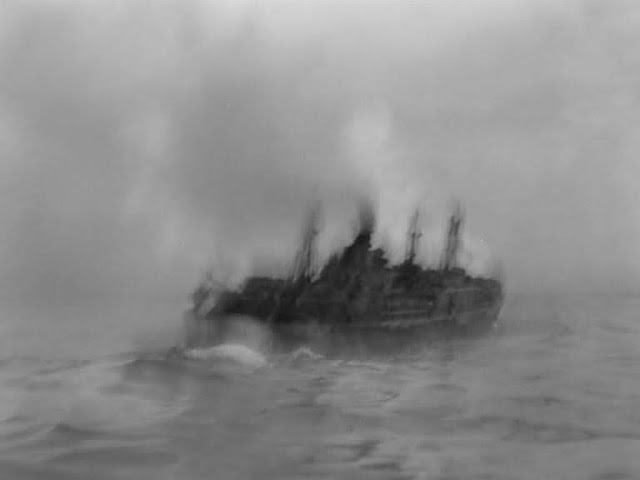 Oddly enough Byron Haskin in the interview book was quite dismissive of Action in the North Atlantic. He talked rather disparagingly of Jack Cosgrove shooting lots of spectacular shots without any feeling for progressing a story. 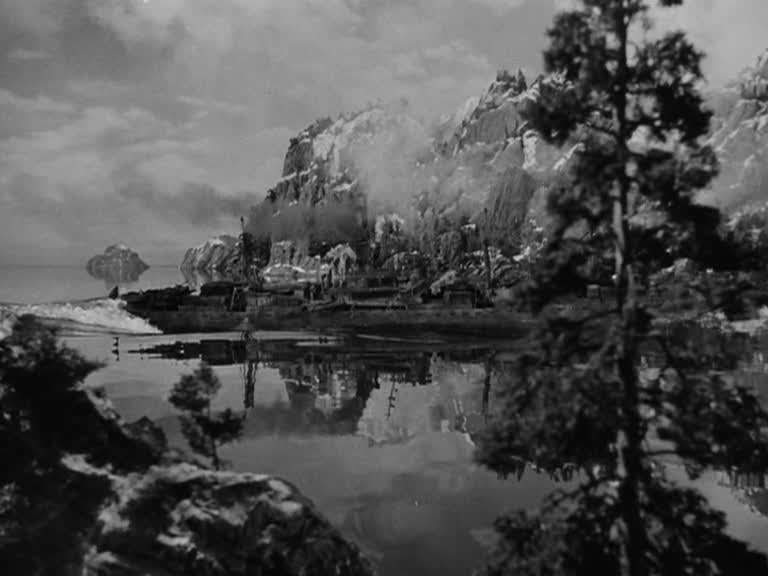 However I think Byron was more interested in talking about his directorial career than his special effects career. 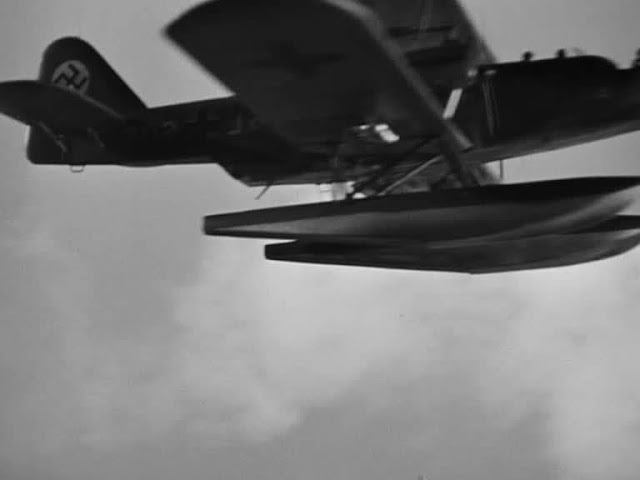 He said he took over direction of the movie after the director Loyd Bacon quit with only half the film shot. 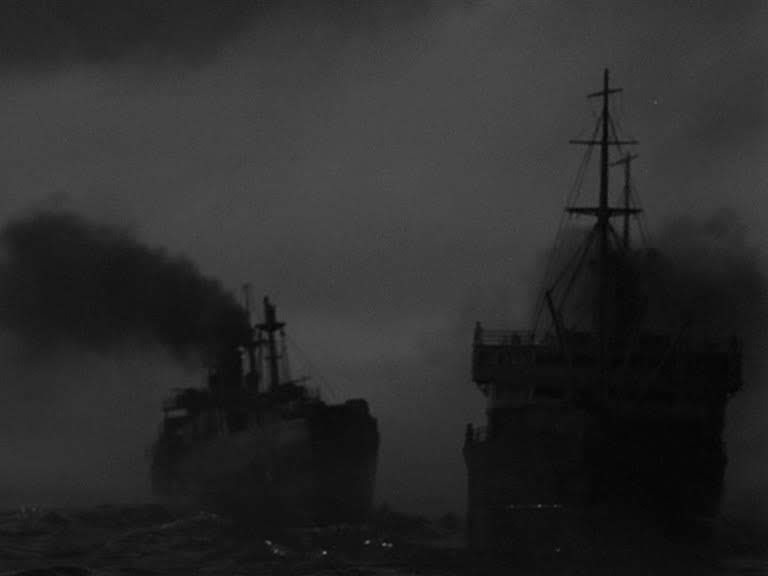 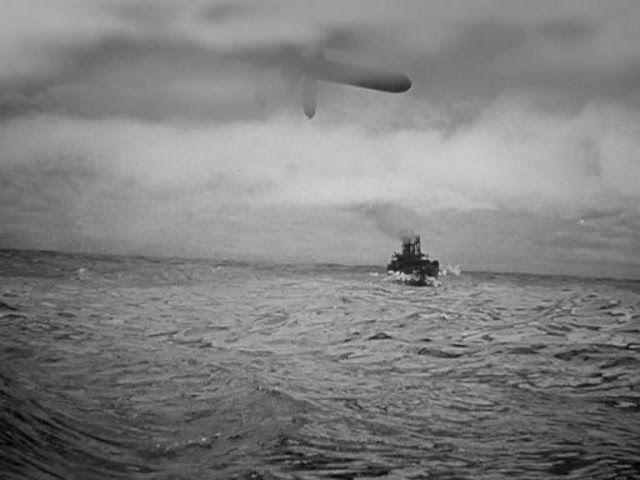 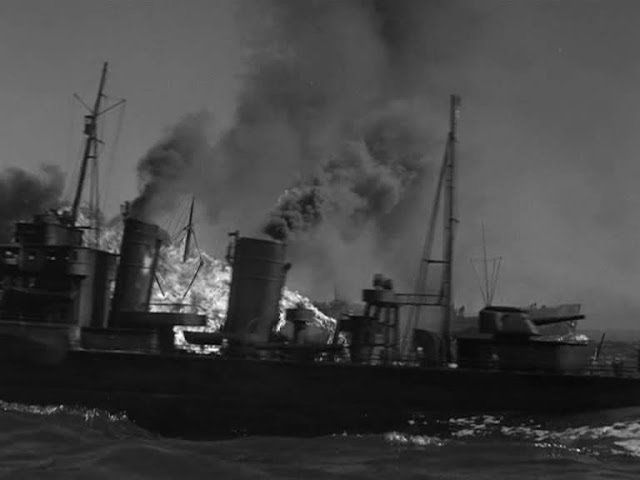 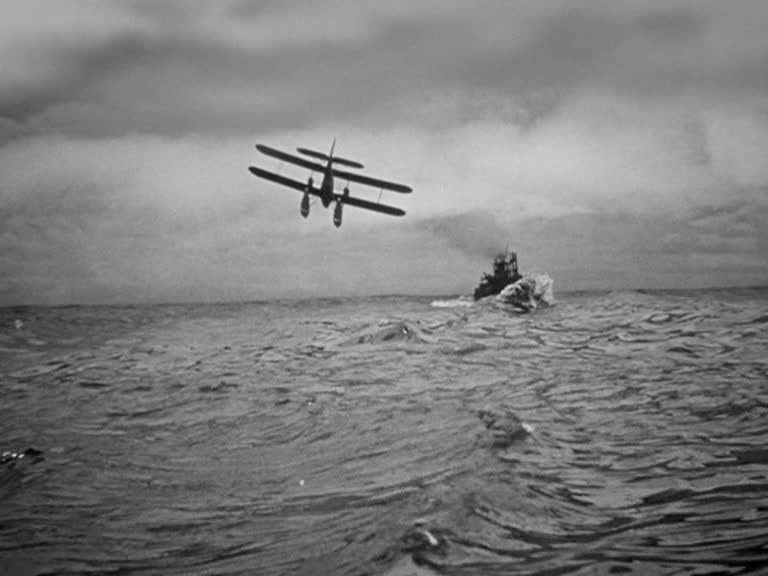 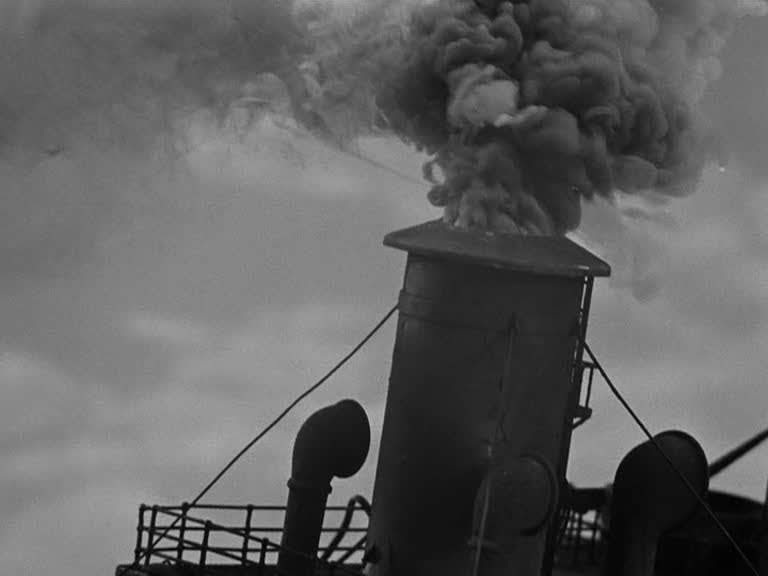 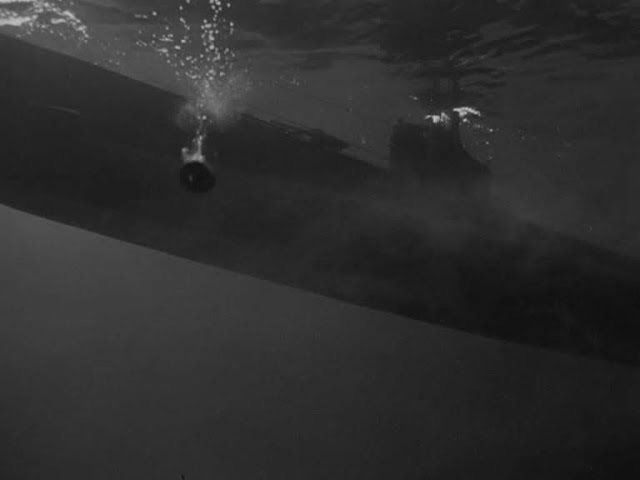 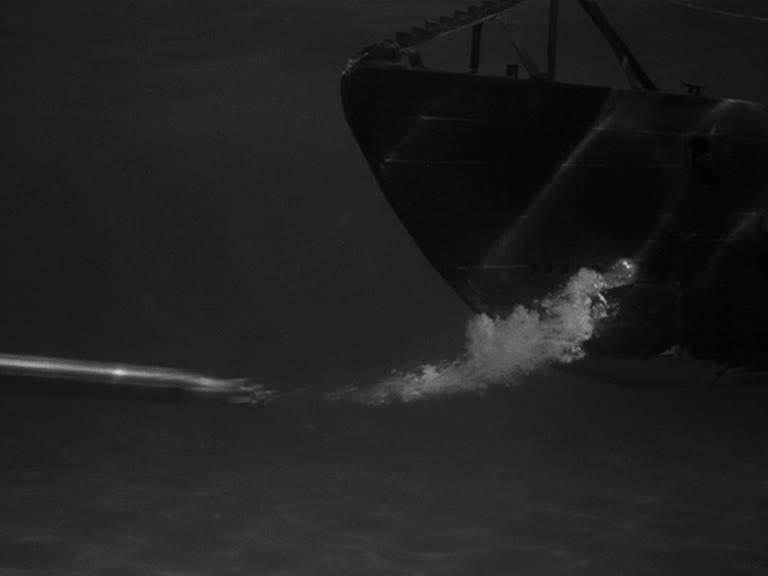 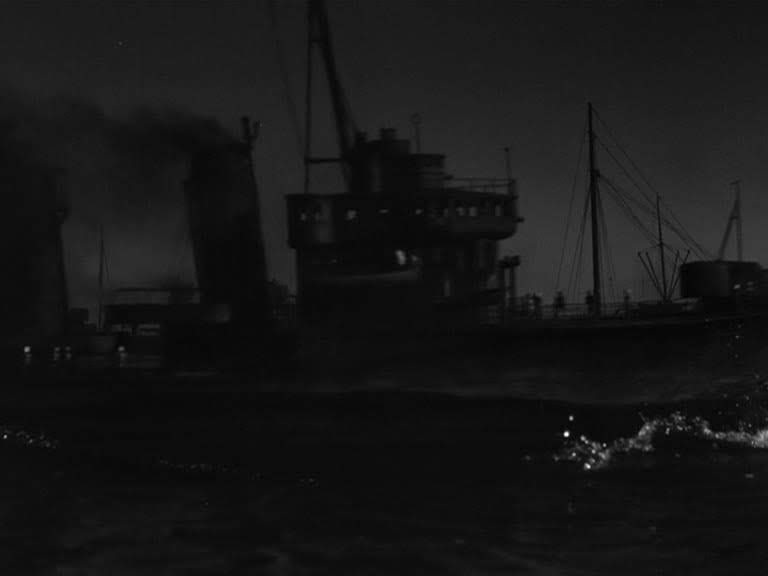 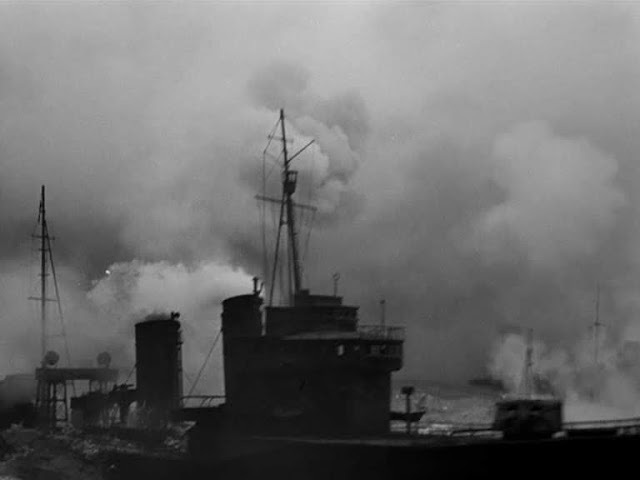 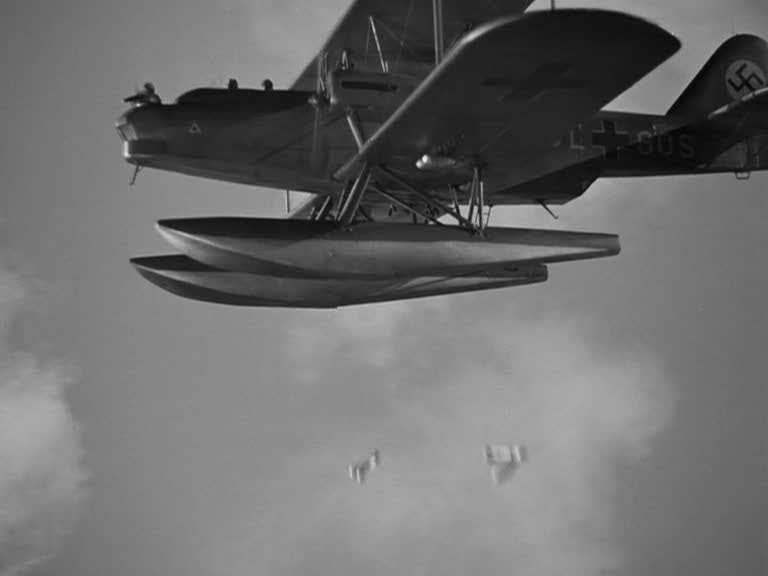 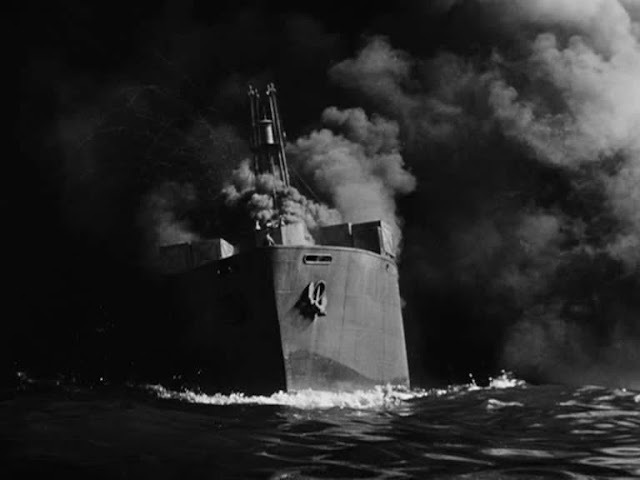 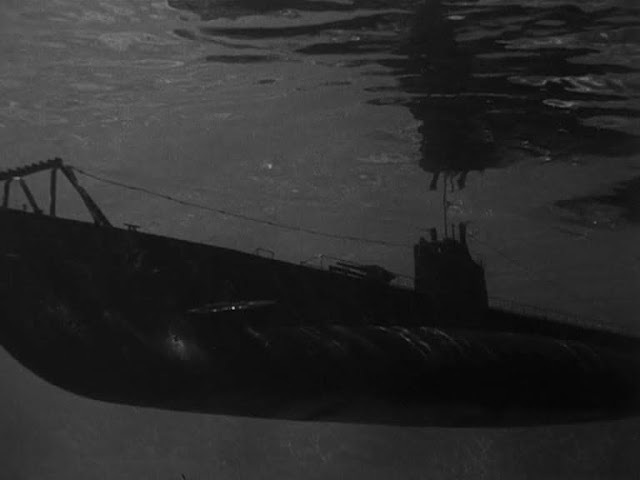 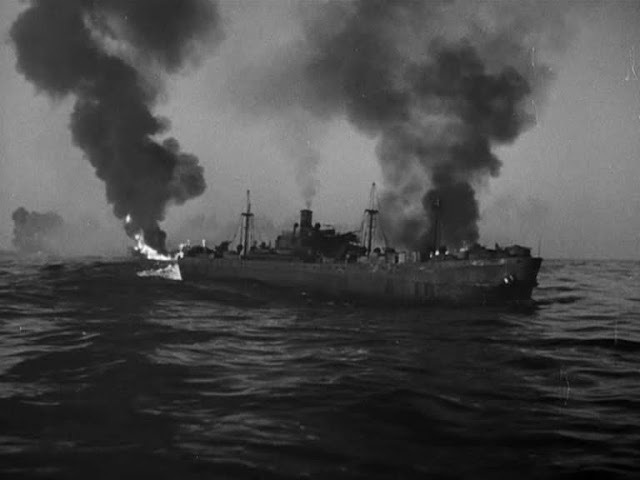 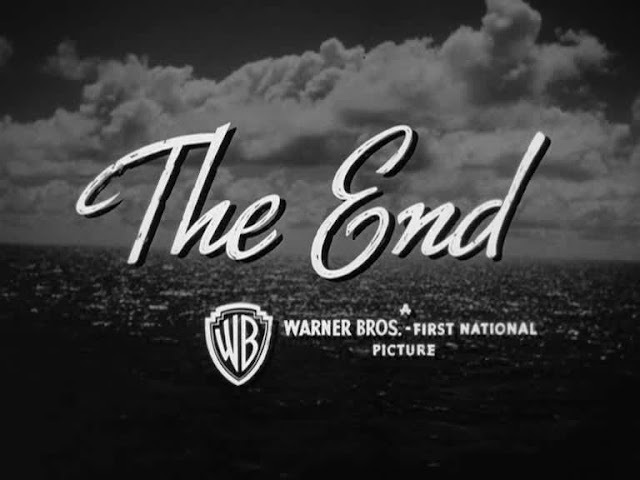 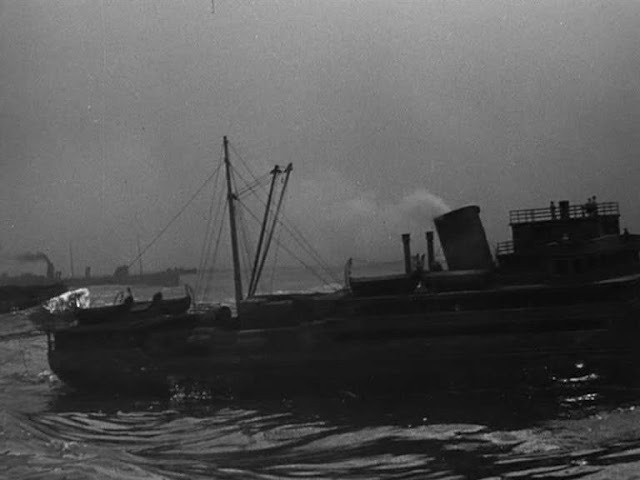 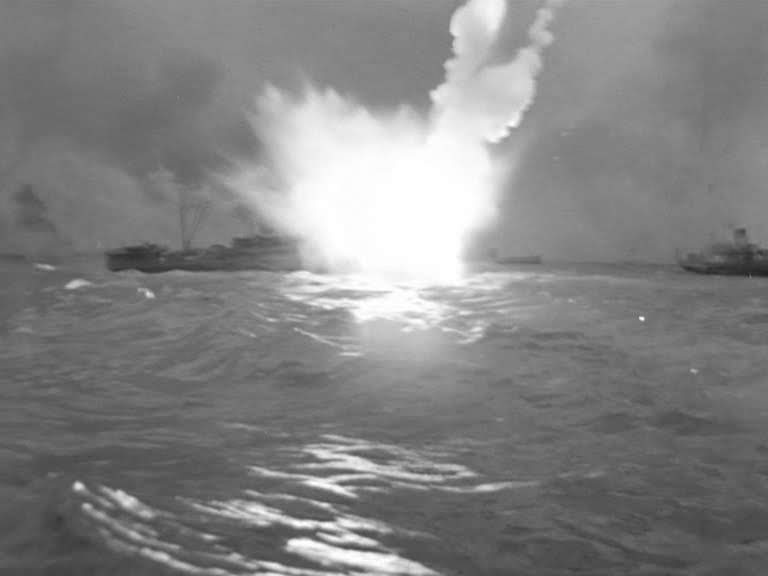 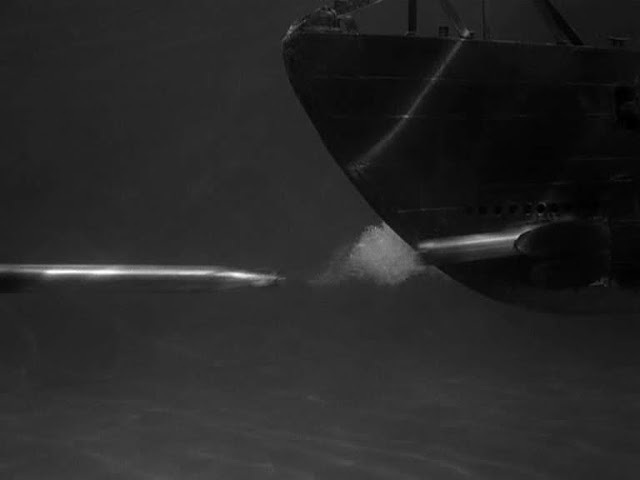 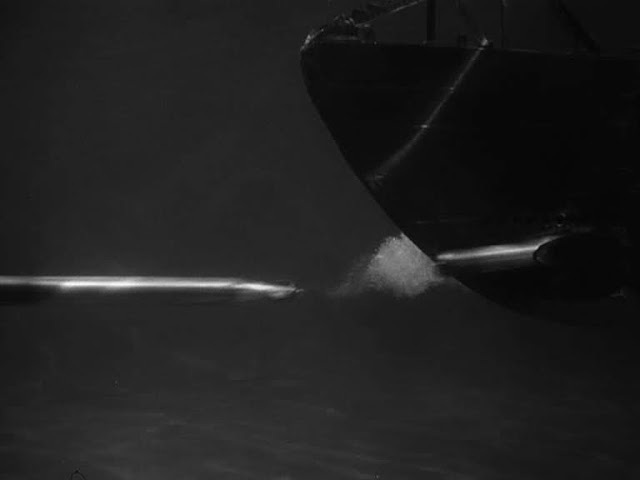 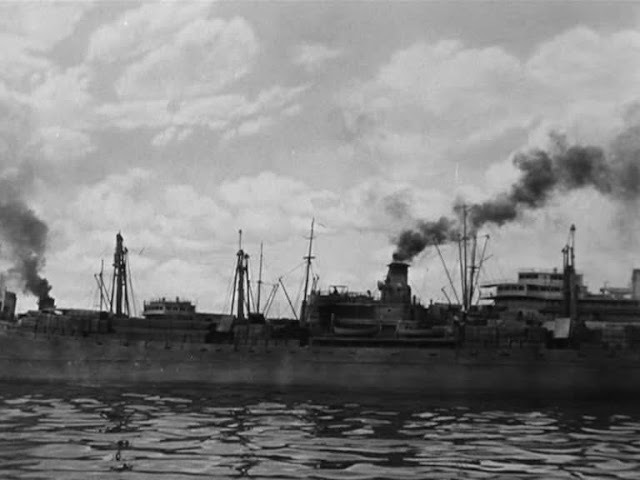 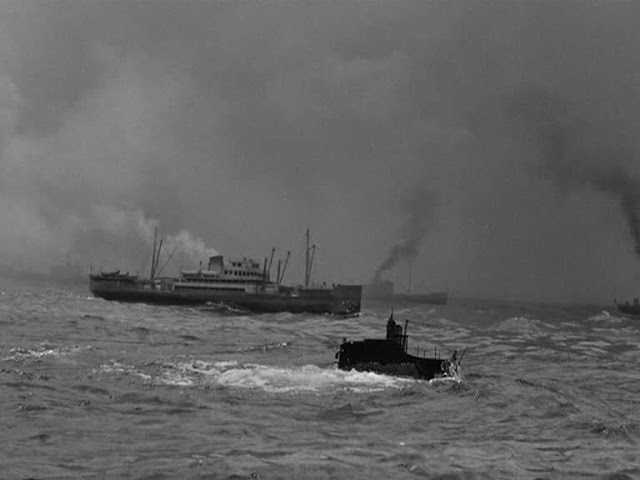 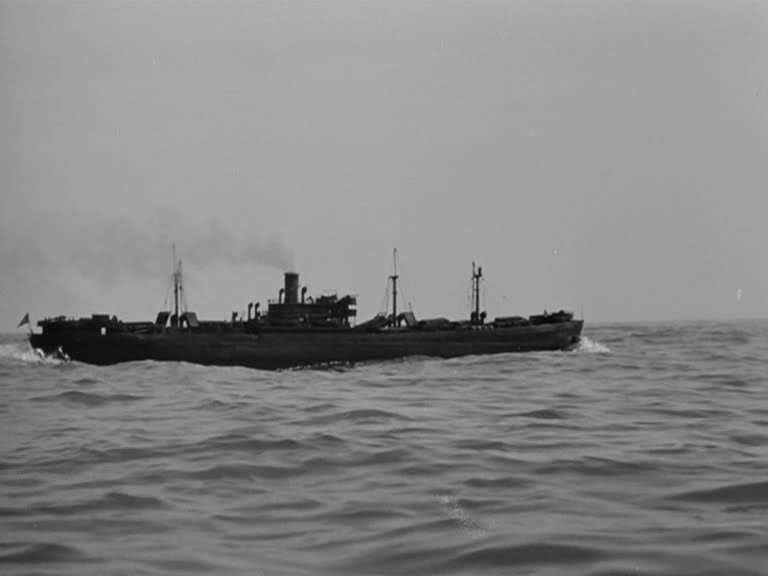 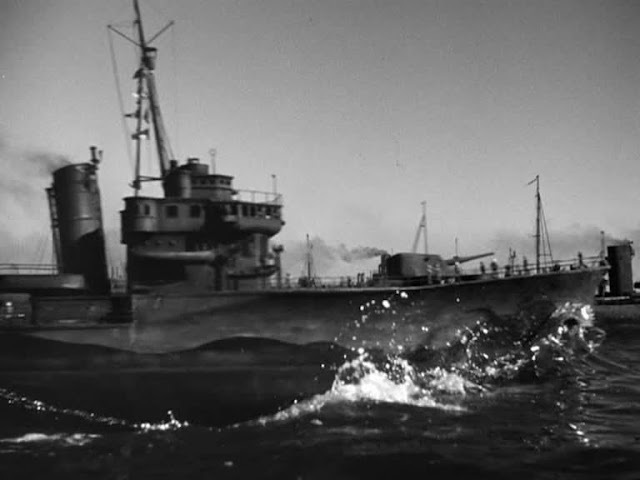 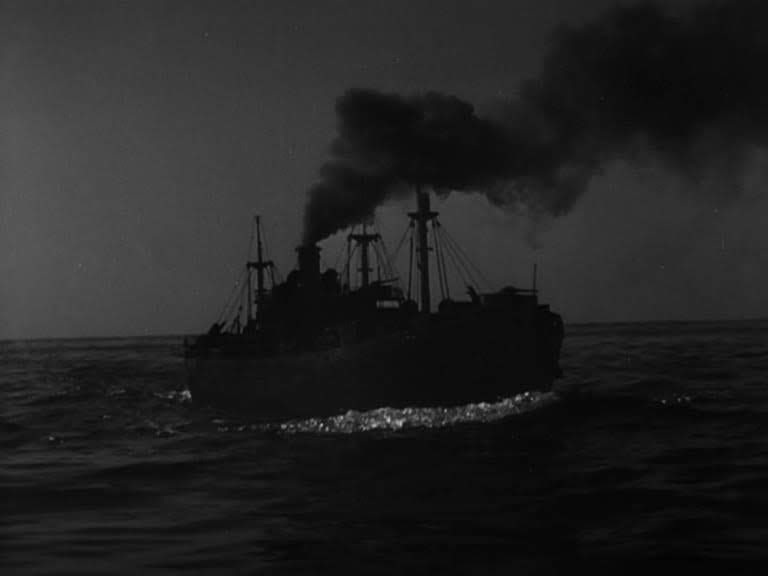 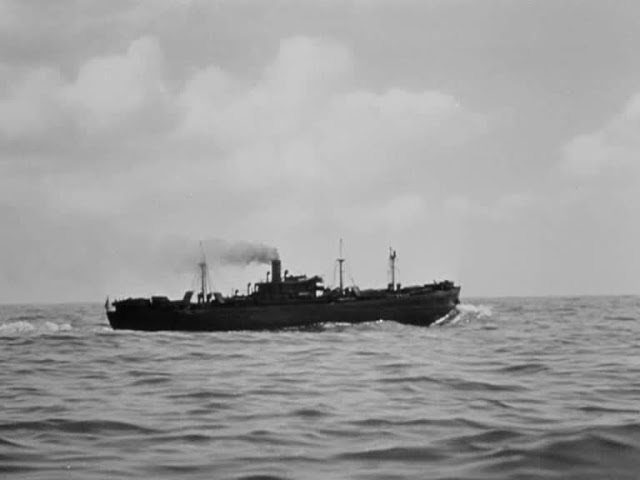 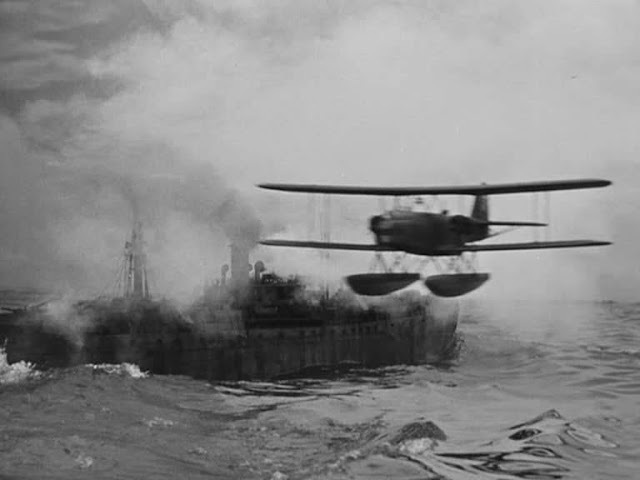 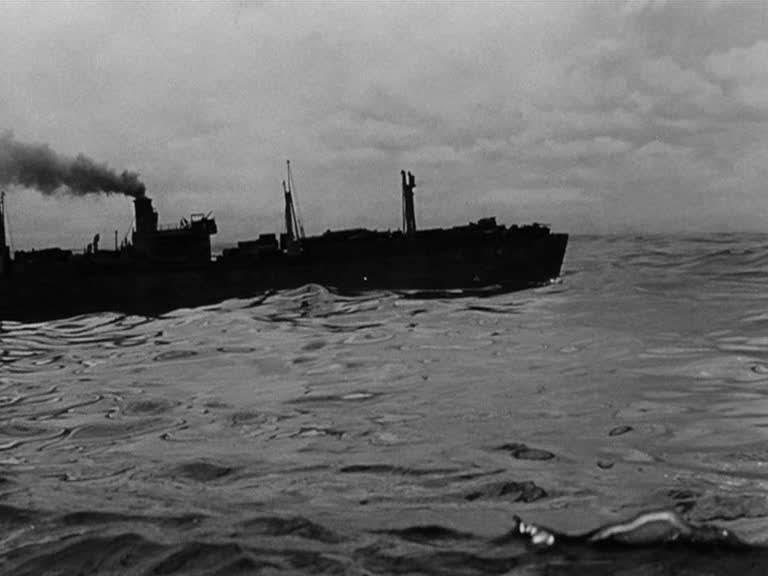 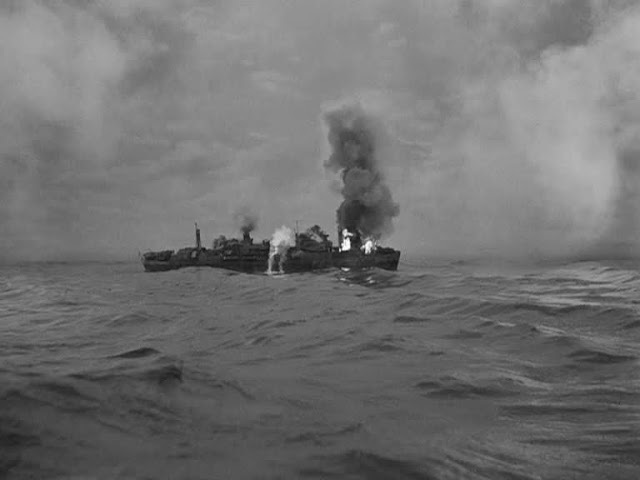 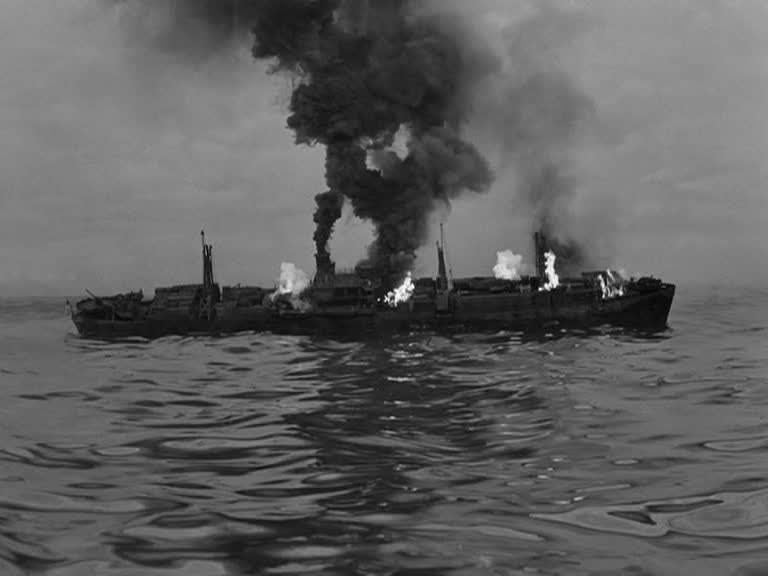 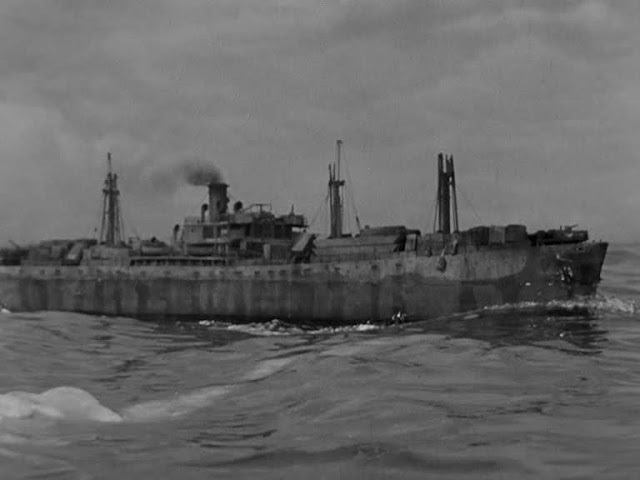 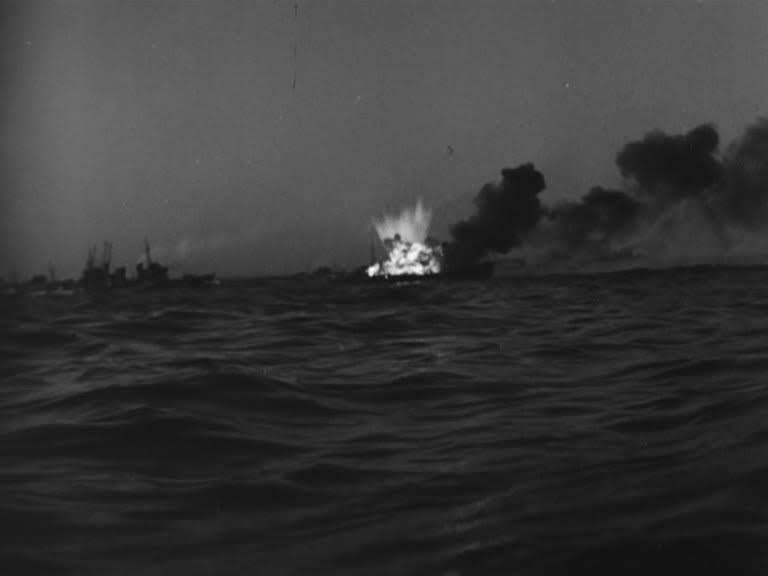 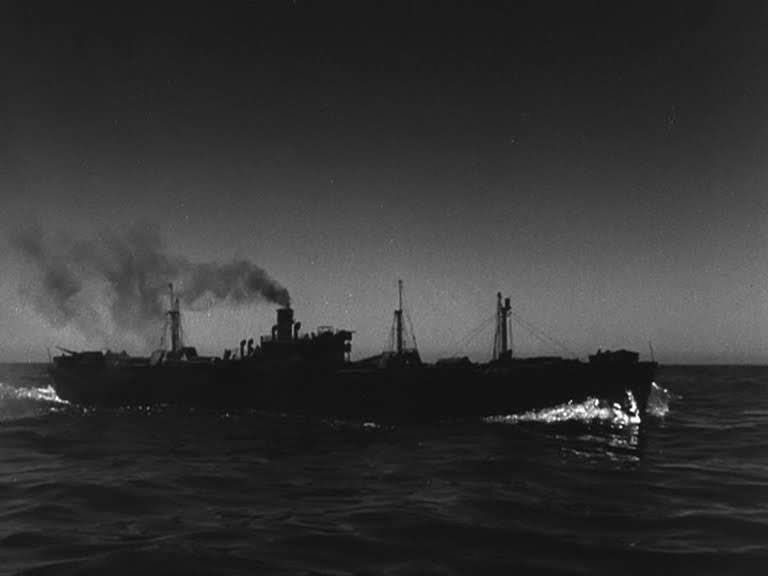 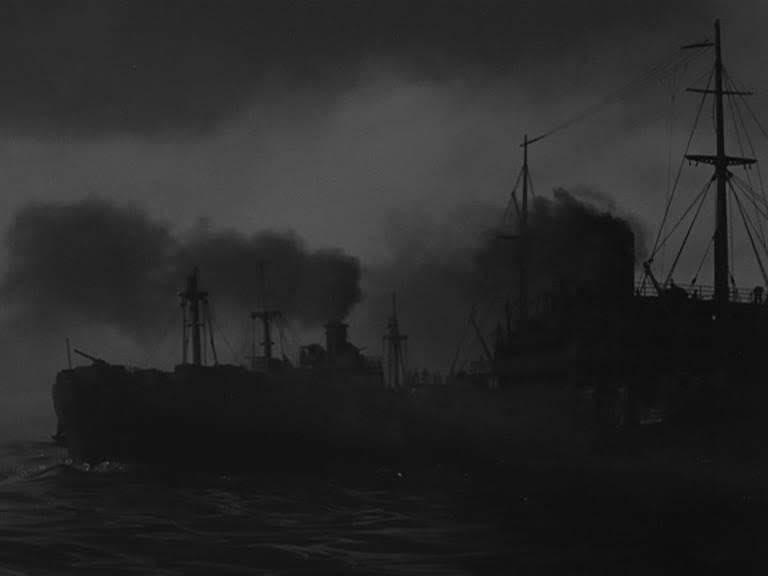 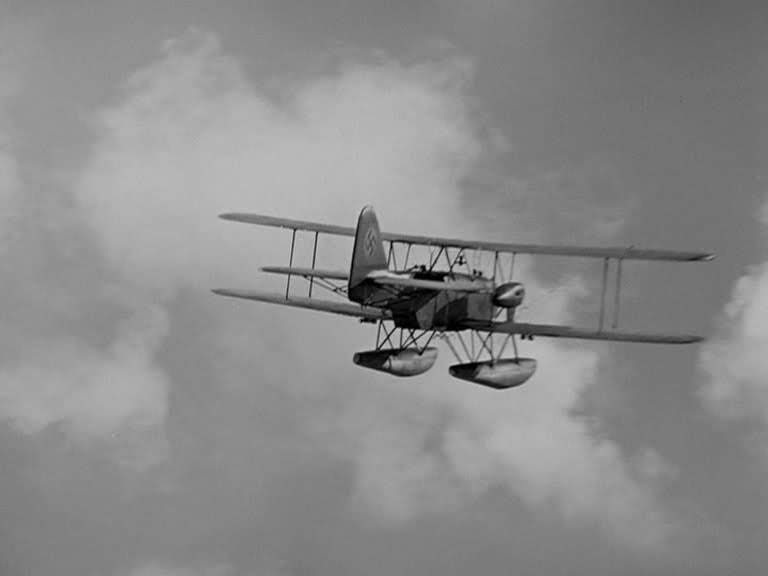 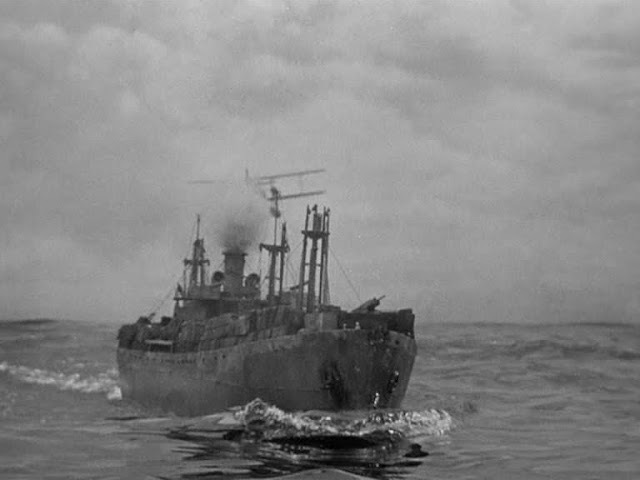 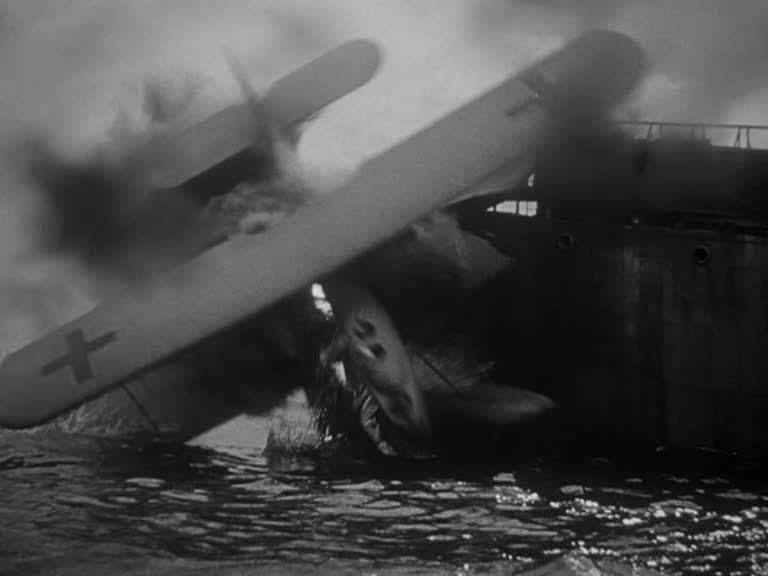 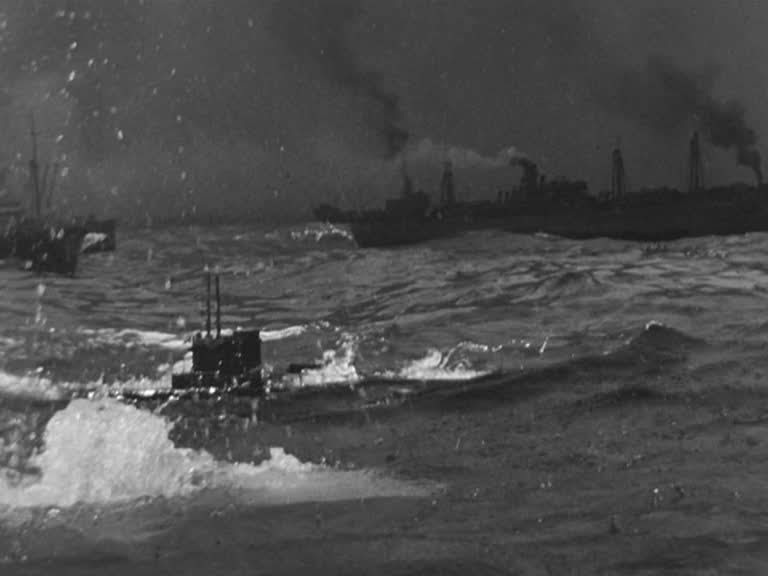 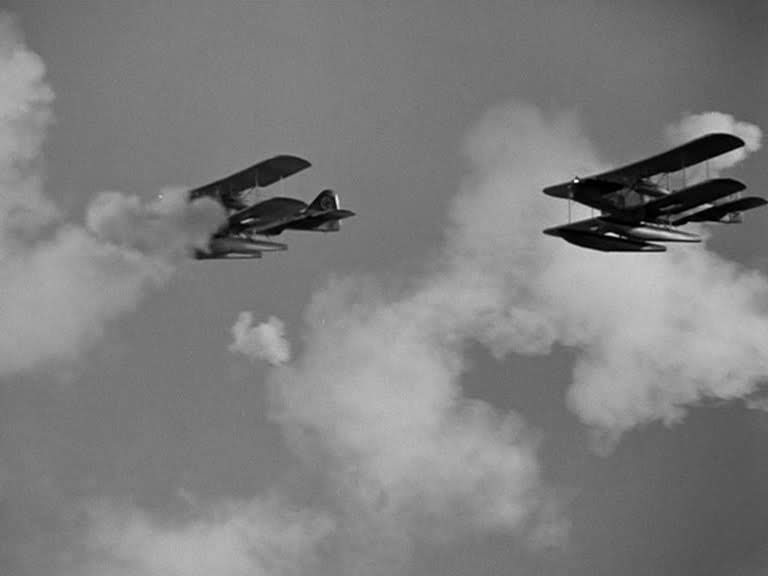 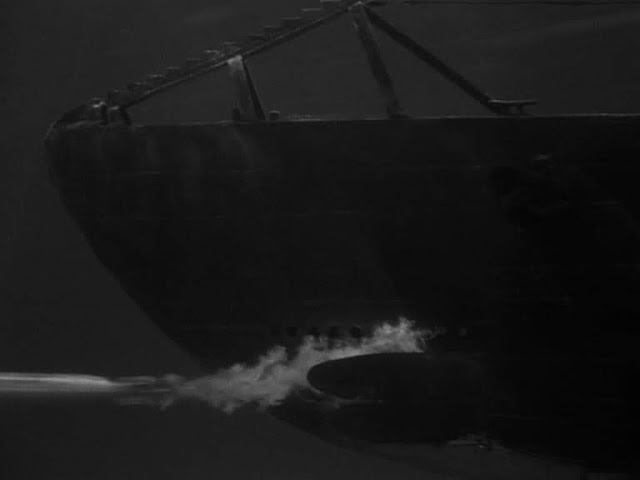 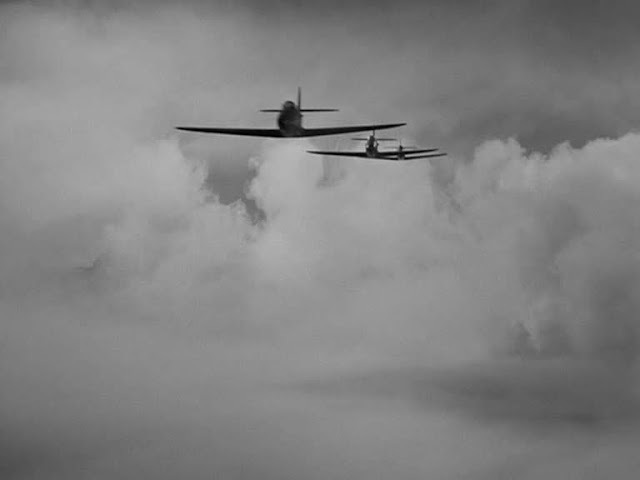 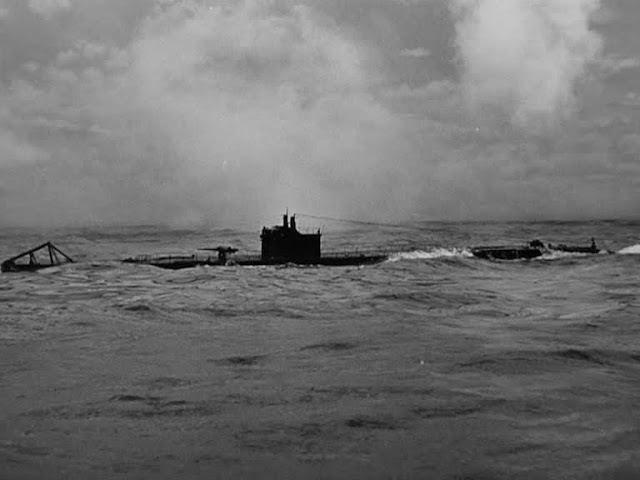 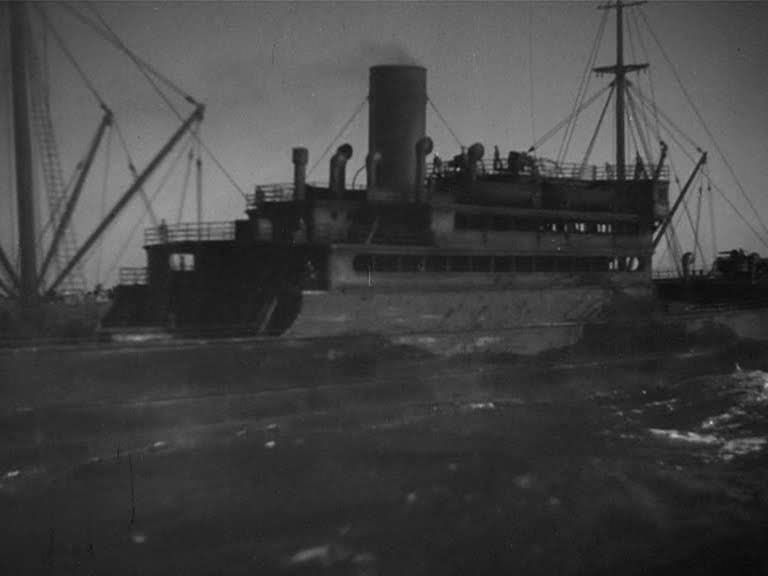 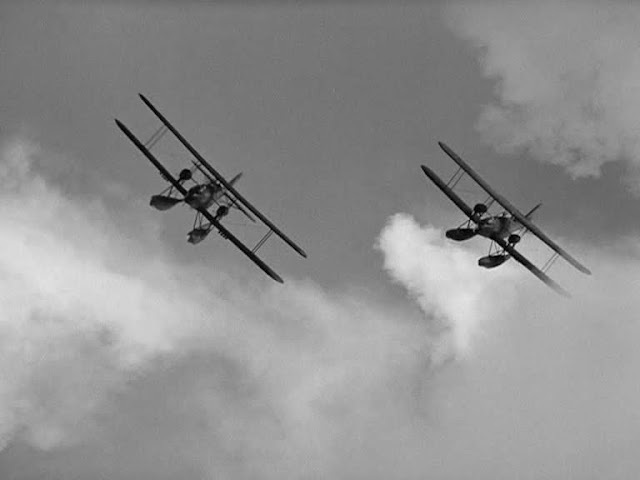 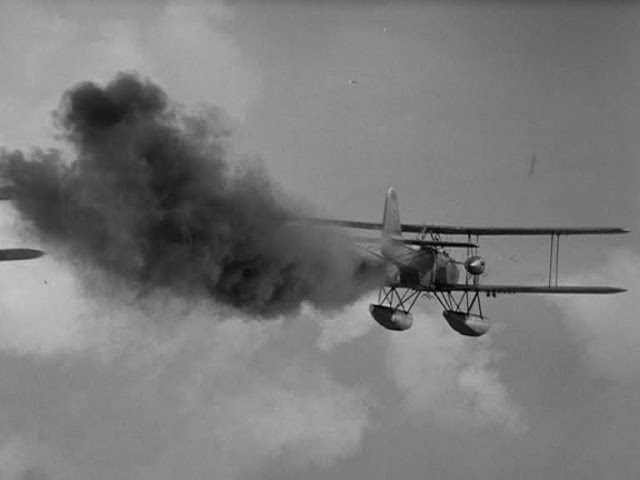 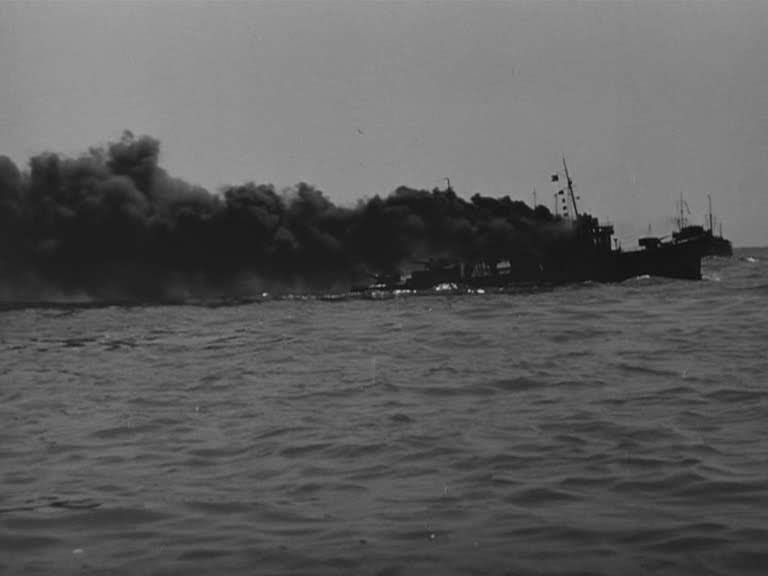 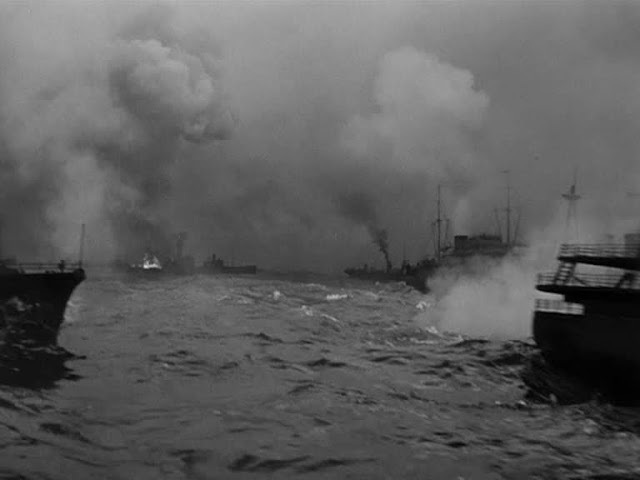 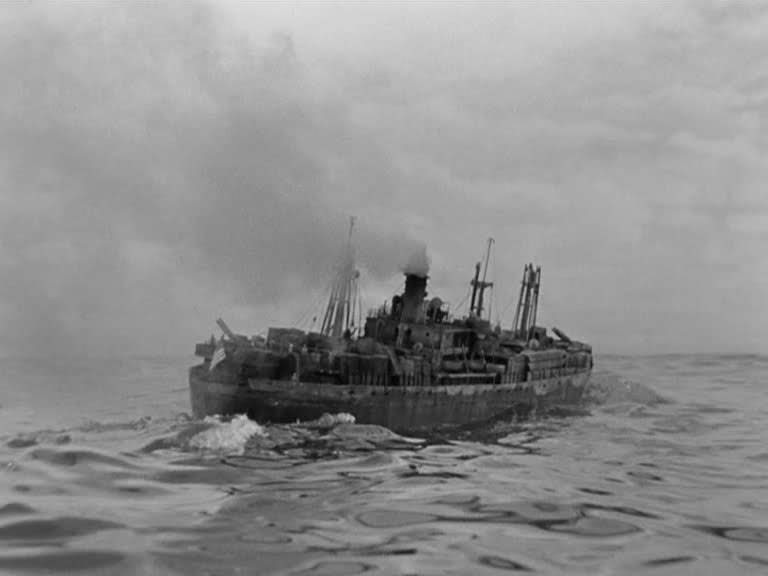 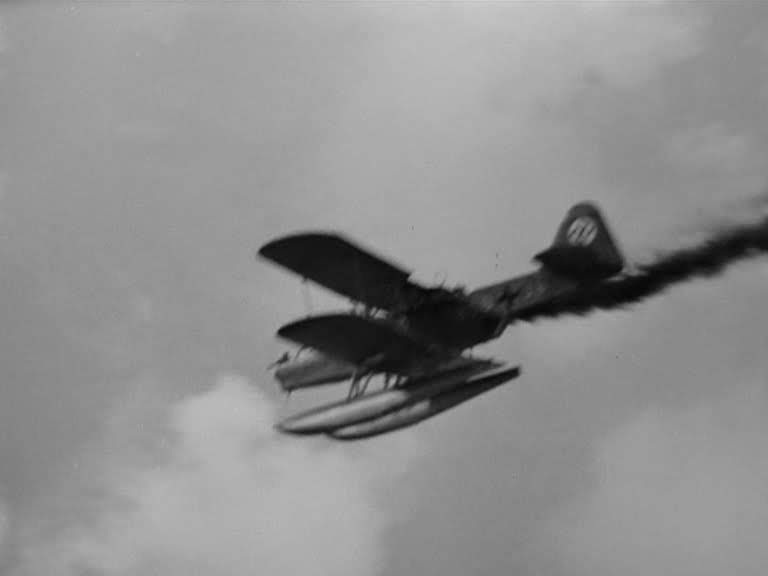 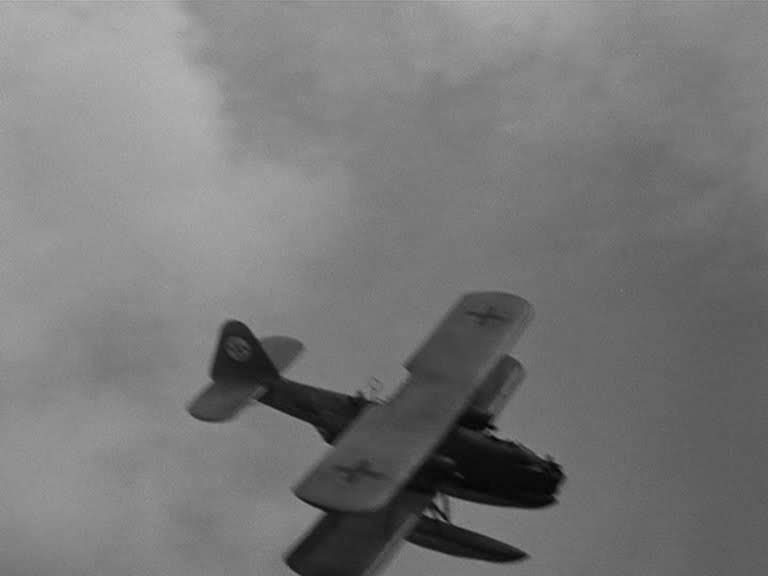 Loyd Bacon was having a contract dispute with Warners at the time and spent nearly the entire budget on the tanker set which is set alight at the beginning of the film. 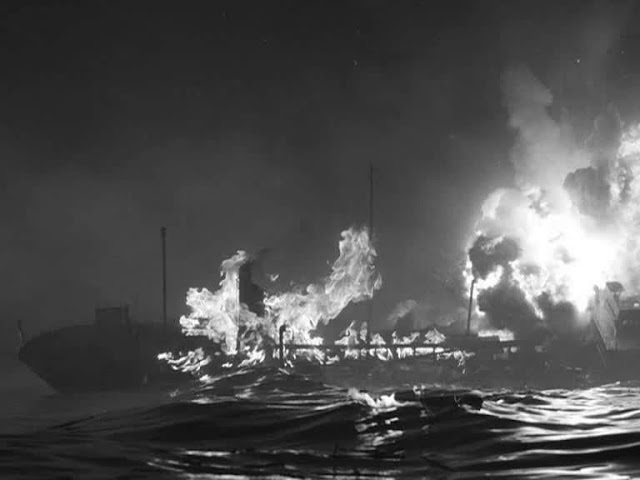 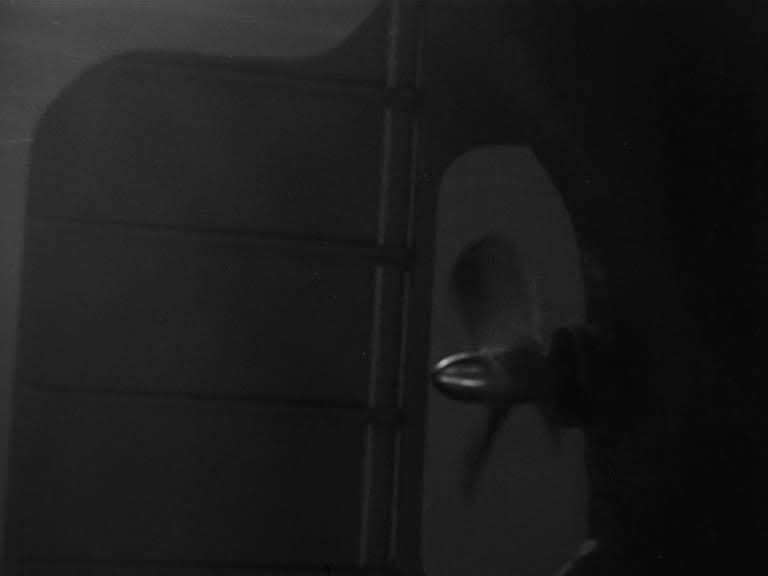 The gas flames were so fierce the rising heat ignited the roof of the stage and caused quite considerable damage. 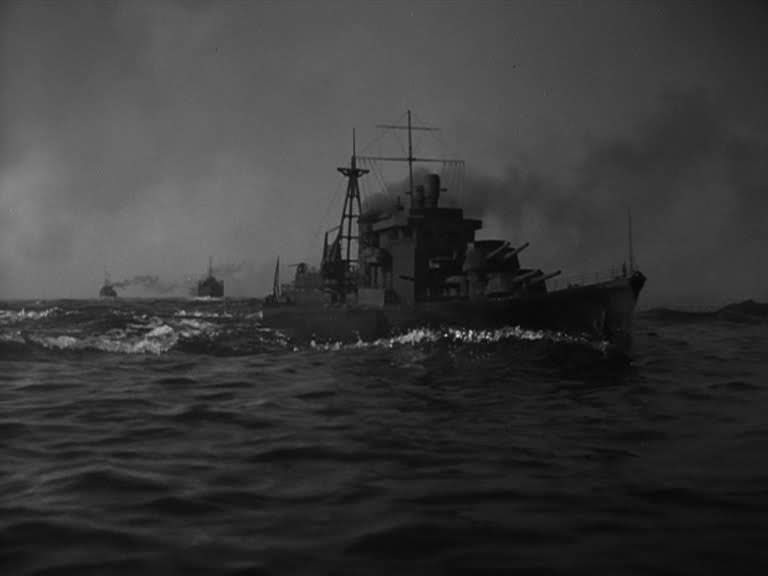 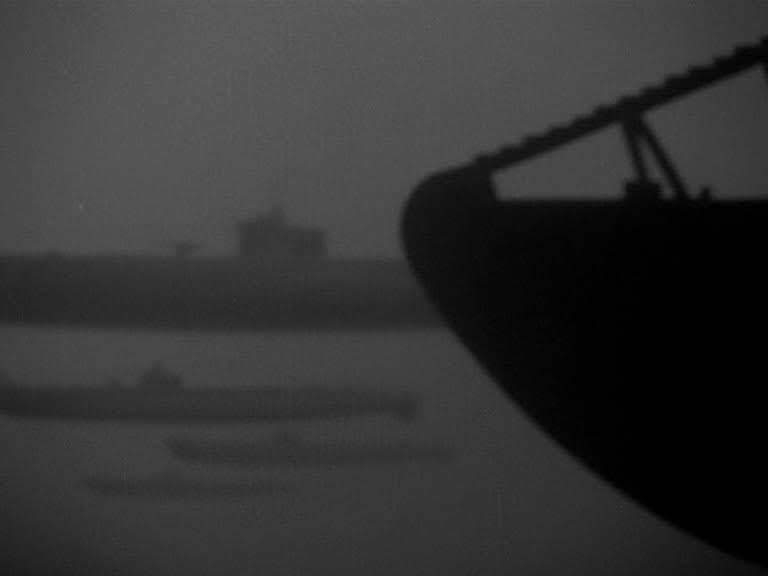 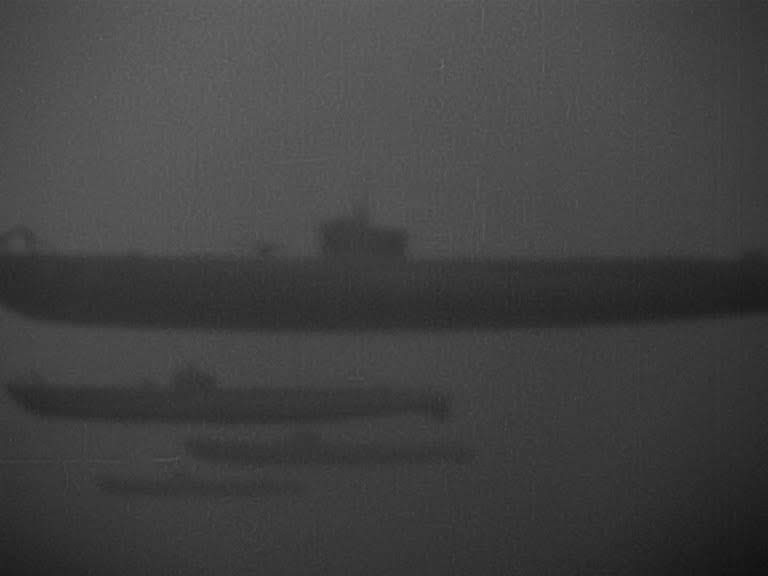 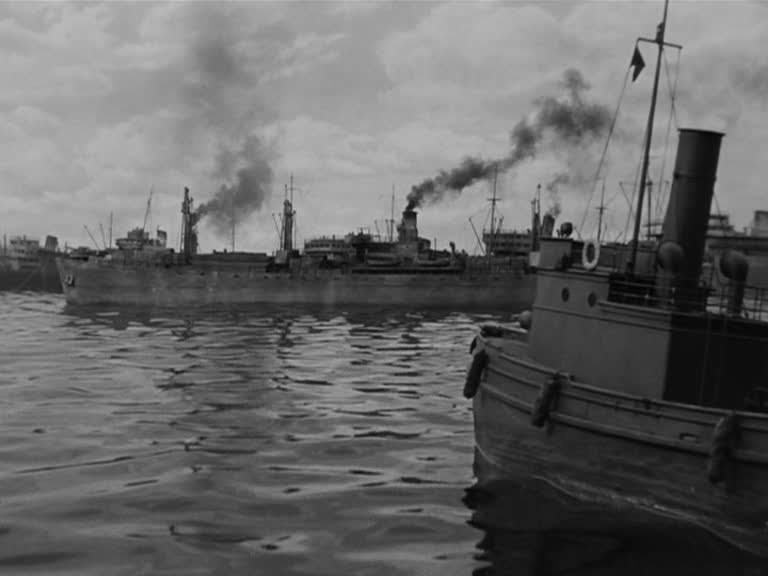 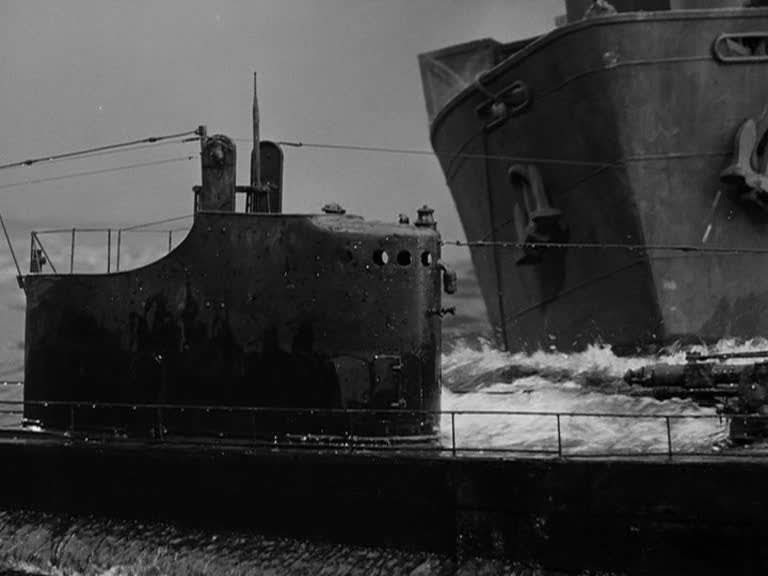 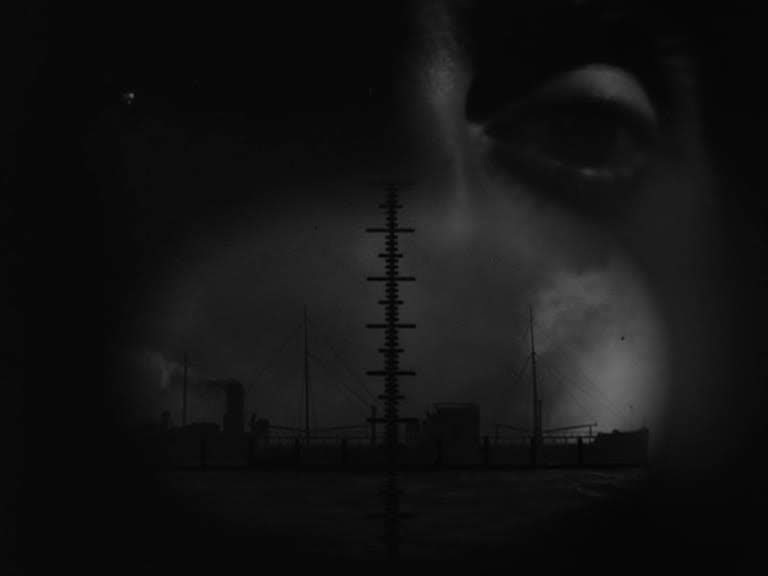 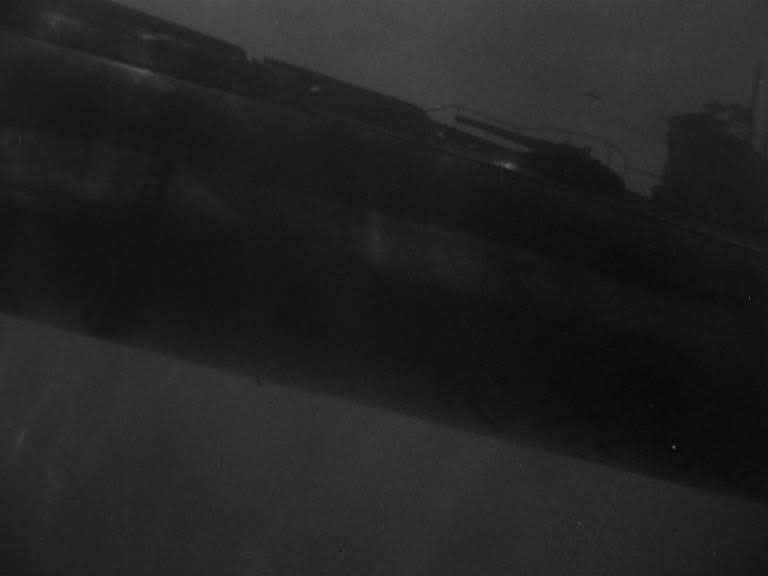 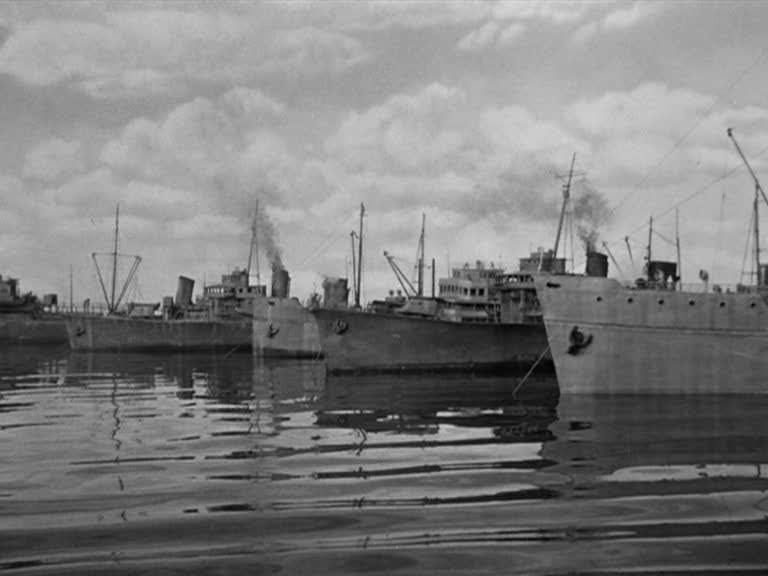 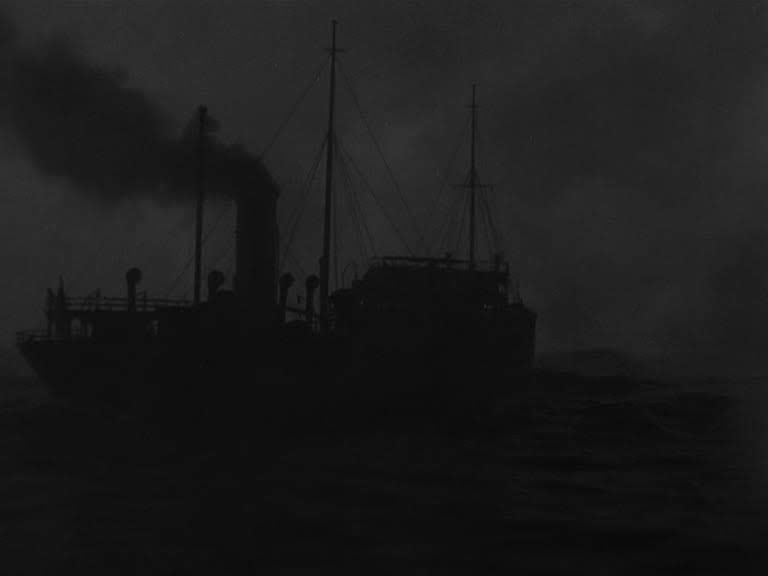 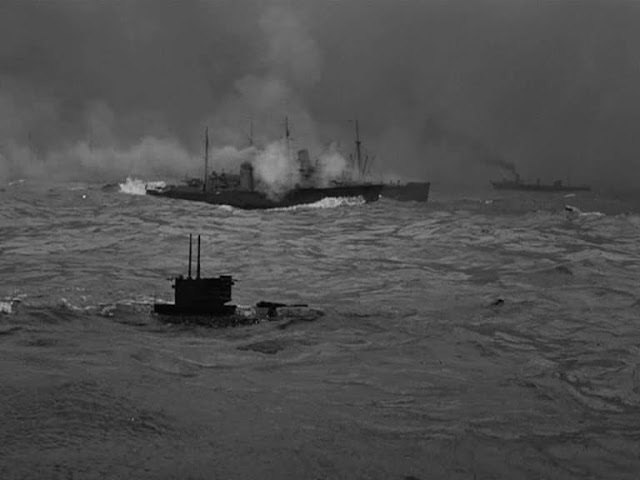 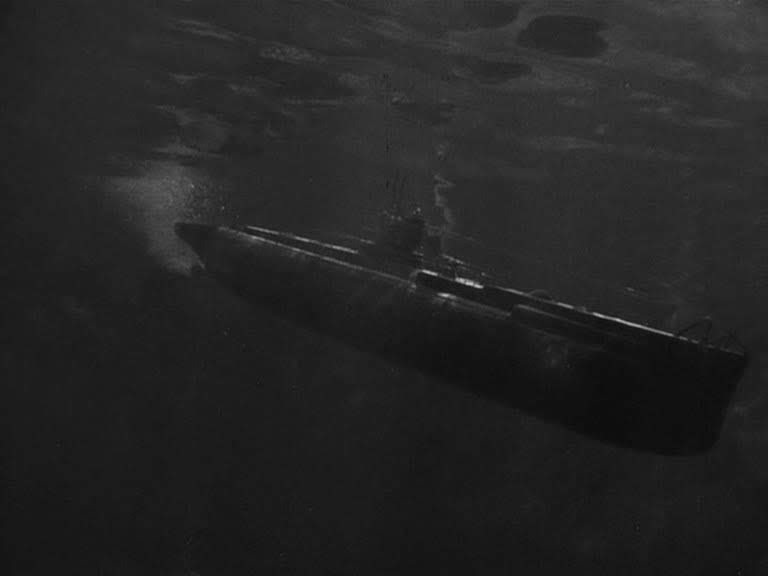 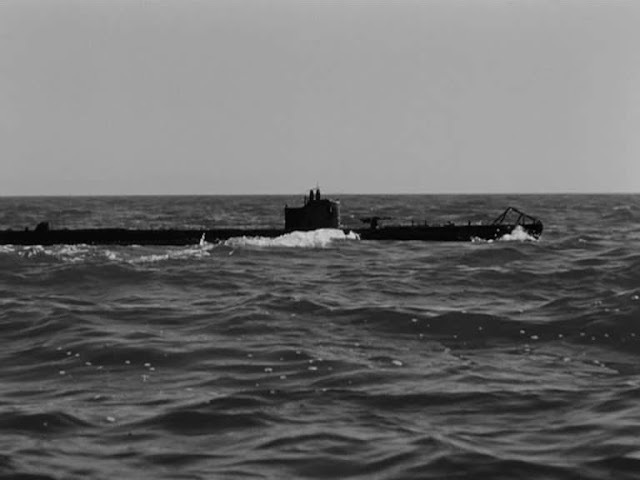 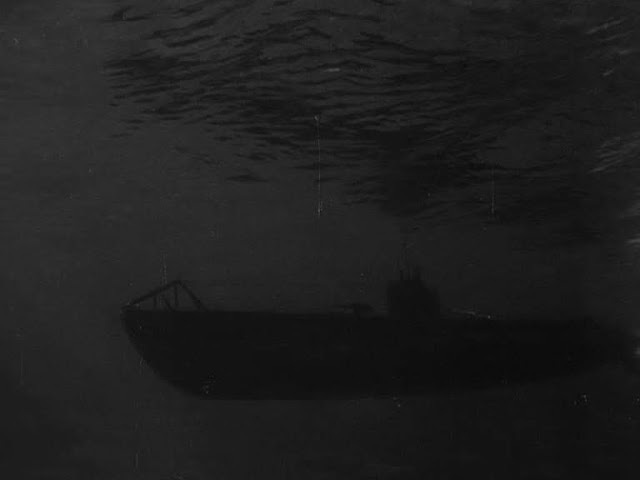 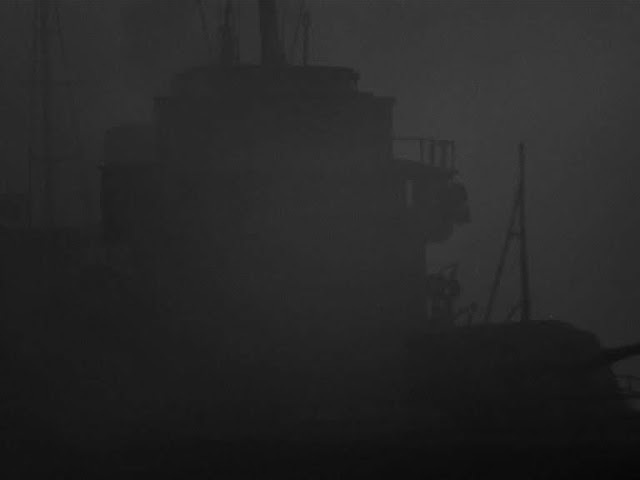 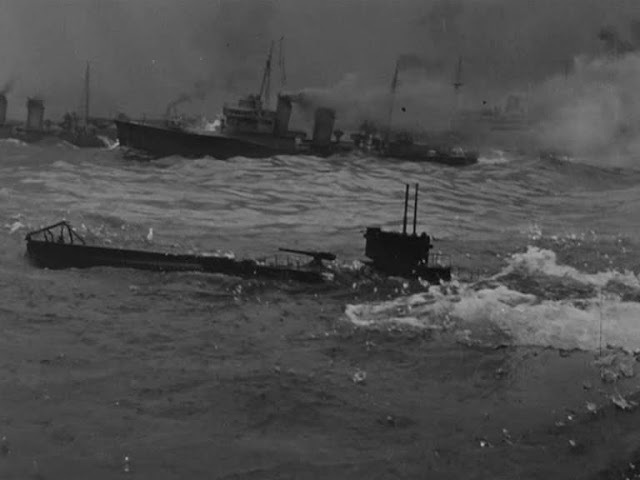 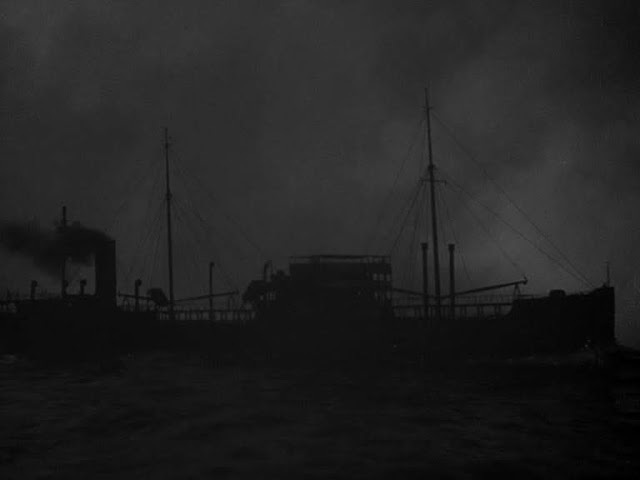 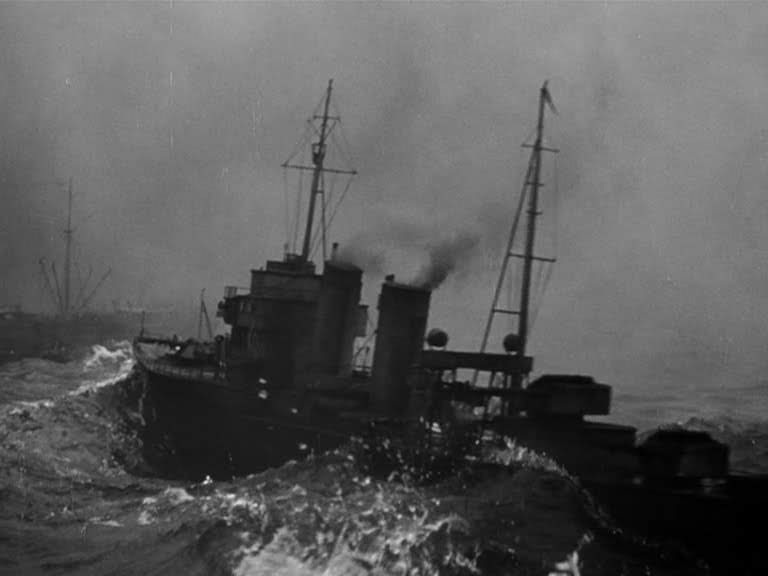 Were some of the warships borrowed from another film? 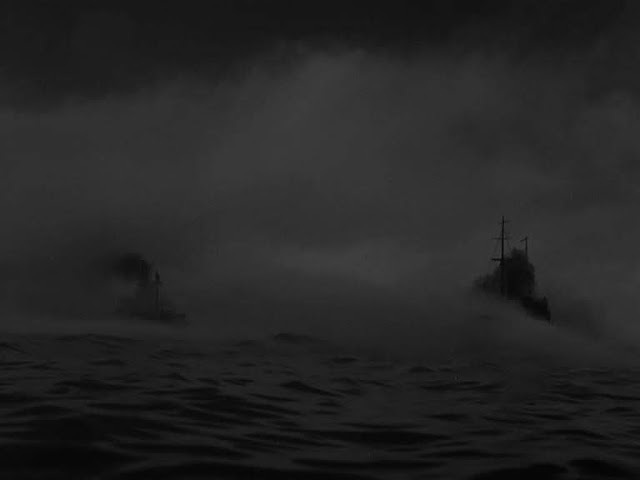 They look like Japanese cruisers and destroyers. 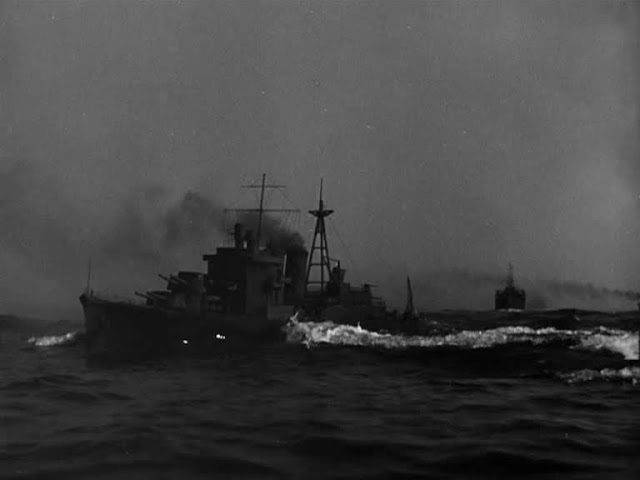 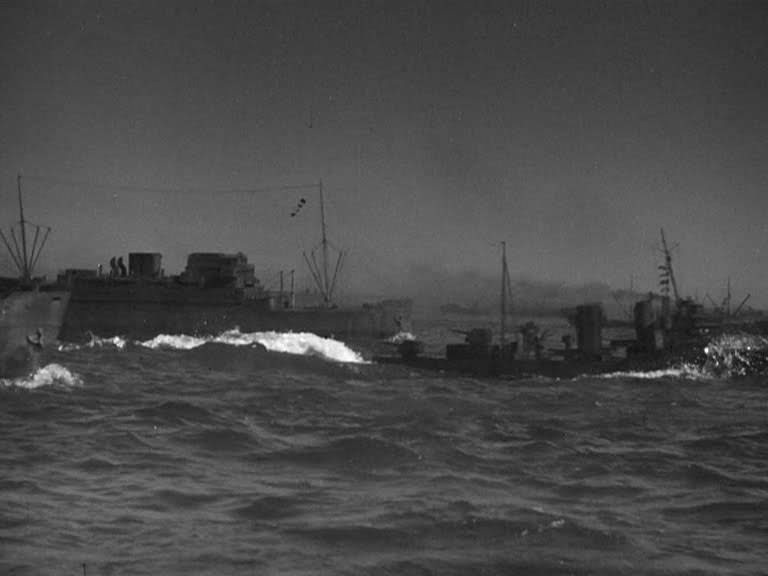 Definitely Japanese destroyer (Akatsuki Class). 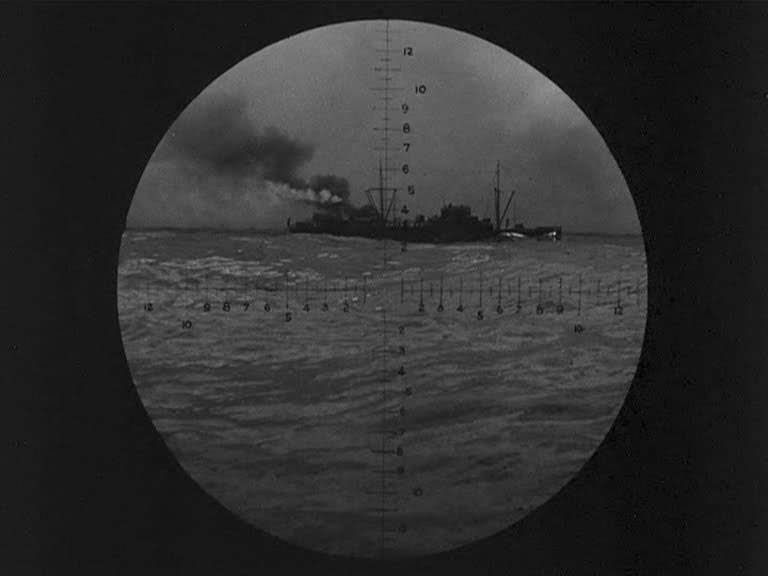 Alas, not a particularly good rendering, though I suppose adequate for the wartime audiences. 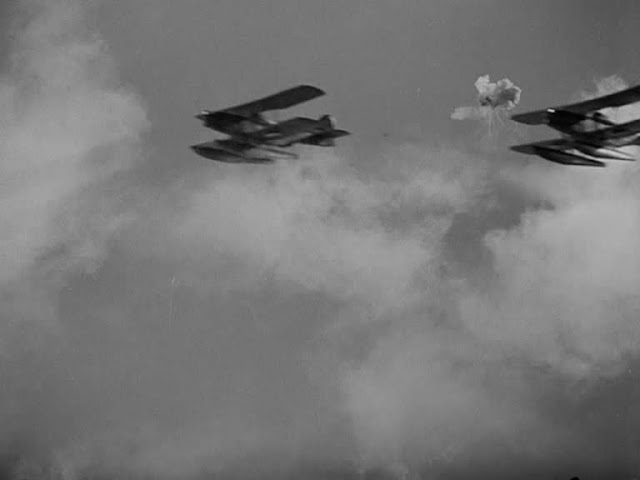 Perhaps the models were used earlier, perhaps in "Air Force?"